2014 has come and gone in the blink of an eye- so fast and so packed that it seems like just yesterday that I browsed through millions of photos of sensational dishes that I ate in 2013 for my previous post. 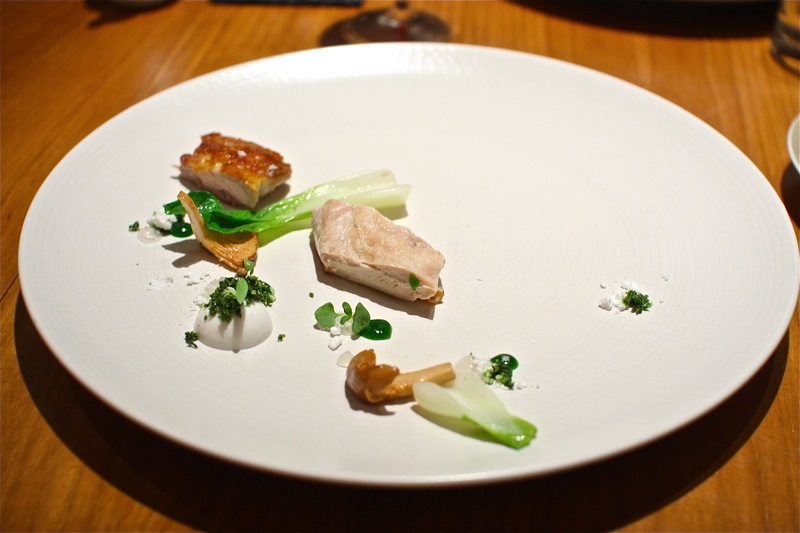 Now, having come full circle, I reflect on 2014, the most fruitful year with respect to dining. 2014 took me through the liveliest pintxos bars in San Sebastián, exclusive wine cellars in Bourgogne, foie gras stores in Budapest, oyster shacks in Boston, late night bistros in Paris, bakeries in San Francisco, ramen stalls in Tokyo and fish markets in Reykjavík. 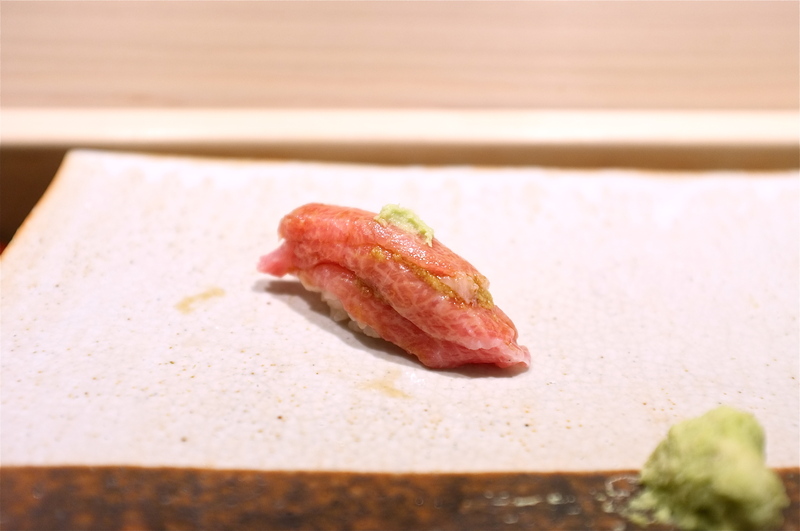 I tasted some of the freshest seafood on the western coast of Japan, alive and kicking just minutes before emerging as a bite-sized piece of pristine sushi. 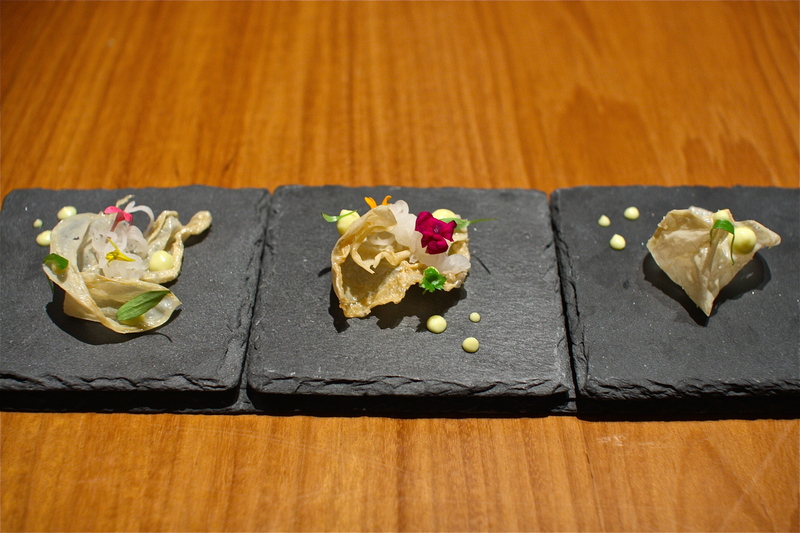 I experienced theatrical presentations and whimsical creations of food (lights, camera, action) in some of the world’s finest Michelin-rated establishments in Basque country. I was introduced to local delicacies in Iceland- hákarl, for one, which is putrid ammonia-rich fermented shark meat, not at all kind to the olfactory or gustatory nerve endings. I ate more than my life’s share of lobster rolls in Maine and Massachusetts, and even more cheese throughout my travels in France. There was an abundance of fresh anchovies to keep me content. And there was a lot of wine in 2014, from the finest magnums of Côte d’Or to my favorite Riojas and Jerez sherries. Choosing my most memorable dishes from this incredibly fulfilling year of wining and dining was no simple feat. There were, quite literally, hundreds that pleased my palate, invoked new ways of appreciation for the culinary arts and brought me closer to those who I shared these memorable meals with. Given that I spent most of the year- winter, spring and summer- eating through Japan, it is only appropriate that I start there. Japan offers no paucity of spectacular dining options, from casual izakayas and hole-in-the-wall udon shops to the world’s most illustrious and renowned fine dining establishments. Many friends came to visit last year and I enjoyed introducing them to my culture and sharing Japan’s seasonal and regional delights. There were many outstanding meals that were not recorded on camera- some happened too unexpectedly, a last minute decision to sneak into a tiny sake bar in a hidden alleyway or a home cooked meal by a friend’s relative. Some were deliberate- the no-photography policy at the newly re-opened L’Osier in Ginza, for one, has left me to relive one of the best classical French meals I have ever had through stored memories of beautiful dishes, the lavish decor and thoughtful service at this restaurant that deserved 3, not 2, Michelin stars. 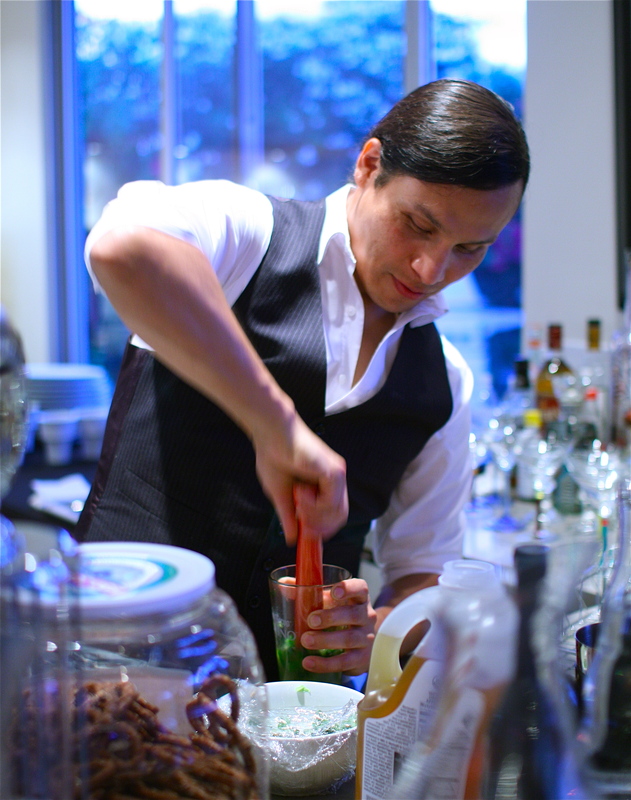 A special note too to the bars in Japan, a blend of old-school establishments where seasoned veterans make precise gimlets and a budding mixology scene where young talents use vaporizer guns and rotary evaporators to concoct playful and fantastical cocktails. The coffee culture has also seen an explosion in Japan last year, with more and more establishments roasting and brewing their beans in-house. Within a span of a couple of subway stations, you can find your preparation of choice- from the nel drip and aeropress to the elaborate Steampunk. 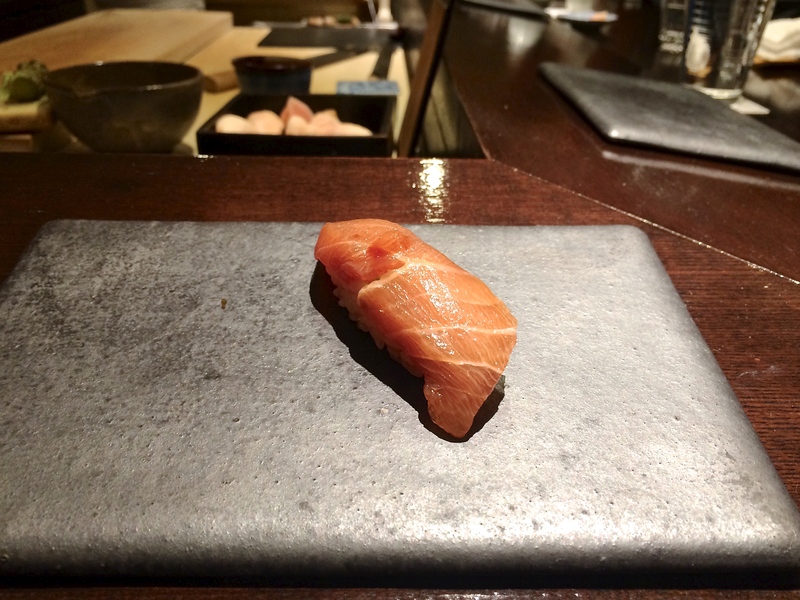 Here is my selection of the most sensational dishes I had in Japan in 2014- just a mere glimpse into all that Japan has to offer- in chronological order to reflect the seasonality of the cuisine. Sushi Mitani in Yotsuya is my favorite sushi restaurant in terms of quality, flavor combinations, presentation and thoughtfulness. Young Mitani san is quite the magician in extracting the purest flavors of seasonal delicacies and transforming them into beautiful and delicious tsumami, or appetizers. He begins each meal with a parade of rare delicacies- often outnumbering the number of nigiri sushi that follows- and that is what I love the most about dining here. 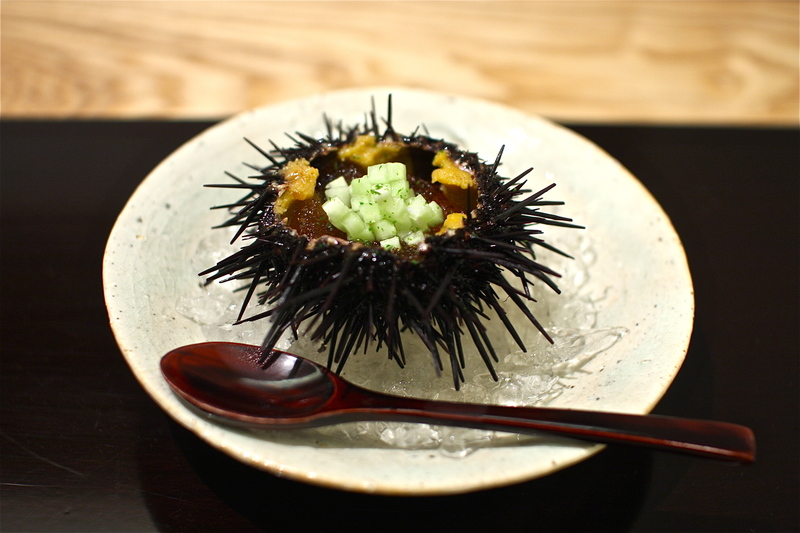 He may drizzle a sauce of sea urchin and scallop innards over barely seared Hokkaido scallops. 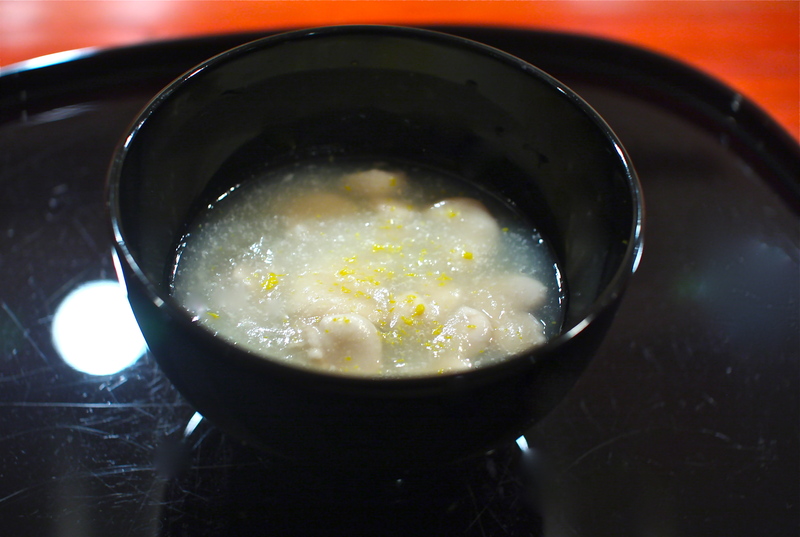 He may serve tender steamed abalone in a soup made from sea cucumber ovaries and abalone extract. Winter is the best time to visit Mitani, when fish are at their fattiest and their innards have reached their peak flavor profiles. On my last visit, the stand out dish was this marvelous creation of black and white- a velvety smooth and rich cream made from hamaguri clam dashi and sweet shirako (cod milt), topped with luscious pearls of Kazakhstan’s finest caviar. 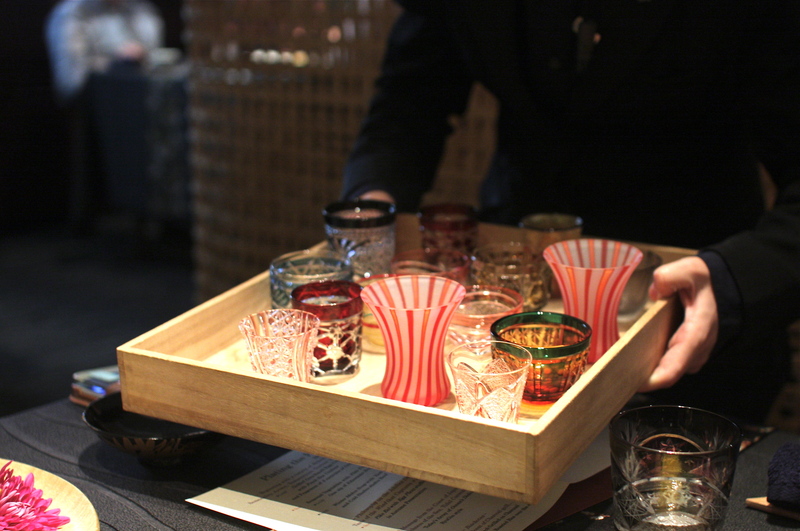 Sushi Mitani has some of the most impressive sake selections in Japan to complement each stage of culinary bliss. The only problem is getting a reservation. The first time I went, 4 years ago, I had to wait 6 months for my reservation. Subsequent wait times grew longer and longer, and my most recent reservation, which I booked over a year ago, had to be passed on to an eager colleague due to a scheduling conflict. I want to believe that the experience is well worth the wait, but who wants to wait a year? Chef Takazawa takes center stage in this open kitchen that looks out onto the intimate dining room that fits just 4 lucky parties a night. Liquid nitrogen smoke and spherification pearls are usual players in his contemporary style cuisine, which adds to the theatrical feel of the restaurant. It’s the type of fun meal that stimulates great table conversation and creates lasting memories. 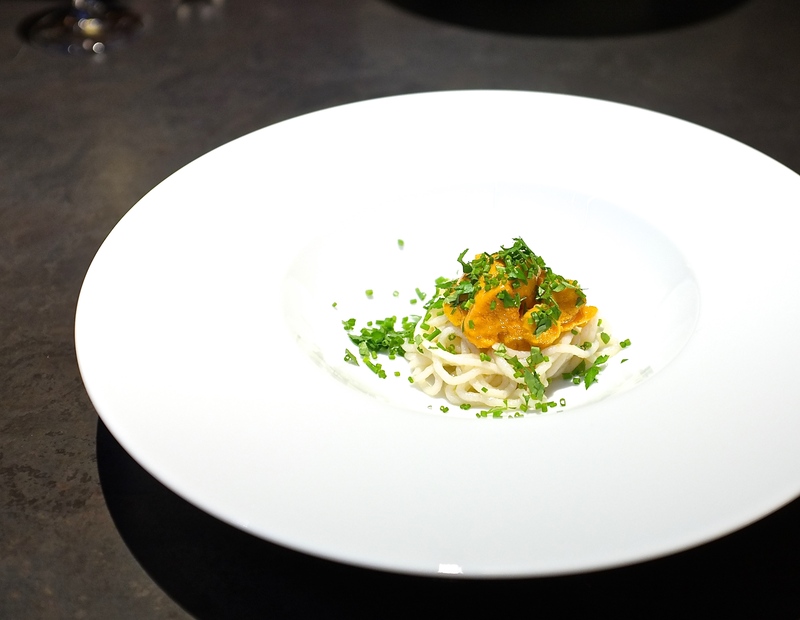 The scallop spaghetti was a real joy- long white noodles made entirely of scallops, its bouncy and slippery texture evoking intense delight, topped with sweet succulent sea urchin. 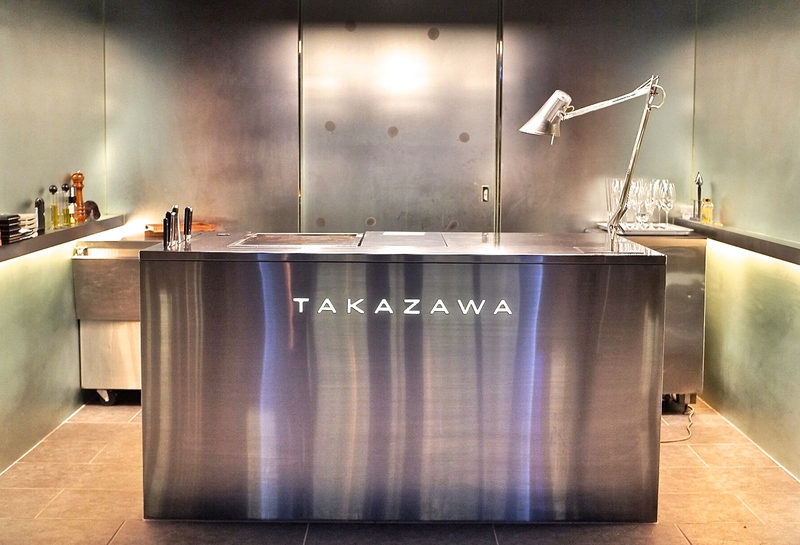 He is set to open a new bar this week called Takazawa Bar just across the street, which is sure to be a new popular destination. 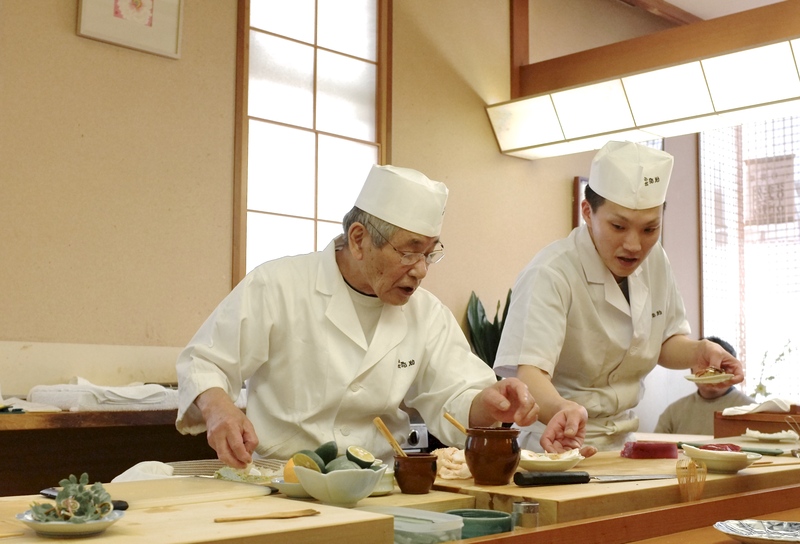 Almost every sushi chef that I have ever talked to has told me that their dream is to travel to Kanazawa to eat at Komatsu Yasuke, where 83 year old sushi legend Kazuo Morita still, to this day, runs a full house. 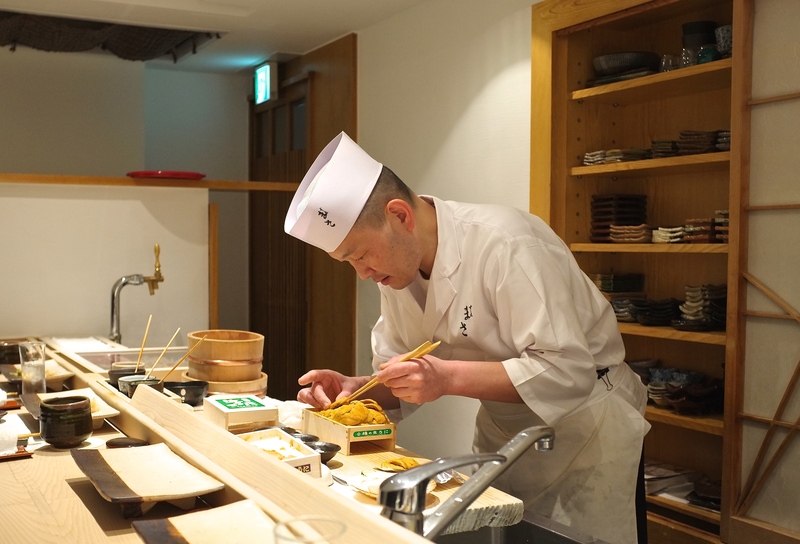 Many sushi chefs have called him the greatest sushi shokunin (artisan) of all times, stating that a visit to this holy temple of sushi is on their bucket list. It had been on my bucket list for some time too, and 2014 was the year to make it happen. Starting this spring, there will be a new direct bullet train line connecting Tokyo to Kanazawa, which is on the western central coast of Japan. Until then, it will take a couple of transfers to get there. The legendary restaurant is nothing like I had anticipated. 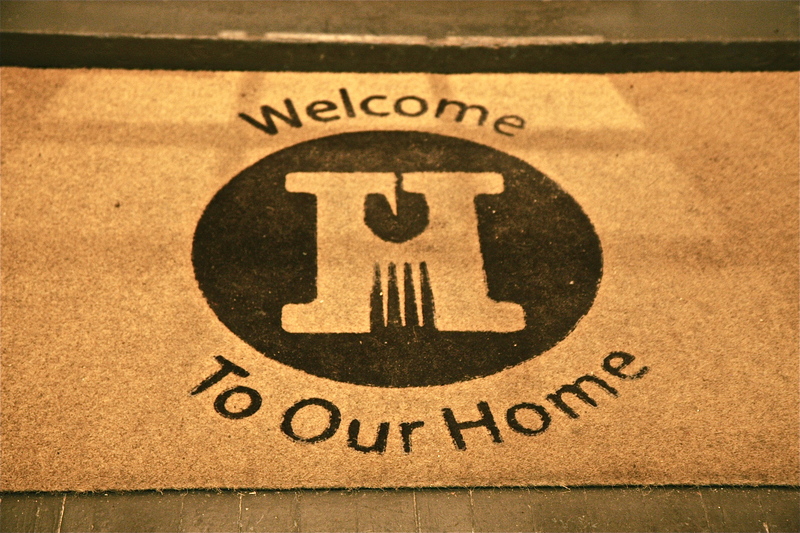 It is located in the lobby of a business hotel, and the servers are middle aged housewives wearing aprons and slippers. But the magic is definitely there, happening behind the sushi counter. 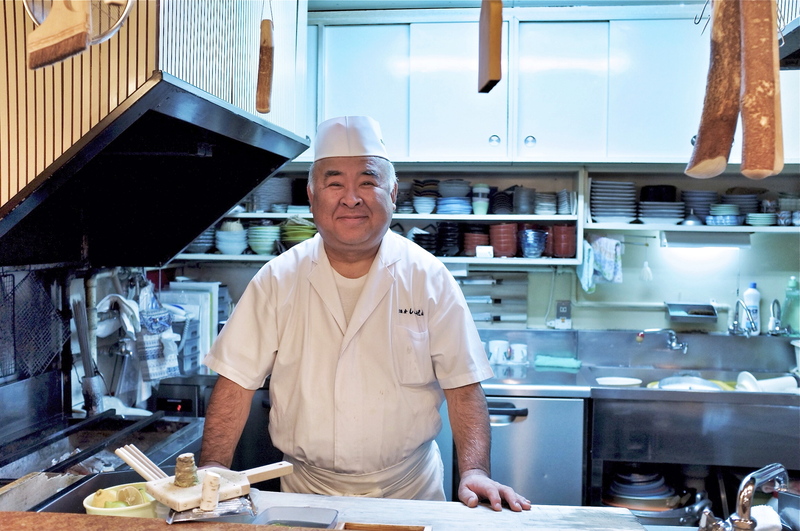 Morita makes every piece of sushi with precise and calculated movements, single-handedly serving an entire counter full of diners and a 4 top table in the rear in a smooth uninterrupted orchestrated flow. 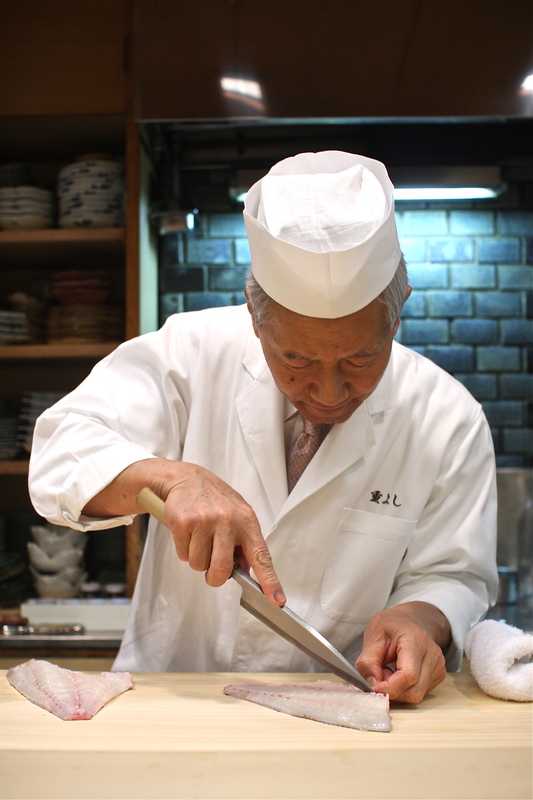 Cut, squeeze and dab, his seasoned hands never stop moving, all the while maintaining conversation with each diner while calculating his next move. It is mesmerizing to watch and his creations are worth the pilgrimage. Maguro zuke, tuna briefly marinated in soy, is served with a splash of sweet citrus- his signature style of Kaga sushi that brightens the flavors of the fish and fills my palate with lovely aromas. 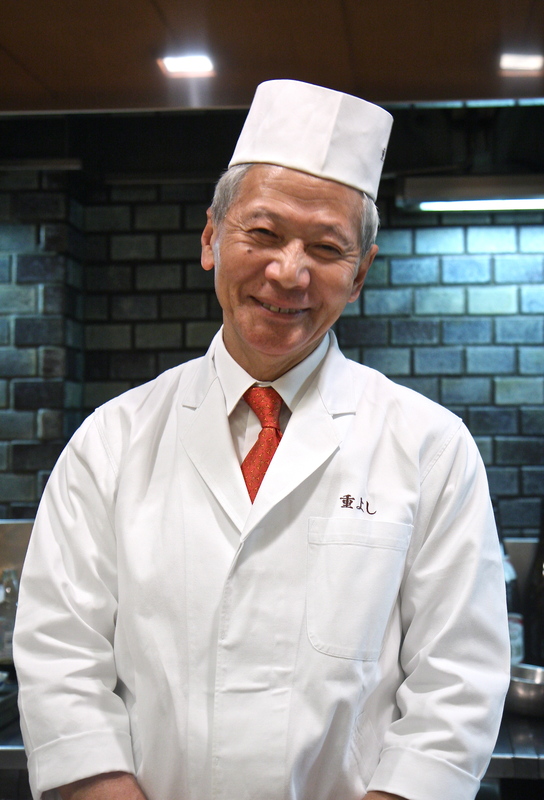 Legendary sushi shokunin Kazuo Morita (above) has trained many in his career, and one of his most distinguished pupils owns a sushi restaurant called Shinosuke in the same city. The ambiance here is much more quiet, intimate and peaceful, owing to the minimalist interior and the fact that there are only two people running the place- the chef and his wife. The experience here is more contemplative and introspective. There is no external stimuli- just the chef and his fish (much more in tune with what I seek of a sushi experience). 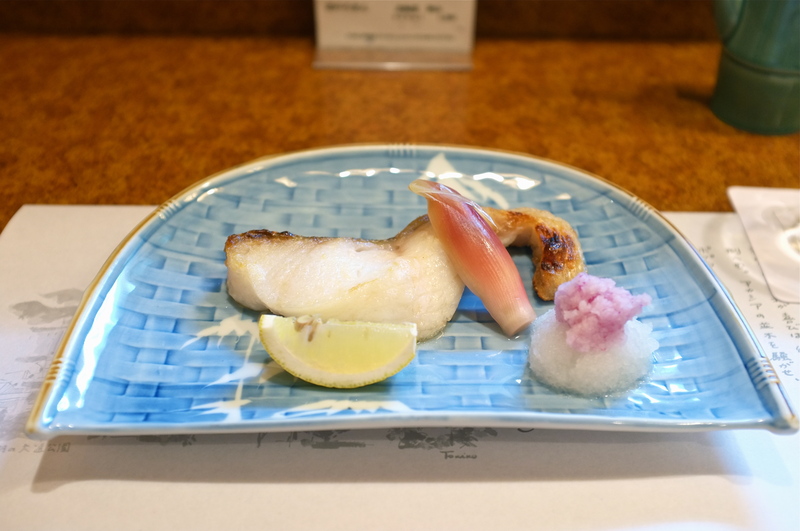 Gasu ebi, or humpback prawn, are a local delicacy only caught in Toyama and Ishikawa prefectures. They are finicky crustaceans that are known to spoil easily, so you’ll never find them outside of these two prefectures. The plump flesh have a brown color that isn’t quite appealing to the eye, but an incredible sweetness that goes beyond any other crustacean that I’ve ever sampled. Chef Zaiyu Hasegawa of 1 Michelin star Den in Tokyo is no stranger to my list of yearly sensational dishes lists. 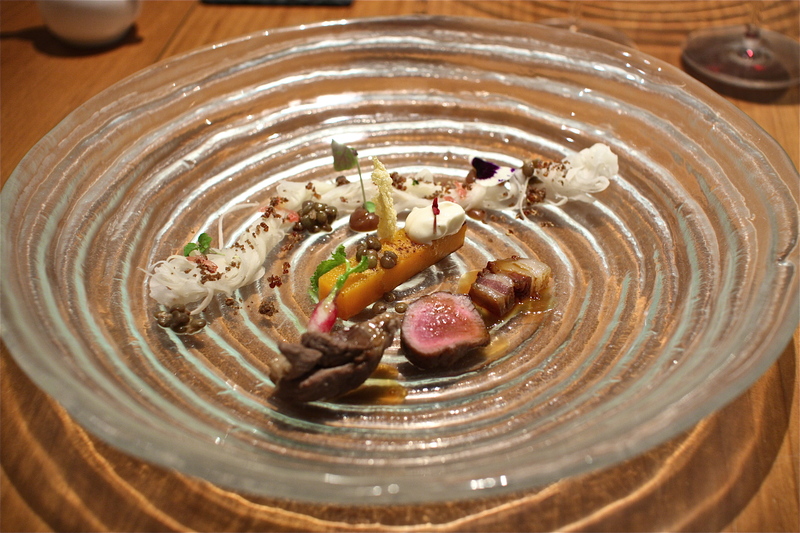 His humorous contemporary interpretations of kaiseki keep getting more clever, as the flavors continue to impress. On one of my many meals there in 2014, he served this exceptional beef and bamboo shoot rice dish that still elicits a strong Pavlovian response. 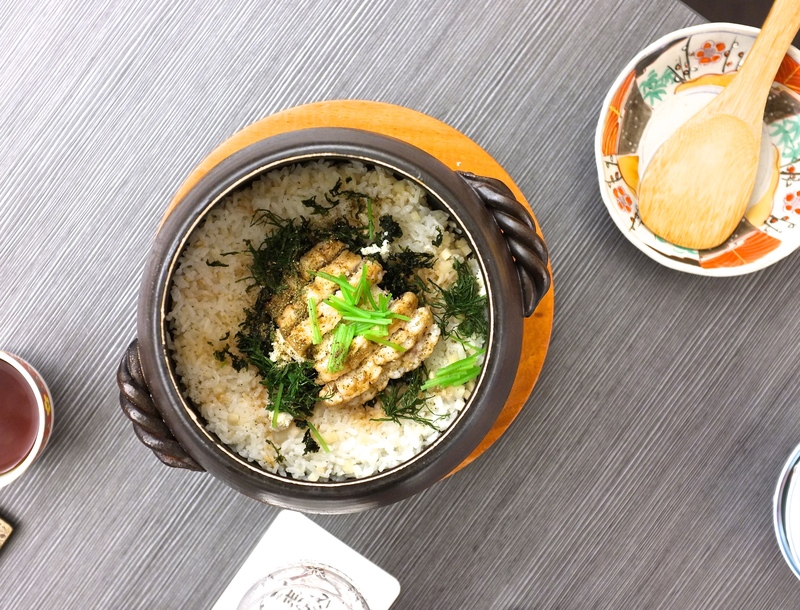 Thinly sliced marbled Sagagyū beef is layered over rice that has been steamed in a donabe pot with young bamboo shoots and beef fat. 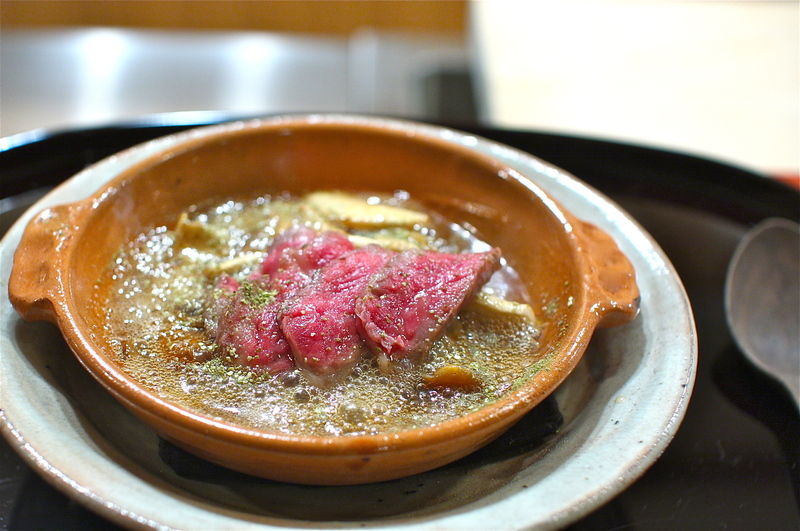 The beef is brushed with a mixture of soy, katsuo dashi and kombu dashi, then broiled ever so briefly. The savory beef fat makes the surface of each rice kernel glisten, gently coating them with its essence. The young bamboo shoots, a signature early spring delicacy, impart a nice crunch for textural contrast. Every bite is fragrant. Every bite simply melts. It is even better the next day as onigiri rice balls- your left overs, made with love and packed in a tiny little take home bag for you when you leave. We all have that one restaurant that we hold to the highest standards. 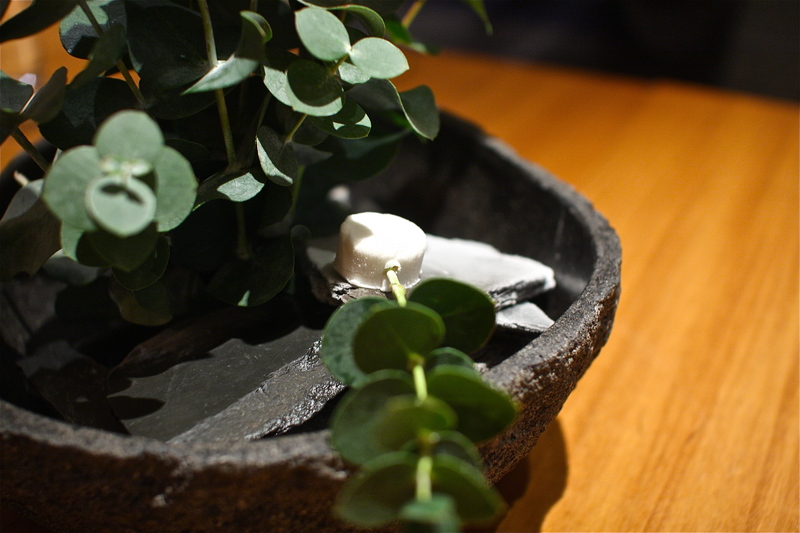 Matsukawa, the exclusive introduction-only restaurant in Tokyo, is just that for me. 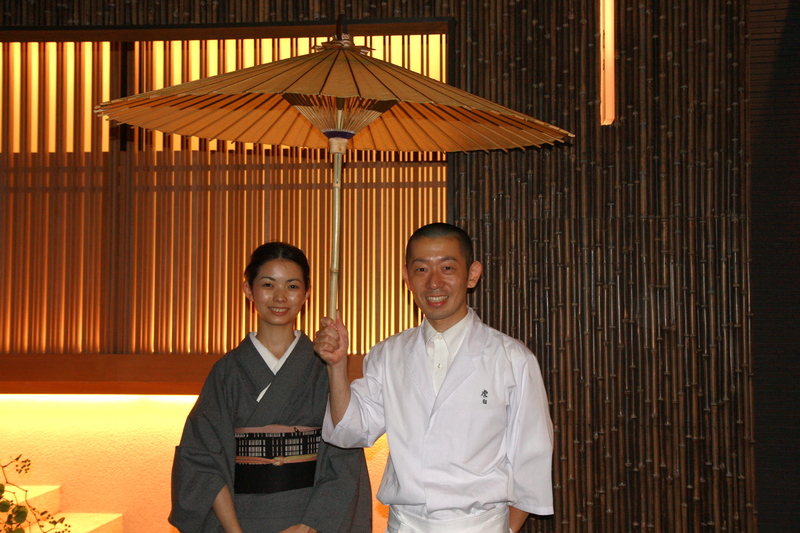 The level of professionalism, the supreme quality of seasonal ingredients, the precision of techniques, flawless execution and gracious hospitality demonstrated by all staff epitomize the very intention and culture of kaiseki. I had 4 fantastic meals at Matsukawa through 3 seasons last year, and each one was more impressive than the last. 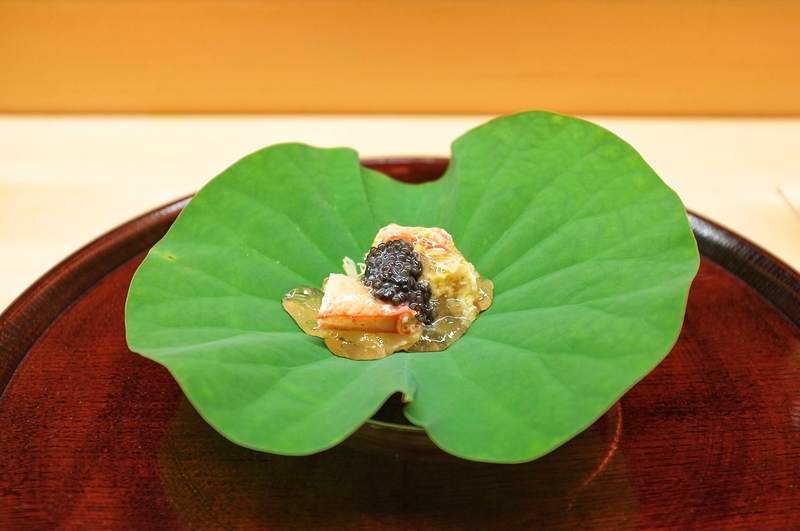 In the spring, I had this fluffy hotate scallop shinjo (dumpling) topped with a wedge of intense konoko (sea cucumber ovaries) and a heap of piquant kinome leaves. Konoko are sea cucumber ovaries that are extracted, salted and dried in the sun (removing the ovaries can be done without killing the animal). The ovaries are carefully layered and sun dried, often resulting in a flat and hard wedge. 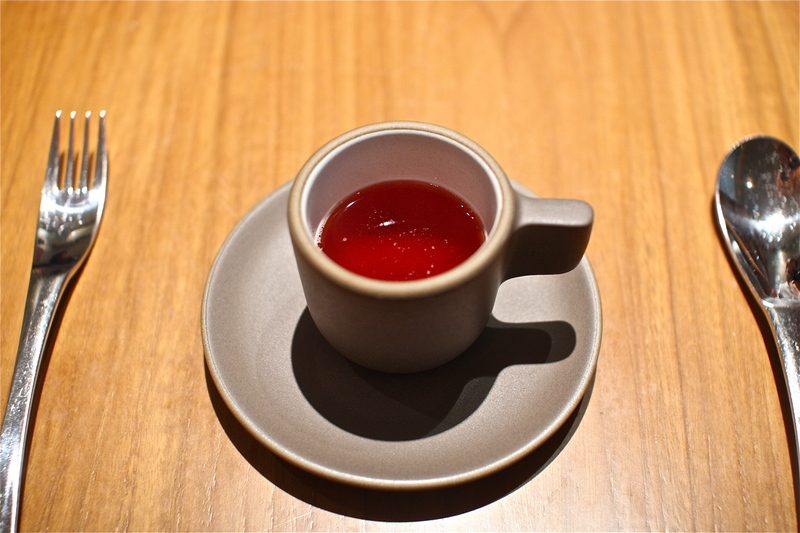 Here, I experienced a fluffy thick morsel of konoko, unlike anything I’ve had before, in the most breathtaking dashi that was pure, clean and elegant. 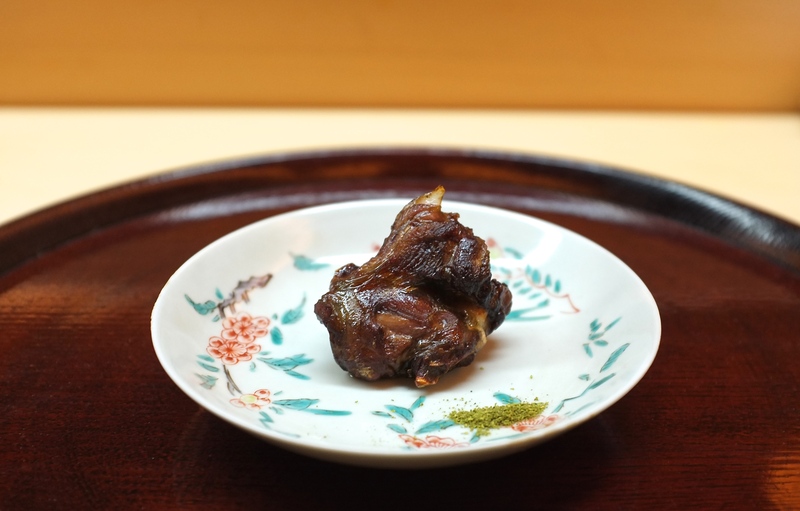 Another beautiful spring dish that was served at Matsukawa was this charred bone-in suppon (snapping turtle) thigh meat. 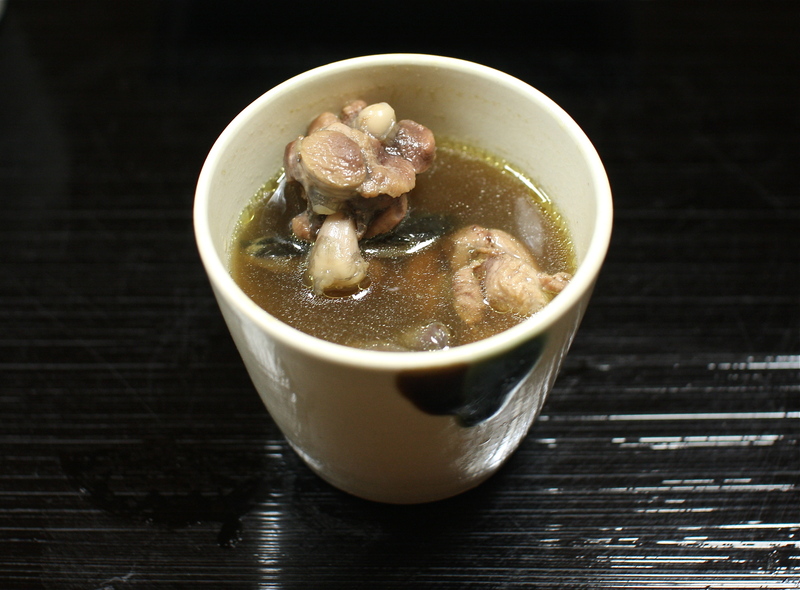 Suppon is traditionally served in stews. It was the first time that I had one grilled. The meat was unctuous and tender, with the perfect degree of char on its surface. What really sold me was the savory turtle fat- so light that it left no residue on my palate, yet mind-blowingly juicy and sweet. Ishikawa, a quaint kaiseki restaurant in the heart of Kagurazaka (my old neighborhood), is the place that is nearest and dearest to my heart. 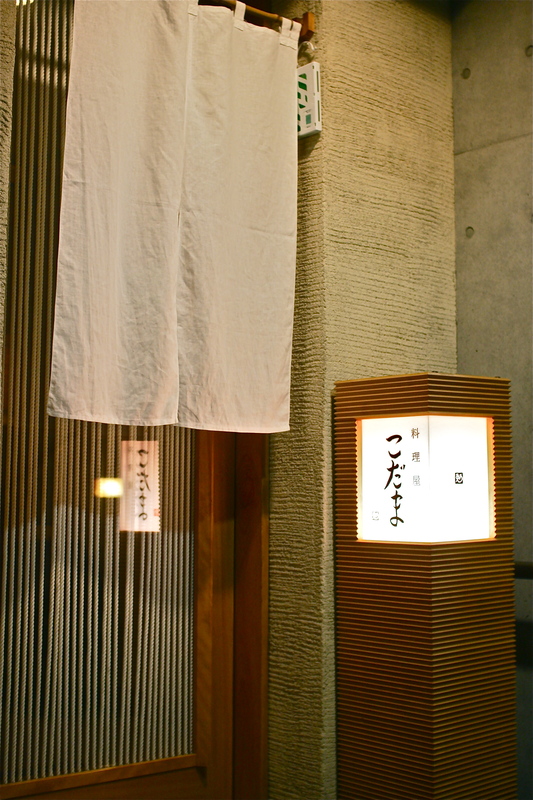 It goes without saying that it is, in quality and service, one of the best restaurants in Japan. It has maintained its 3 Michelin star status for many consecutive years, and the proof is in every meal that I have had there. 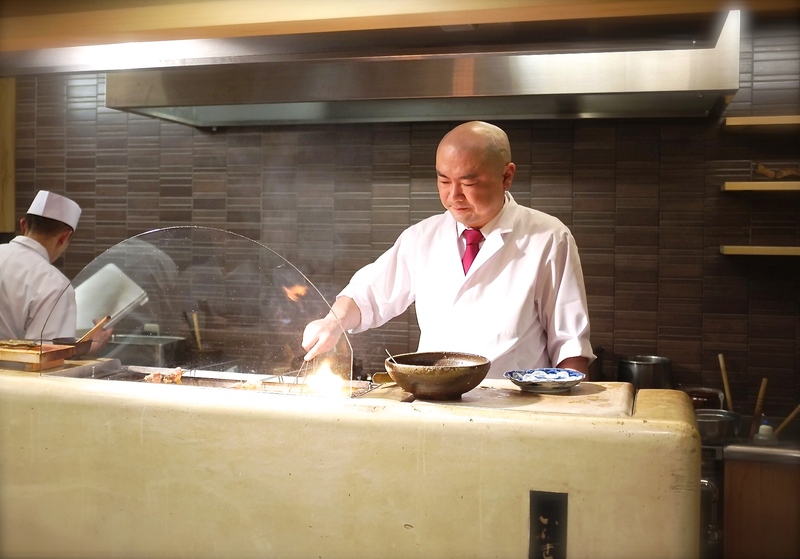 What makes it special is the chef, Hideki Ishikawa, who is the most friendly, personable and honest individual, loved not only by all of his regulars, but also his dedicated and loyal staff. His integrity, grace and radiance translate directly onto each plate- his food is a true reflection of his artistry- and I leave every meal feeling enriched and happy. 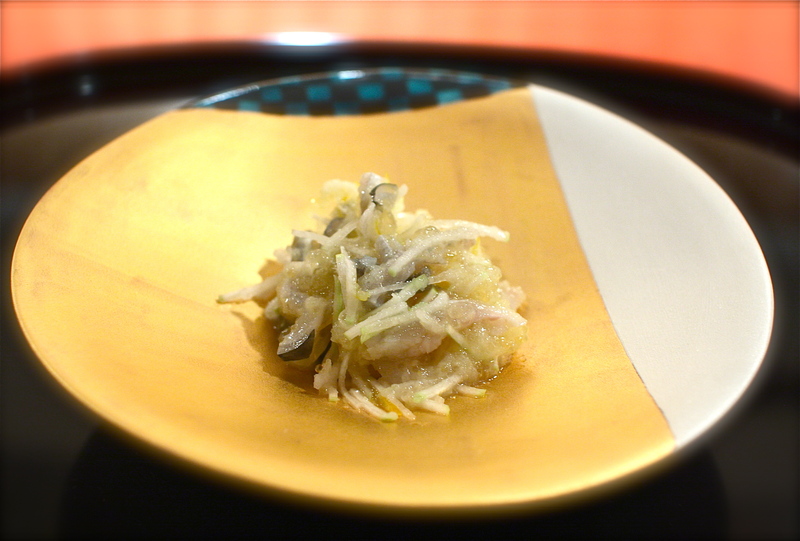 On one of many meals there, this remarkable owan course of braised turnip and grated daikon mizore captivated. Thin slices of buttery wagyū sirloin were draped over the braised turnip, slowly cooking in the warm vapors of the hearty daikon broth. 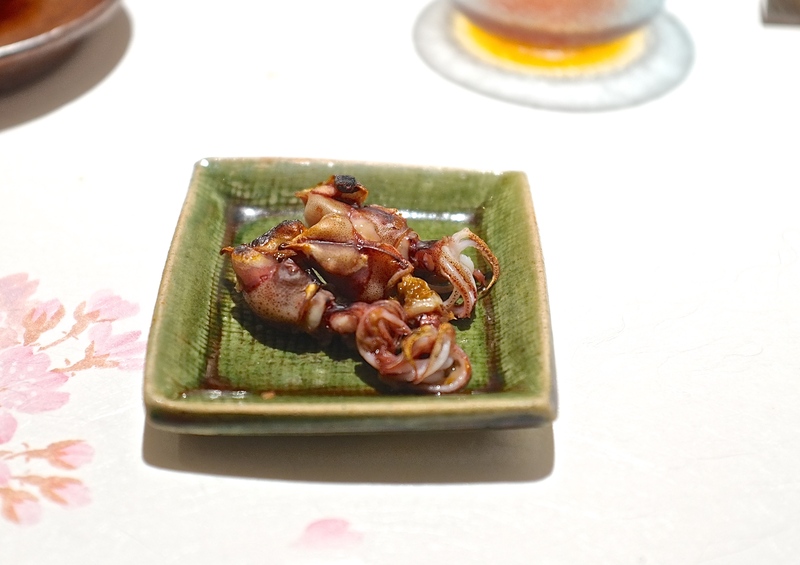 One of the spring delicacies that I look forward to the most in Japan is hotaru ika, or firefly squid. These deep-sea creatures migrate to the surface by the millions once a year for the spring mating season, congregating to one area on the western coast of Japan, in Toyama Bay. At night the entire bay lights up in a radiant display of bright cobalt blue due to its bioluminescence, a spectacle that I hope to witness some day. During this season, hotaru ika can be found on virtually every kaiseki and sushi menu in the country. I certainly had my fill during the March and April months, but I will always remember how Chef Masakatsu Oka served them at his 7 seater sushi bar in Tokyo. He simply grilled the tiny squid on aluminum foil over flames- upon the first bite, there was a delightful bitterness from the innards, followed by a delicate sweetness from its flesh. Then, he presented a wooden spoon with its melted guts that spilled onto the foil when the squid were grilled. 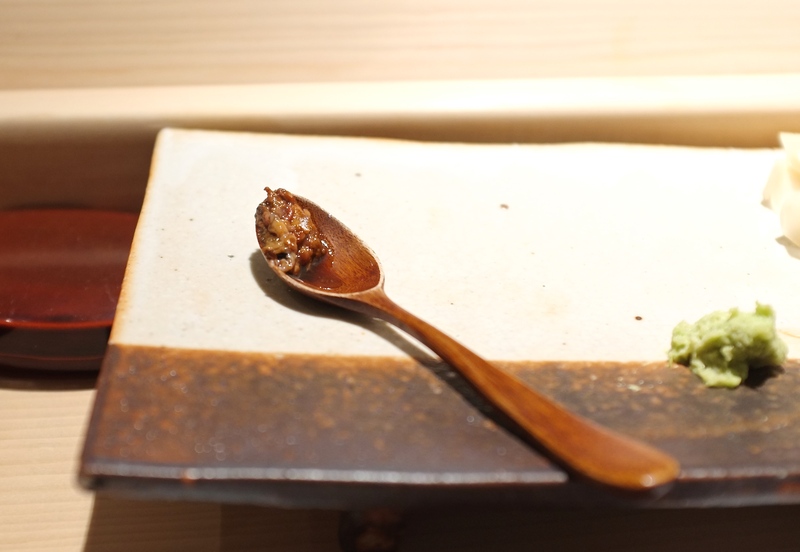 This tiny little spoonful contained the most concentrated essence of firefly squid- a rich extract of splendid umami. It was difficult to choose just one representative dish from what was one of my best meals of the year at 1 Michelin star Ifuki in the Gion district of Kyoto. Charcoal grilling is the signature style of kaiseki here by Chef Norio Yamamoto who controls the embers and flames with seasoned flare. Every course, whether it be the otsukuri sashimi dish or the rice dish, is graced by the binchōtan coals. He controls the hot coals to give just the right amount of influence on each dish, whether it be a slight kiss of smoke to impart a lingering fragrance, or a bold char to flavor his proteins. Suppon (snapping turtle) neck meat, its liver and a cluster of yellow unfertilized eggs were gently roasted over scarlet embers and adorned with a generous shaving of fresh horseradish that, surprisingly, mellowed when paired with these luscious morsels. From beginning to end, my meal at Ifuki was one of the most honest, thoughtful and beautiful meals that I have had in a long time, and one that I hope to relive soon when I return to Kyoto. There were only a handful of disappointing meals in Japan last year that fell short of my expectations, and Kichisen, a 3 Michelin star kaiseki restaurant in Kyoto, was one of them. 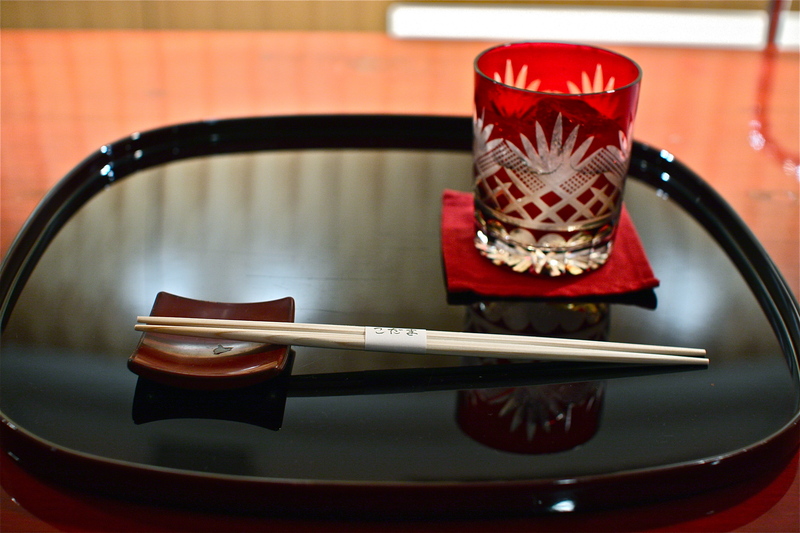 It was a grandeur experience, in true Kyoto style- a 1,400 square foot private tatami room all to ourselves, with every course served in the finest lacquerware and ceramics. There was no soul in each course though, and both the room and the meal felt very distant and impersonal. The dessert course was absolutely charming, almost making up for the lackluster dishes preceding it. Tart passion fruit sorbet was served with a side of Suntory VSOP brandy, to fill into our sorbet cup liberally and generously. Who knew that these two paired so wonderfully and deliciously well? It is a flavor combination that I must recreate at home. 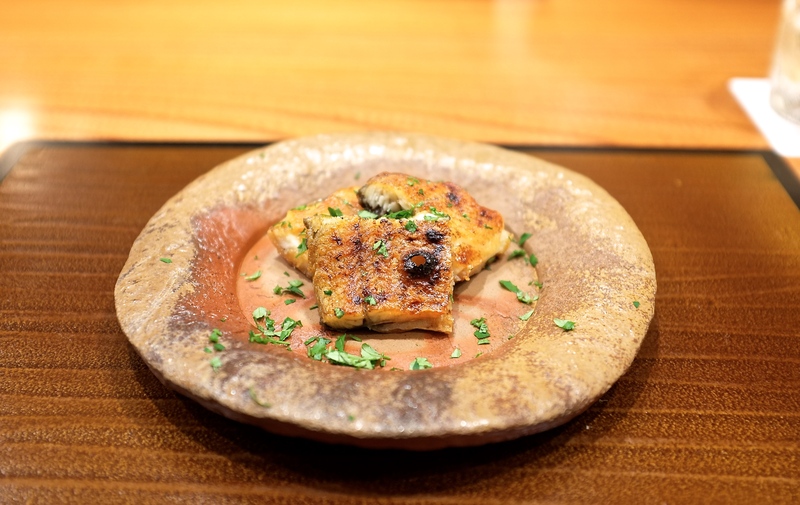 Sometimes a perfectly grilled piece of fatty fish is all that you need. 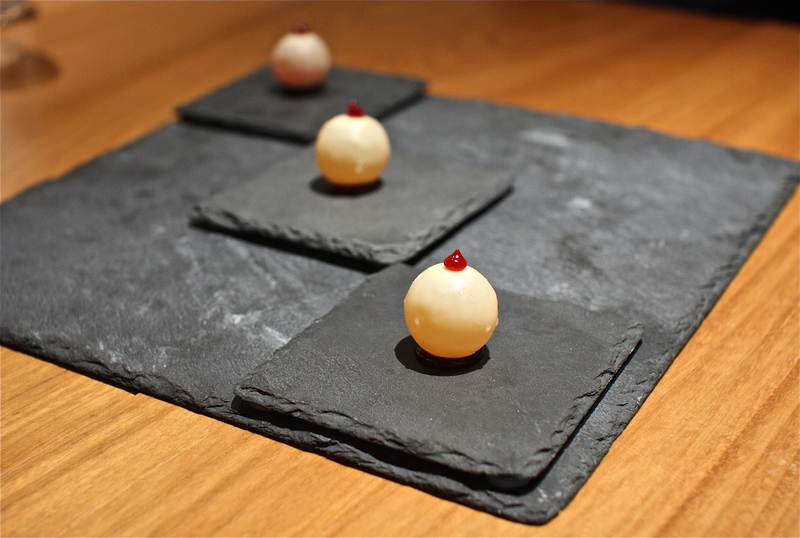 At 3 Michelin star Taian in Osaka, that was the highlight of the kaiseki meal. 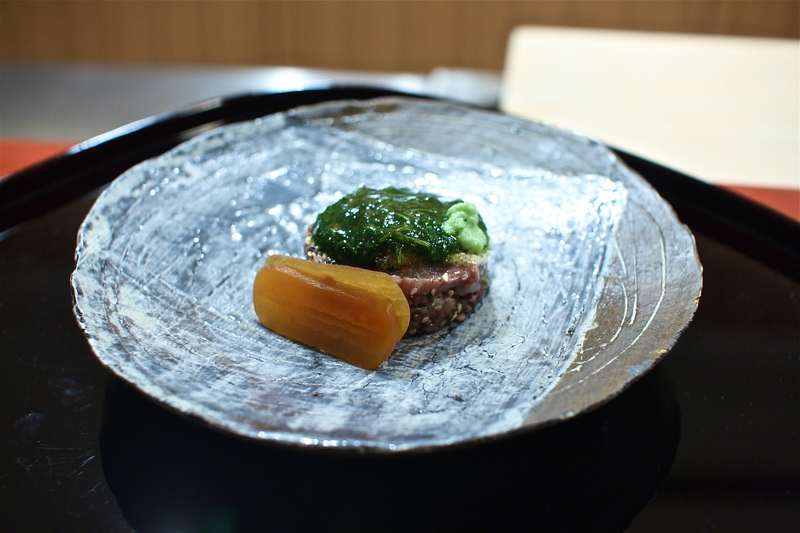 For the last course, Chef Hitoshi Takahata allowed us to choose our protein to have grilled over binchōtan charcoal. We skipped the beef and pork and went for two types of fish- tai (sea bream) and kinki fish. The perfect sprinkle of salt. The impeccable char. Wonderfully crisp skin. We enjoyed both filets down to its very last morsels, until every fiber of flesh was stripped clean off the bones. All that remained were the bones, the fins and our satiated appetites. I got to explore many sushi restaurants during my long stay in Japan last year, and discovered new techniques and styles through various talented chefs. 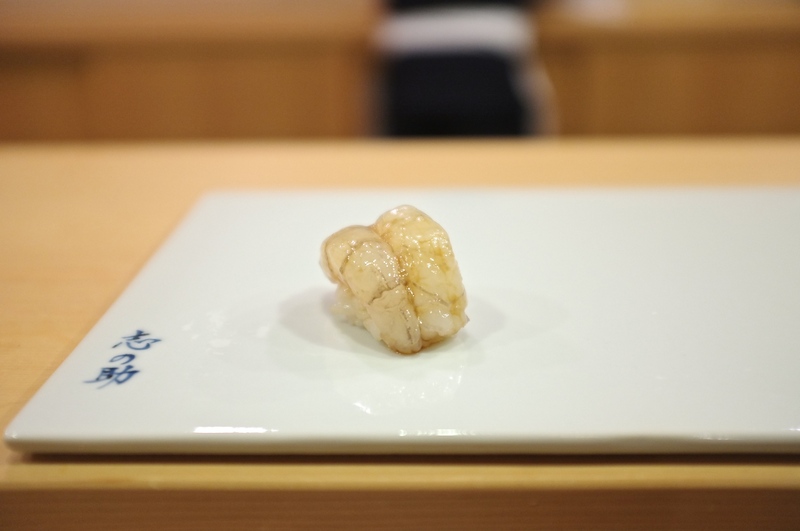 One of my favorite establishments is 2 Michelin star Sushi Kimura, a little gem tucked away in a residential neighborhood in the suburbs of Tokyo. 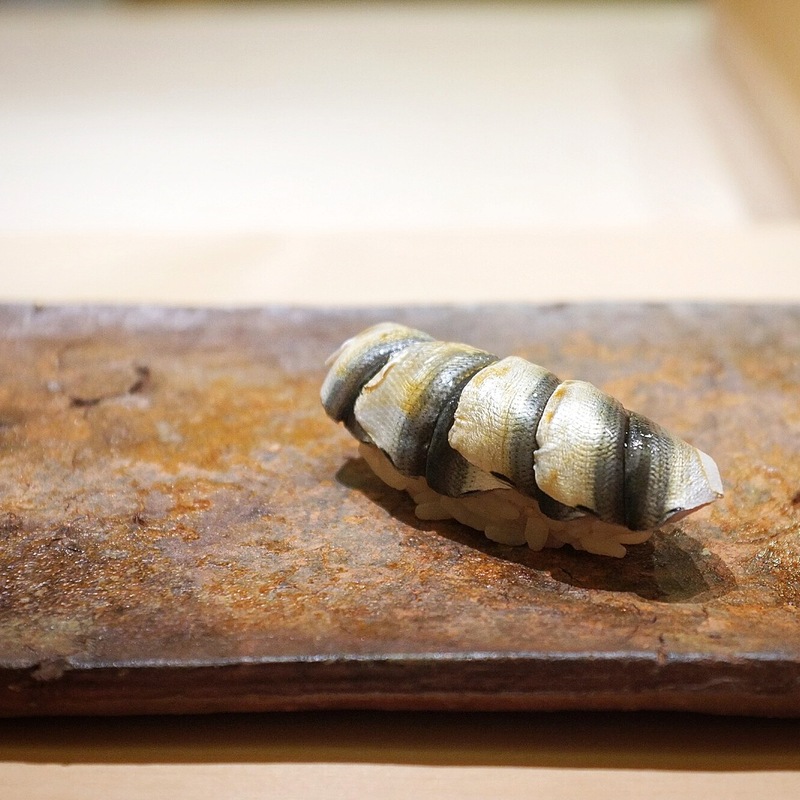 Here, third generation sushi chef Kimura san specializes in aging his fish, at times coaxing out its best flavors by simply resting it overnight, and at times transforming them into completely new flavors by pushing the limits on how long he can age them for. 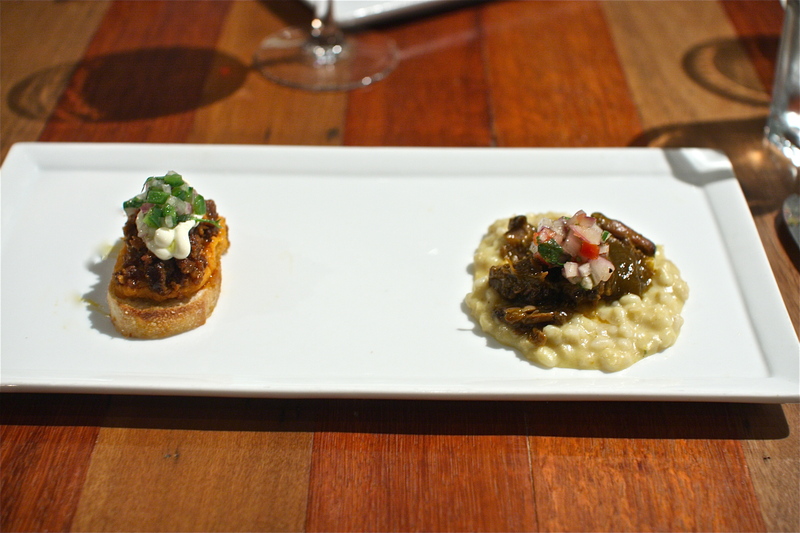 Every piece had a story- a distinct beginning, middle and end- a well orchestrated beautiful progression of flavors. 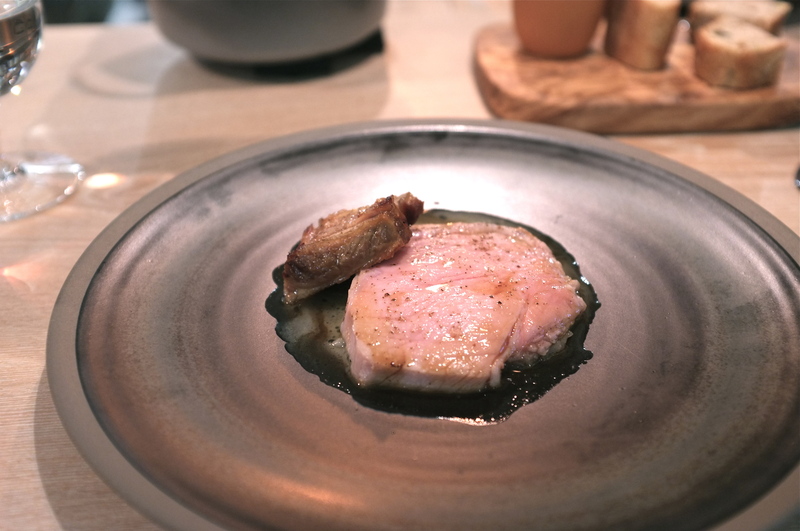 Once he served me this 56 day aged swordfish, a bite that exploded with a multitude of intense flavors (hints of coffee, chocolate and even hops), complexities of sweet aromas and ended with a delightfully clean finish. Sushi has reached new heights and possibilities at Sushi Kimura. Another new favorite is 1 Michelin star Tokami in Ginza, housed in the same location where the famous Sushi Mizutani first started off. 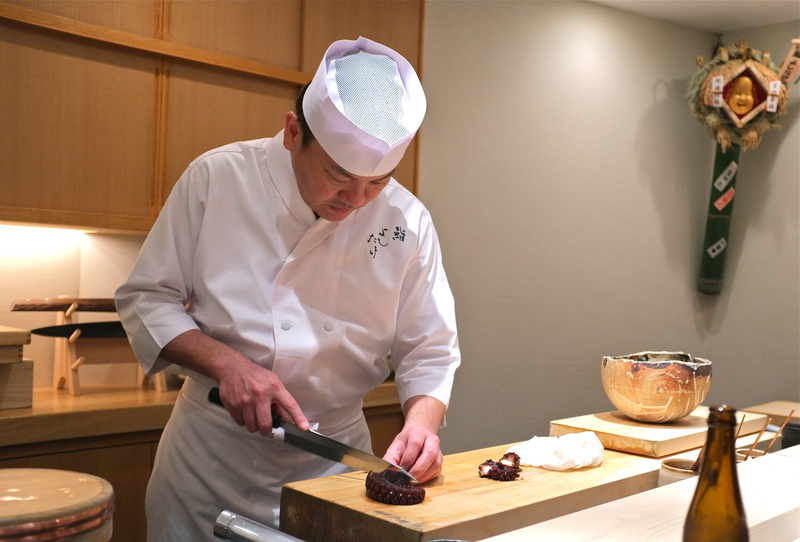 Chef Hiroyuki Sato, who opened Tokami over a year ago, used to work at a beef and tuna specialty restaurant in Azabu Juban. He understands tuna like no other. He is, in my eyes, a tuna whisperer. Akami, chūtoro, ōtoro. 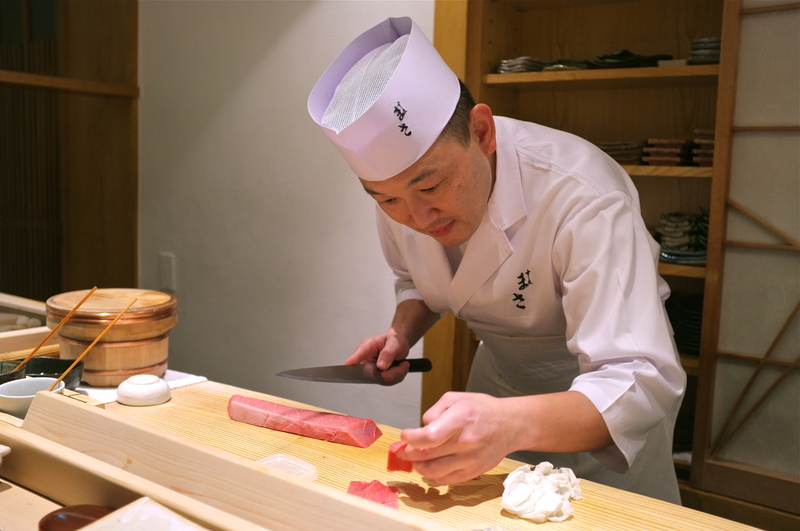 No matter which lean or fatty cut of tuna he serves, it is prepared with incredible attention and deliberation. 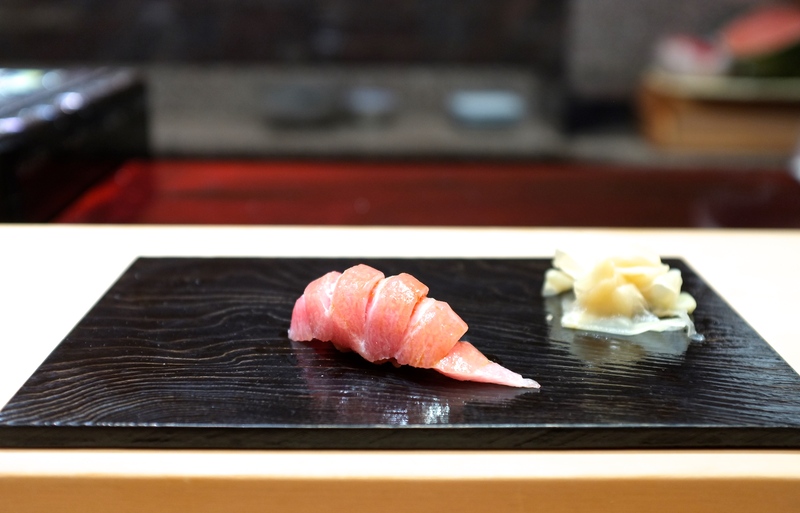 It is said that the most important aspect of a nigiri sushi is the shari rice, and how it balances with the fish. 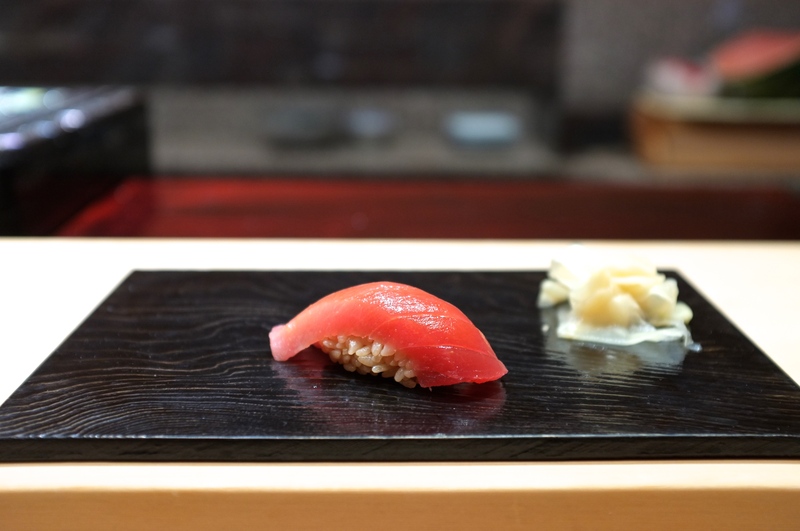 It wasn’t until I had Chef Sato’s tuna nigiri that I finally understood and appreciated this delicate balance. 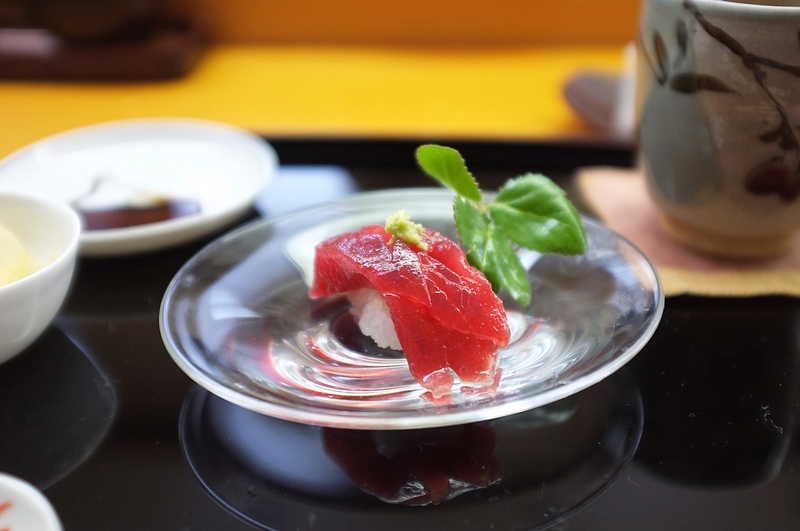 The pristine piece of tuna from Sado Island, draped over akazu vinegar rice, was truly the perfect bite. When I pointed this out to him, he smiled, and revealed that as a tuna specialist, this perfect balance was exactly what he had been striving for. 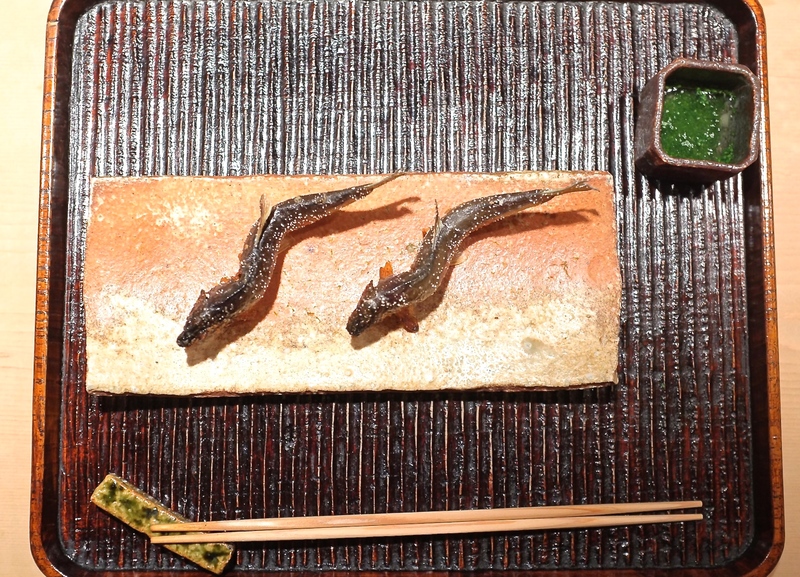 Consequently, the anago (salt-water eel) that he serves at Tokami is the best anago sushi that I have ever had. He is also an eel whisperer. The best quality seasonal ingredients, grilled under expert hands, will almost always please me. 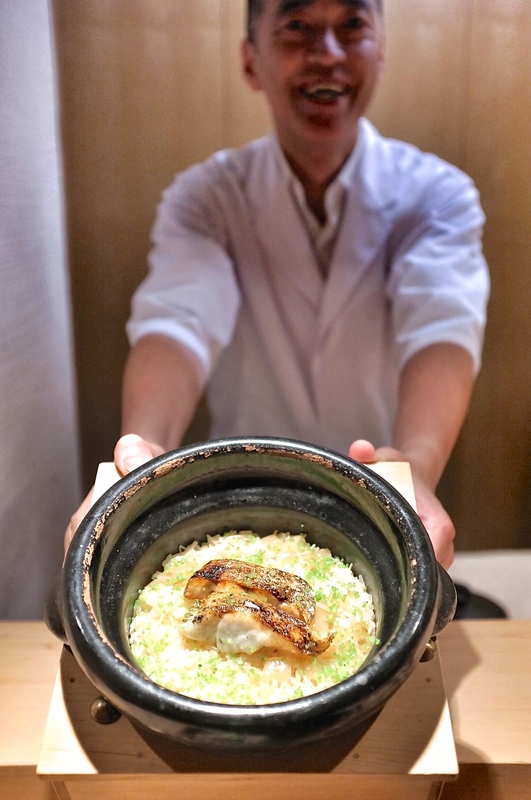 At 2 star Ginza Okamoto, Chef Hidetsugu Okamoto served this wild caught unagi (freshwater eel) from Okayama prefecture, a truly rare delicacy these days given the threat of extinction to the species. 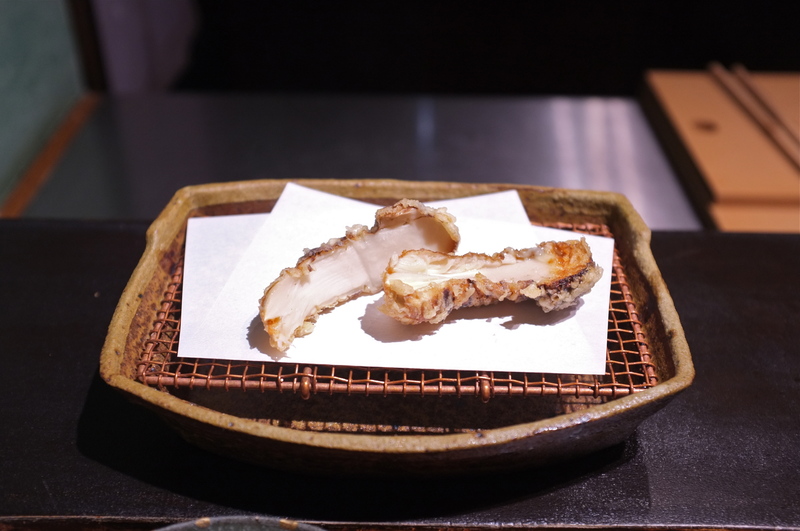 Grilled over binchōtan to the most incredible finish- a delightful crispiness on its skin while retaining its plump moist texture inside- and sprinkled with accents of kinome leaves, this was remarkably delicious, and nothing like its farm-raised counterparts. One of the meals that I enjoyed and learned from the most was at Chateo Akusan in Hiroshima, a small family-run operation where the father and daughter do the cooking and the son runs the front of house. They experiment with aging, fermentation and smoking, transforming and creating new flavors that push the limits of food. 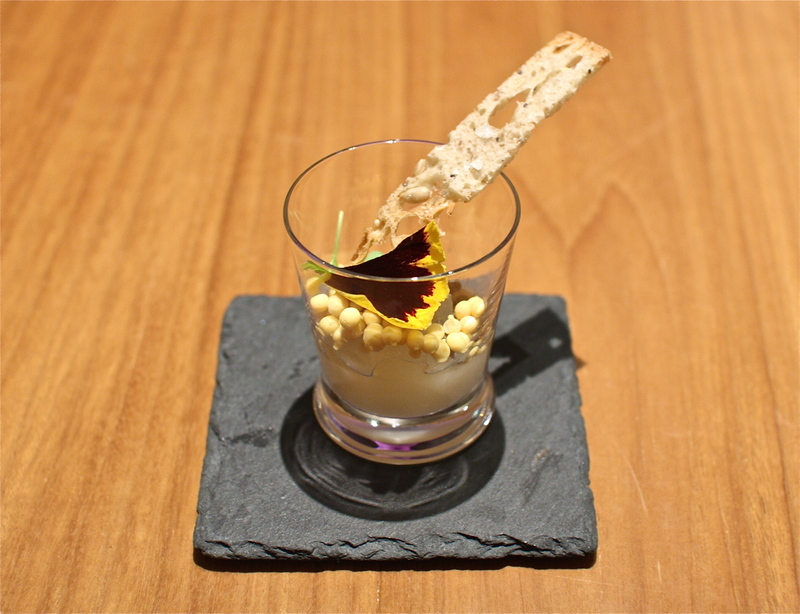 The course started with a smidgen of 3 year fermented oyster topped on a soft-boiled egg. It was intense, pungent and wonderful. Then there was kōji marinated milk skin and smoked grapes. What blew me away was this charcuterie course, starting with Kurobuta pork prosciutto, 6 month air-dried Hiroshima jidori chicken breast, and little chicken liver nuggets marinated in kōji for 3 months, then smoked. Every bite delivered a concentrated punch of intense flavors that I have never experienced before in my life. It was at once novel, fun, eye-opening and exciting- a meal of new discoveries and new horizons. 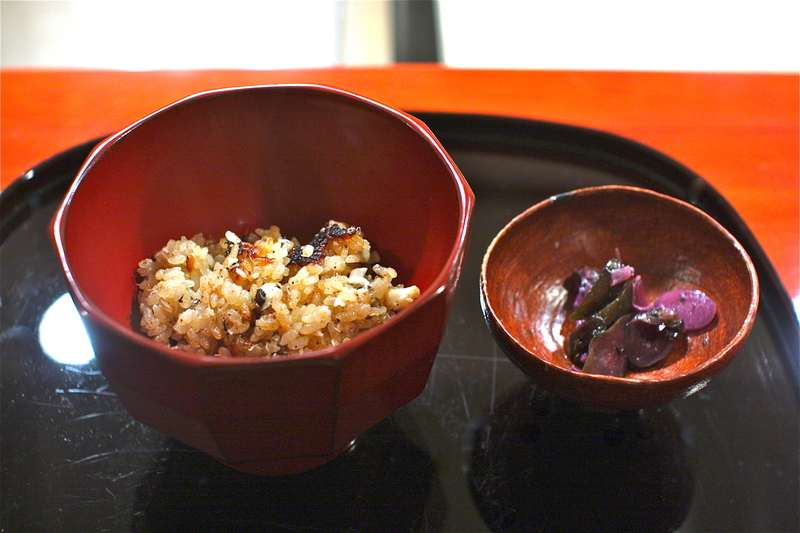 The rice course at the end of every kaiseki meal is something I always look forward to. 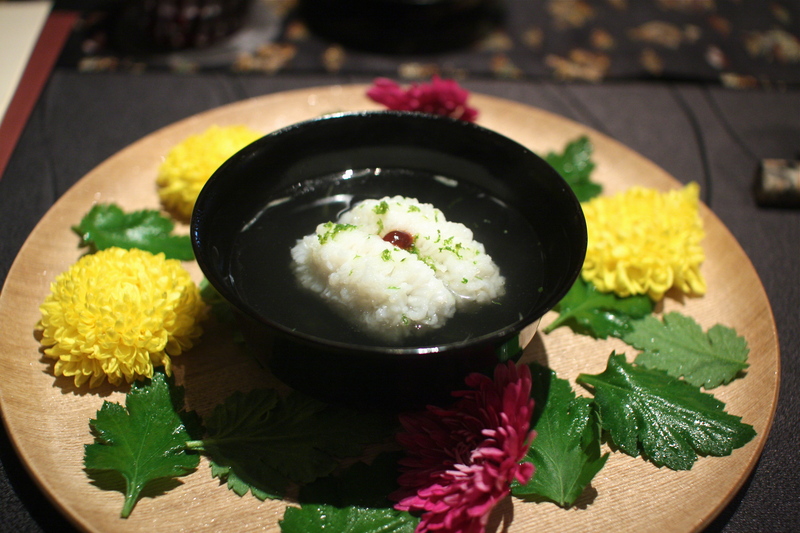 It is a comforting way to end a meal, and the contents of the rice course often feature seasonal ingredients. The one at Seizan was by far one of my favorites of 2014, with summer hamo (pike conger), hamoko (pike conger roe), ginger, shiso, sansho and nori. The little beads of hamo roe coated each grain of rice, imparting a delightful crunchy texture to each bite. 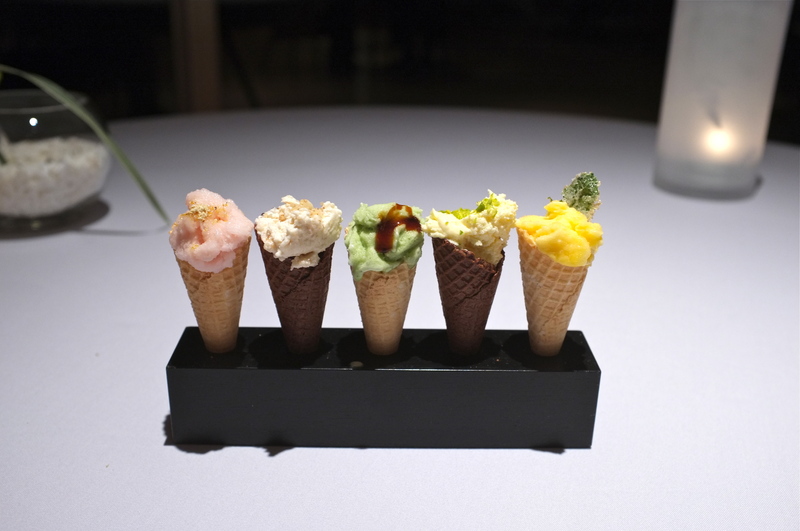 The flavors, reflecting Seizan’s style, were simple, light, pure and restrained. It was summer heaven in a warm bowl of steamed rice, in all its purity and glory. 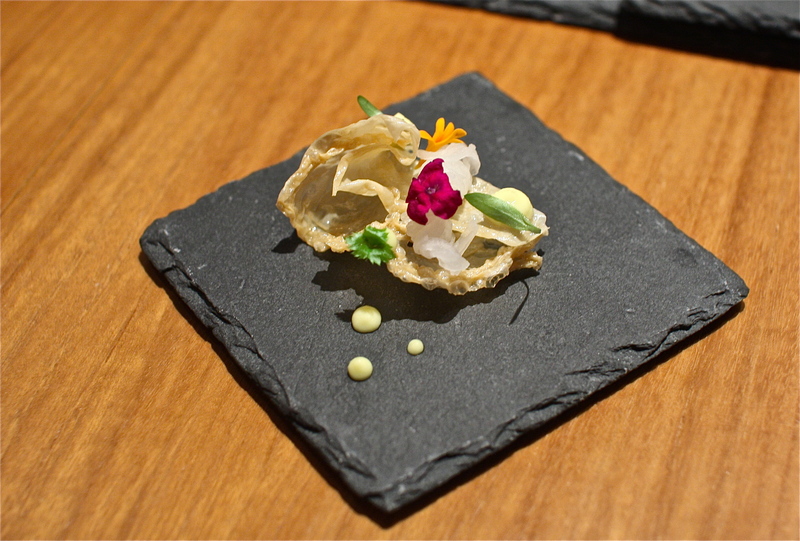 Summer at Matsukawa proved to be just as magnificent as spring, with this handsome dish of sweet Hokkaido kegani (hairy crab) with luscious creamy Kazakhstan caviar and yuzu gelée. 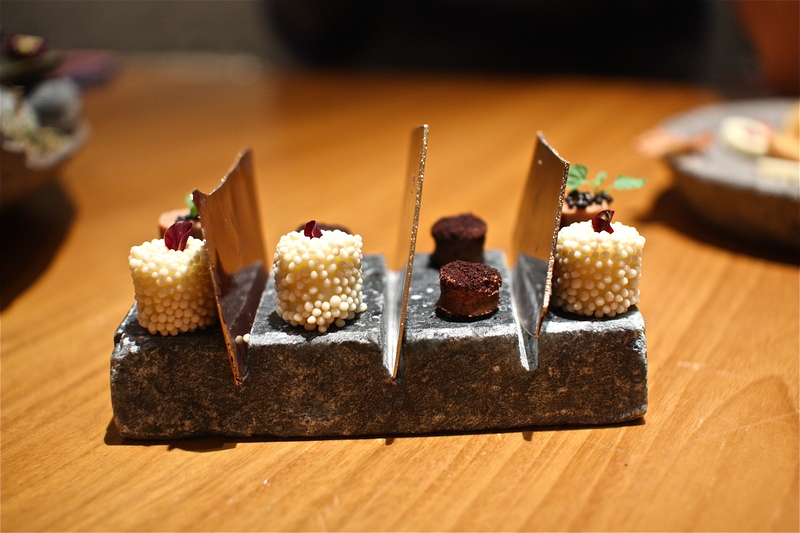 Kazakhstan caviar, also served in the first dish in this post at Sushi Mitani, is unlike any other caviar. The pearls are larger, the skin is softer, the eggs are less salinated and the texture is creamier. Paired with sweet crab meat and finishing with bright citrus notes, this was a sensational representation of Chef Matsukawa’s artistry. Summer transitioning into early autumn is Japan’s peak ayu season, where every restaurant celebrates this mild flavored river fish. I had a lot of ayu during the 2014 season- it is usually grilled and eaten whole- but Ishikawa perfected it. Swimming in the tank until they’re ready to be scooped out and cooked, these little fish are skewered in a way that makes it look like they are still swimming. 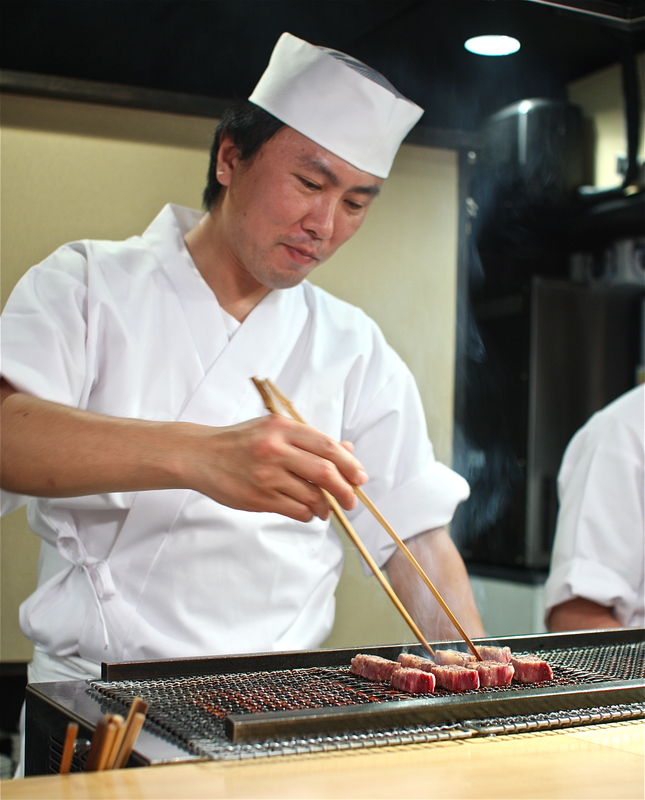 While most restaurants grill ayu over high heat, Chef Ishikawa grills them over low heat, from charcoal, for 20 minutes- slowly and ever so patiently. This way he has more control to obtain that perfect crispiness on the surface while retaining the moisture inside the delicate flesh. Dipped in green tade herb sauce and eaten from head to tail, this was the best ayu I have ever eaten. A pile of summer truffles so massive that you can’t even see the green lettuce salad underneath? I will eat this any time, any day. This dish of salad greens dressed in sardine fish sauce and covered with copious amounts of thinly shaved summer truffles was a demonstration of purity and simplicity (but certainly not restraint). 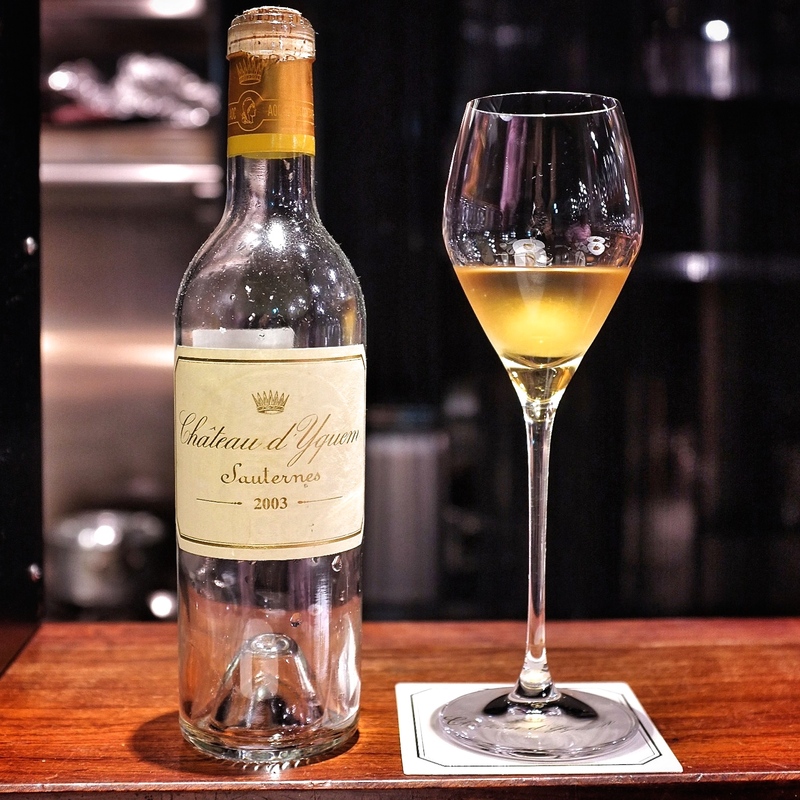 Mori, a relative newcomer to the Tokyo dining scene, is one of the few places in Tokyo where you can enjoy such delicious decadence with Chateau D’Yquem at a reasonable price. The 2003 Sauternes was paired with foie gras, roasted porcini and aged Kurobuta pork consommé, another stellar course at Mori. 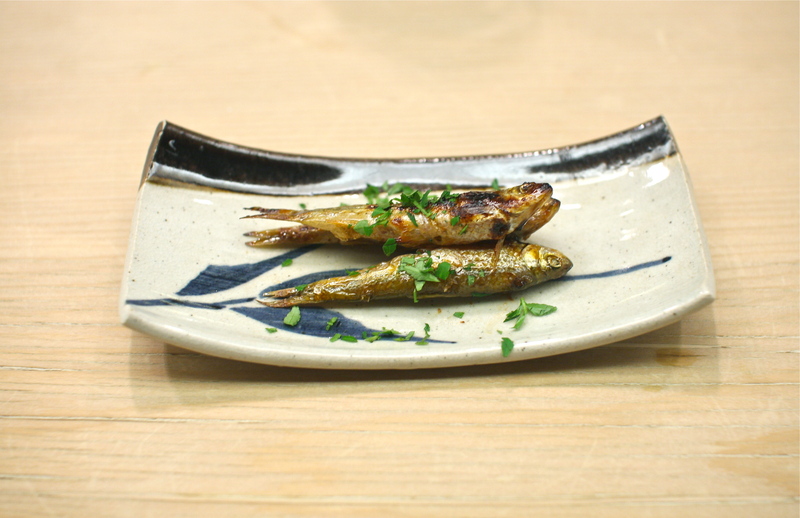 Shinko (young gizzard shad) season lasts only for a few short weeks in August. During this month I combed through many sushi restaurants in Tokyo, in pursuit of these tiny little delicacies as small as my fingertips. I had many wonderful versions at many fine establishments, but the one at Imamura was my favorite. A lot of work goes into preparing these finicky little fish- one chef told me that 5 little pieces take up an hour’s worth of prep time. Depending on the size of the fish, there may be anywhere from 4 to 10 layered filets for each bite of sushi. They must be gutted, deboned, salted and marinated in vinegar to just the right timing- under marinating will cause the fish to spoil, while over marinating will degrade it into an acidic mush. The stars aligned at Imamura and this one bite, consisting of 4 perfect filets, was sensational. Japan is known for its marbled wagyū beef, a genetically superior breed of cattle that produces some of the most buttery cuts of meat in the world. At the old-school Aragawa steakhouse, only prize-winning Sanda wagyū cows make the cut, slowly roasted by hand over binchōtan charcoal by a seasoned chef. We tried two strips of sirloin from two different Sanda cows- one more marbled and fatty, melting like butter, and the other more lean, with an intense beefy flavor. Each bite released more and more flavors from the meat, going down easily with sips of red Bordeaux, chosen from their extensive list of elite French wines. 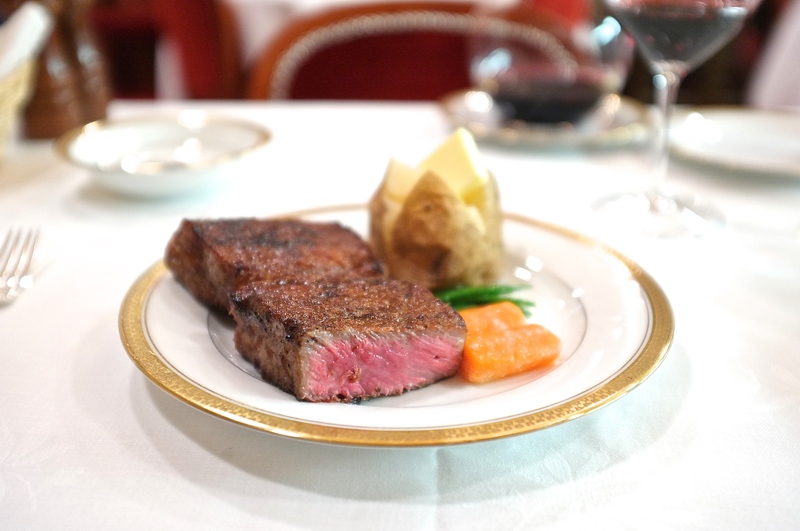 The hefty price tag doesn’t allow for frequent visits here, but it is definitely a special experience to dine at Aragawa, where red velvet banquet seats and crisp white linen tablecloths transport you back to the golden years of Ginza. My culinary journey took me as far south as Kagoshima, where I had some of the best Kurobuta pork in the form of tonkatsu and shabu shabu, through Nagasaki where I had incredible sushi, up into Hiroshima where I revisited the atomic bomb memorial, through Osaka for delicious street food (okonomiyaki, takoyaki, monjayaki and kushiyaki), back into Kyoto several times to visit my favorite shrines and teahouses, and across to Kanazawa to see one of the most beautiful Japanese gardens and to visit a sushi legend. Part of the beauty of Japan is the regionality of food and culture among its 47 prefectures. 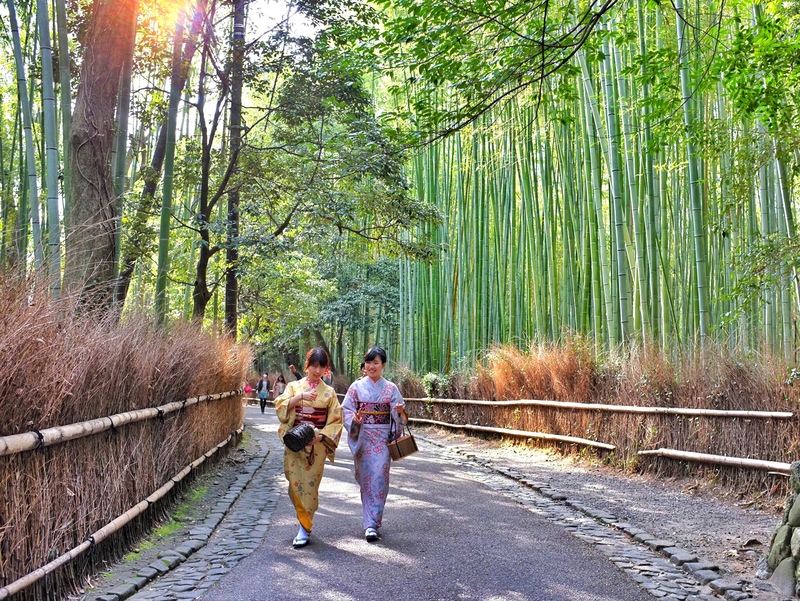 Every prefecture offers sights and delicacies that are unique to its local terrain and history. I would love to explore Kagawa prefecture in the Shikoku region to delve into the chewy sanuki udon culture, and the Tohoku region to visit some of the country’s most prestigious sake distilleries. In the meantime, my ambition is to reflect on and share my sensational dishes of 2014 outside of Japan (Spain, France, Hungary, Iceland, Asia and the US). Inshallah. Instagram and the iPhone have killed my blog. In this digital ‘social media’ age of immediate upload and instant feedback, my intended goal of writing at least 1 post a month in 2013 has been completely demolished. How many of these 12 posts have I managed to write in 2013? Zero. What has finally motivated me to emerge from my blog slumber is the incredible year that I had. The adventures, the inspirations, the creativity and growth that encompassed every day of 2013 was something I wanted to share. 2013 was a year of renewal. It was the year that I moved from Los Angeles to Tokyo. There was a window of opportunity that presented itself at exactly the right time in my life- a new career, a new environment, a new lifestyle, a new perspective- what would life be if I wasn’t willing to follow my heart? I got to explore the country that I grew up in, calling Kagurazaka, my favorite part of Tokyo, my new home. Living in Japan has given me more opportunities to experience the culture that defines who I am and learn its complexities, its depth and its history. I took countless trips, met a lot of people and enjoyed a ton of food. There were many life changing meals and meaningful friendships that blossomed through those meals. Food connected me to more people than I could have ever imagined, every person enriching my life with their unique splash of colors. Consequently, it was a year of renewal for Japan too. 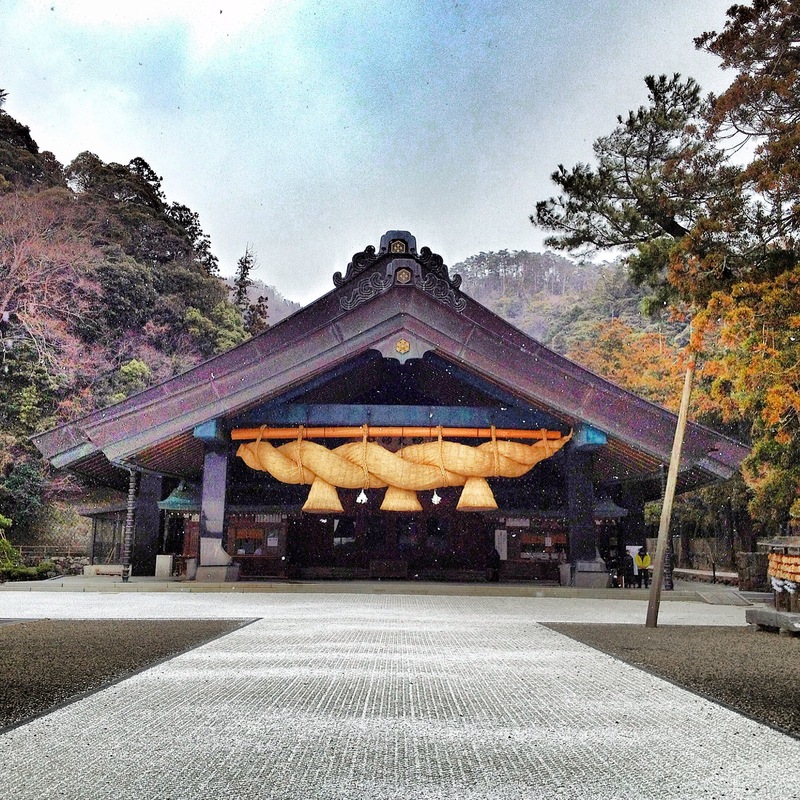 The year began with a pilgrimage to Izumo Grand Shrine in Shimane Prefecture, known as ‘the realm of gods’. Then a visit to the most sacred Shinto shrine in Japan, Ise Grand Shrine in Mie Prefecture. 2013 was the year of the Shikinen Sengu, a rebirth and renewal ritual where the entire shrine is rebuilt from the ground up with new materials- cypress, copper and gold. The tradition, which goes back more than 1,200 years, occurs in 60 year cycles for Izumo Shrine and 20 year cycles for Ise Shrine. 2013 was just that year when the cycles overlapped for these two most sacred shrines in the country. 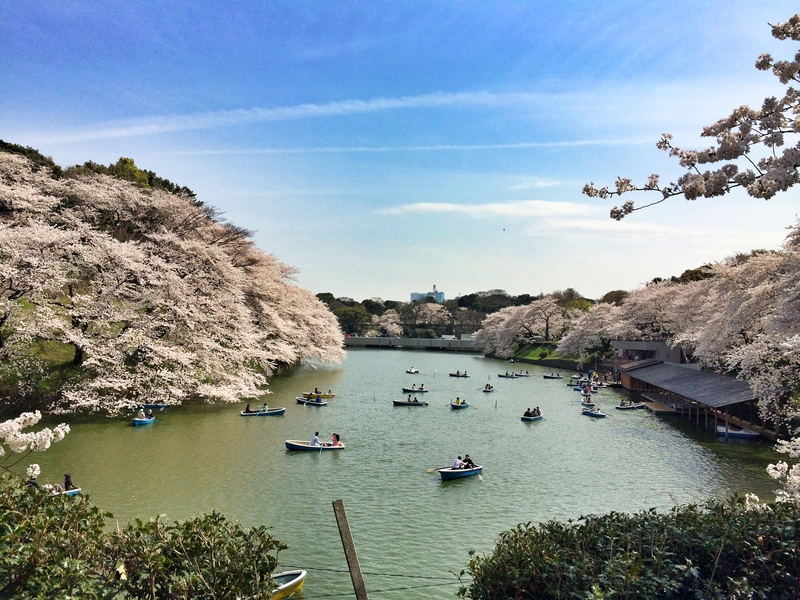 It could not have been a coincidence that I decided to move to Japan at a time in my life and in Japan’s history that signified new beginnings. I explored many facets of Japanese cuisine. Street food in Osaka. Mountain vegetables of Nagano. 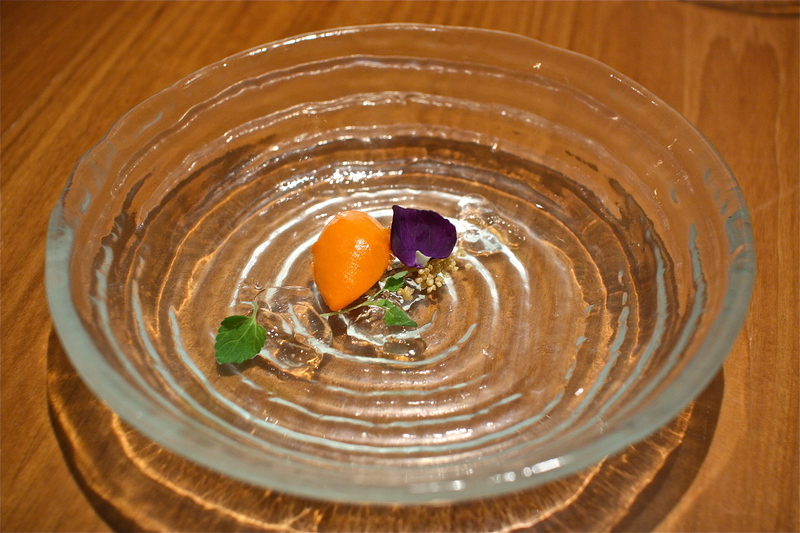 Contemporary kaiseki in Tokyo. Japanese knives in Gifu. 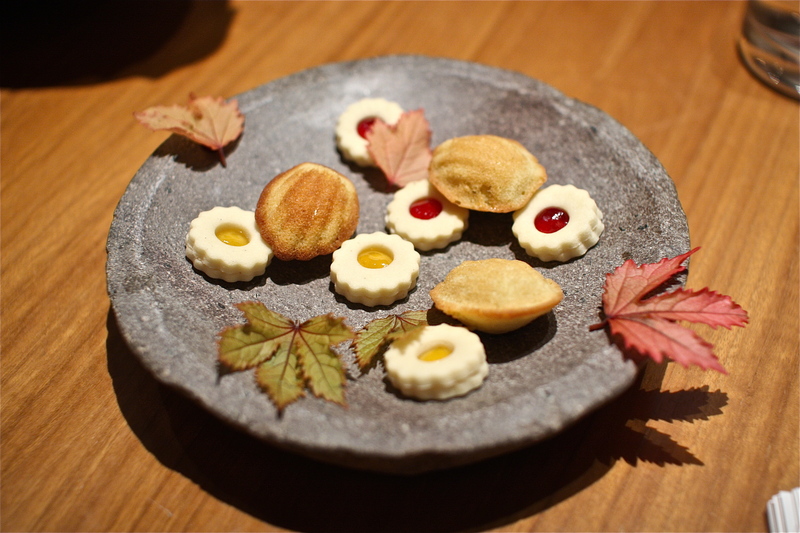 Traditional wagashi desserts in Kyoto. Seafood in Hokkaido. I was introduced to new foods that I had never even heard of, and new flavors that excited my palate. I ate out almost every day, taking in with my eyes and my appetite the incredible range of delicious food available at my fingertips. I was taught by Japanese chefs both young and old on the history of Japanese cuisine and given an intimate glimpse into the magic that happens in their kitchens. 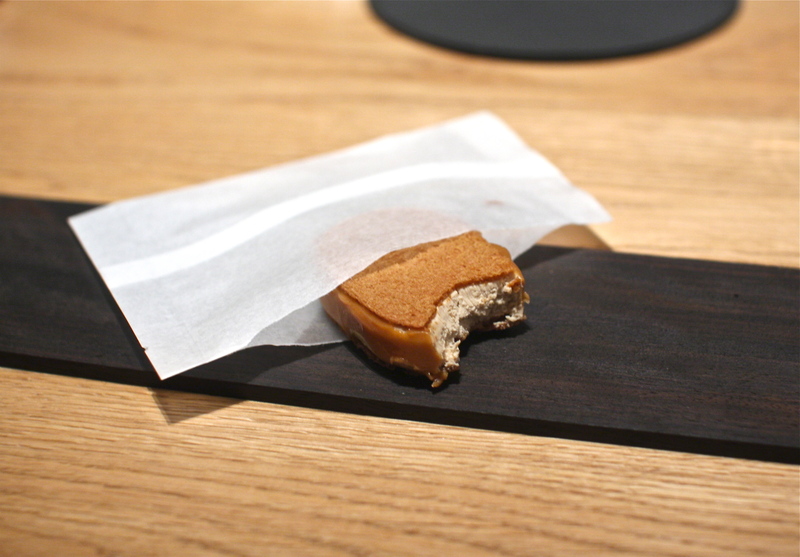 The dedication, verging on obsession, with which the Japanese treat every aspect of gastronomy is simply fascinating. There is a sincere intention behind every step of food preparation- one that simultaneously pays respect to the product and coaxes out its pure flavors. Discipline builds perfection, and reverence fosters beauty. It is no wonder that Japanese ‘washoku’ cuisine has been declared a UNESCO Intangible Cultural Heritage. 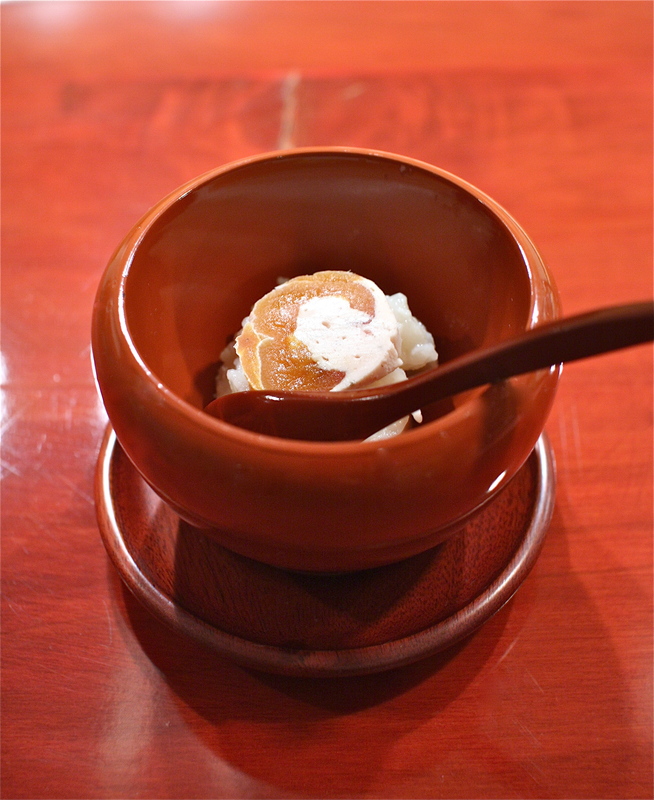 Here are some of the gastronomic highlights of my incredible 2013 journey through Japan. 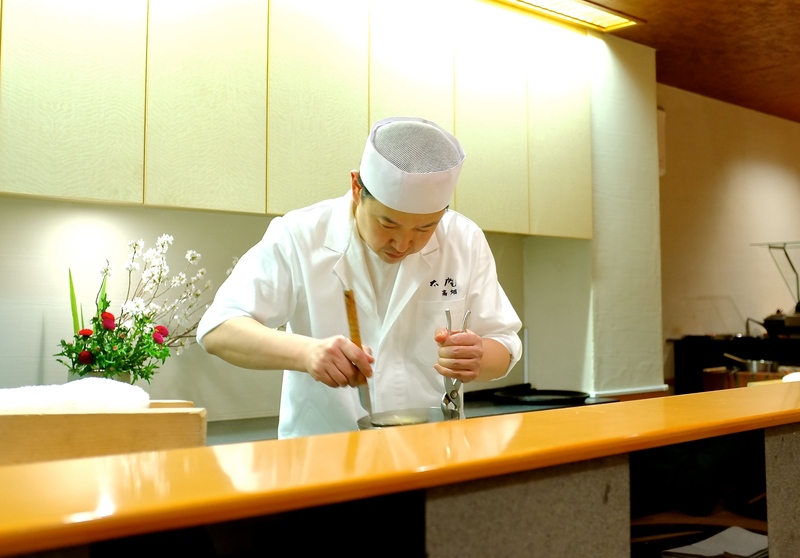 Chef Toshiya Kadowaki works quietly behind the quaint 6 seat counter at his 2 Michelin star restaurant in Azabu Juban. His movements are also quiet- more like, precise. He moves through his kitchen with grace and ease, demonstrating not a millimeter of unnecessary superfluous movement. He is a master at incorporating Western ingredients into his cuisine which generally follows a traditional kaiseki sequence and style. 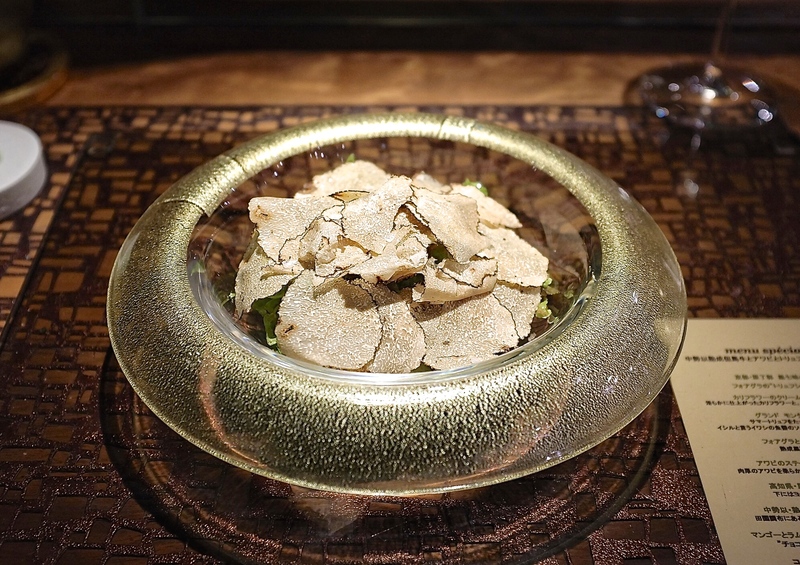 The energy in the restaurant crescendoes when he prepares the grand finale of the meal- Italian black truffle rice. Kadowaki’s excitement for his signature dish is palpable in the way that he vigorously and unabashedly shaves copious amounts of black truffle over steamed white rice. 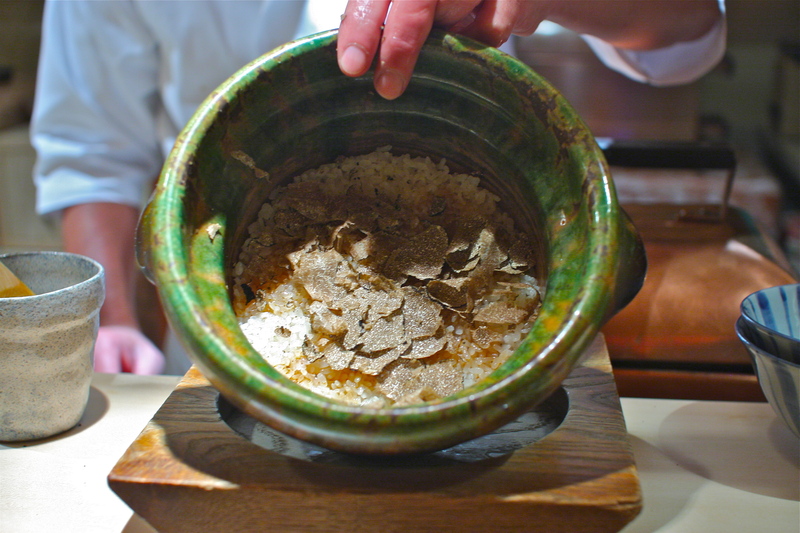 That distinct truffle aroma fills the air and diners respond with oohs and aahs. It tastes just as one would imagine- like heaven. 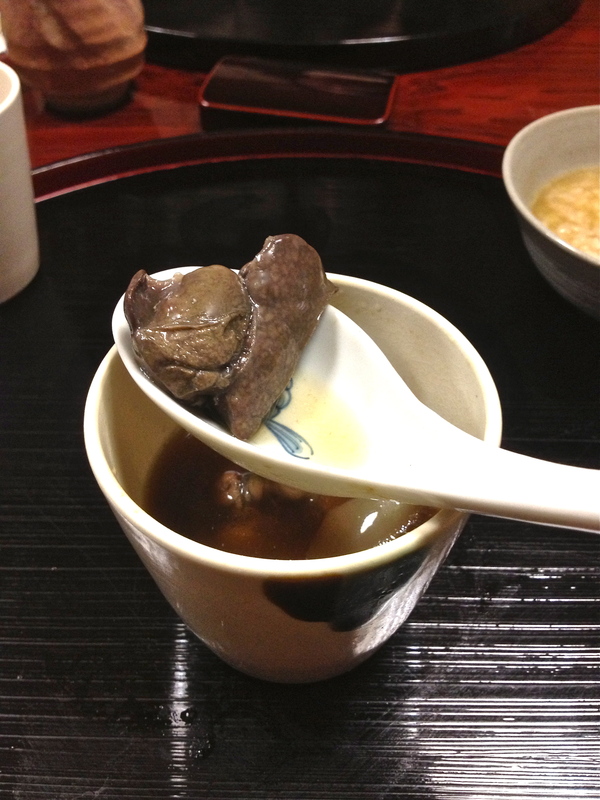 There are many places in Japan to enjoy suppon cuisine, where snapping soft-shelled turtles are prepared in a bubbling broth that is said to have incredible health benefits. 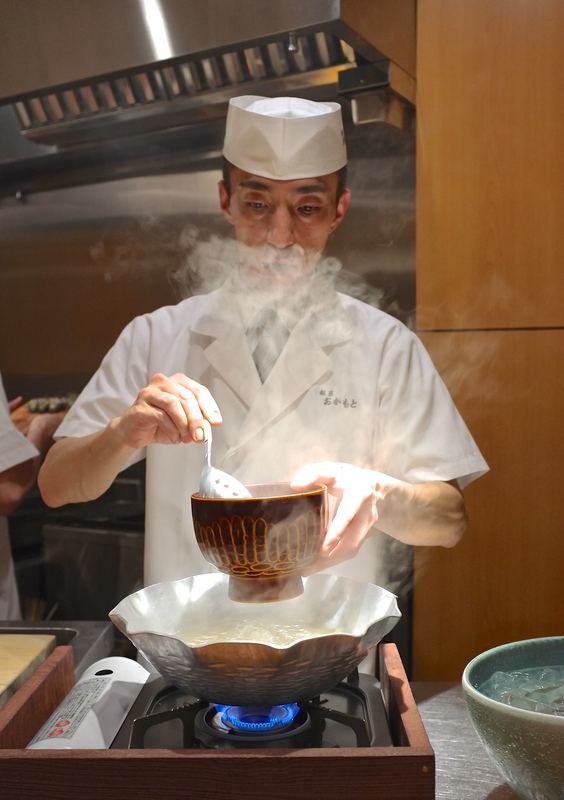 Sakuma in Akasaka is perhaps the most exclusive of them all, using a 330 year old traditional method of turtle preparation for their famous suppon nabe, cooked in a special Shigarakiyaki clay pot. The seasoning is simple- soy, sake and a smidgen of ginger- for the turtle meat infuses its intense flavors into the hearty broth that is rich with amino acids. The meat, incredibly tender, falls off the bones, and the quivering skin, popular amongst the ladies for its high collagen content and beauty benefits, melts like butter. For me, the highlight is the light and airy turtle liver, a delicate piece of foie that easily succumbs to my bite like meringue. 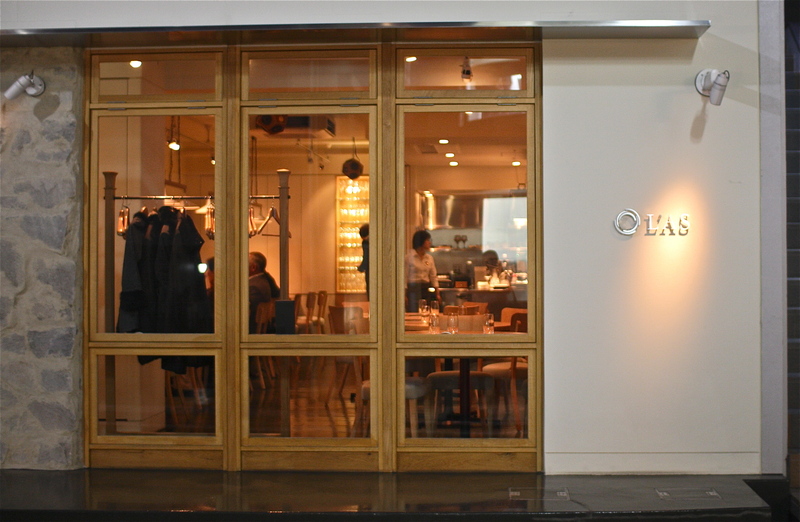 Chef Daisuke Kaneko’s 1-1/2 year old French restaurant in Aoyama was like a breath of fresh air in the Tokyo food scene. Diners immediately took to the casual vibe of L’As where the chef ditched the white tablecloths for simple sleek wooden tables, and offered affordable prix fixe menus that would be brought out from the beautiful open kitchen, course by course, by the chefs. The concept was simple but the flavors certainly were not. His signature foie gras sandwich, an ode to the famous Häagen-Dazs ice cream treat loved by all, was, for me, even better than the original. A thick block of rich foie gras sandwiched between crispy thin wafers and coated on the side with red wine and lemon cream still makes me scream for more. Shigeyoshi is, quite simply, my favorite restaurant in the world. The food stays true to traditional Japanese ‘washoku’ and nobody else does it quite like Chef Kenzo Sato. He depicts the very soul of Japanese cuisine, never steering from what is in season and never tampering a second more with an ingredient that is already a perfect creation of nature. 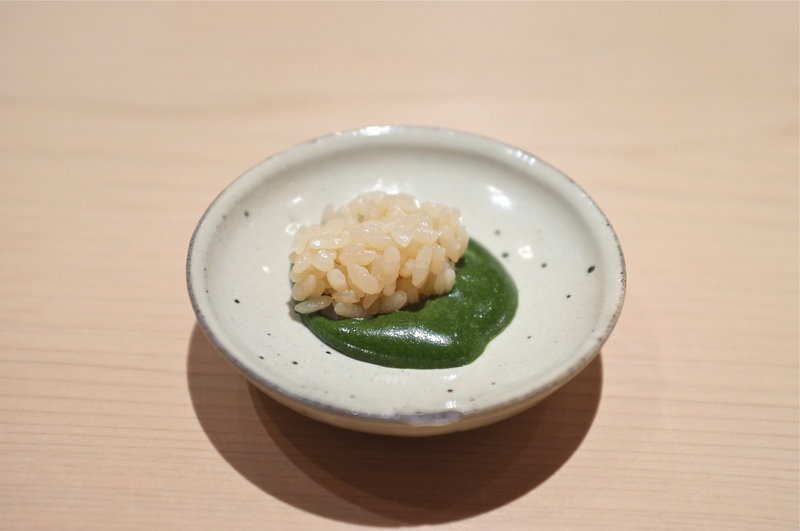 I have been eating at this 2 Michelin Star restaurant for about a decade or so, and every single meal teaches me something new about Japanese cuisine. This year I enjoyed moroko, fish the size of my finger, only found in Lake Biwa in Shiga Prefecture. Moroko are hard to come by these days, as the growing colony of black bass that have overpopulated Lake Biwa love to eat these little delicacies as much as I do. There’s a distinct bitterness to moroko that I absolutely love, and eaten whole from head to tail, it makes for a most wonderful ‘sake no tsumami’. January and February are the best months to enjoy fugu, pufferfish known for its lethal tetrodotoxin. One requires rigorous training and a special certificate to have the privilege of preparing this ocean delicacy. The flesh itself doesn’t have much flavor when prepared traditionally as sashimi, but it takes on a wonderful succulent texture and juiciness when battered and deep fried. 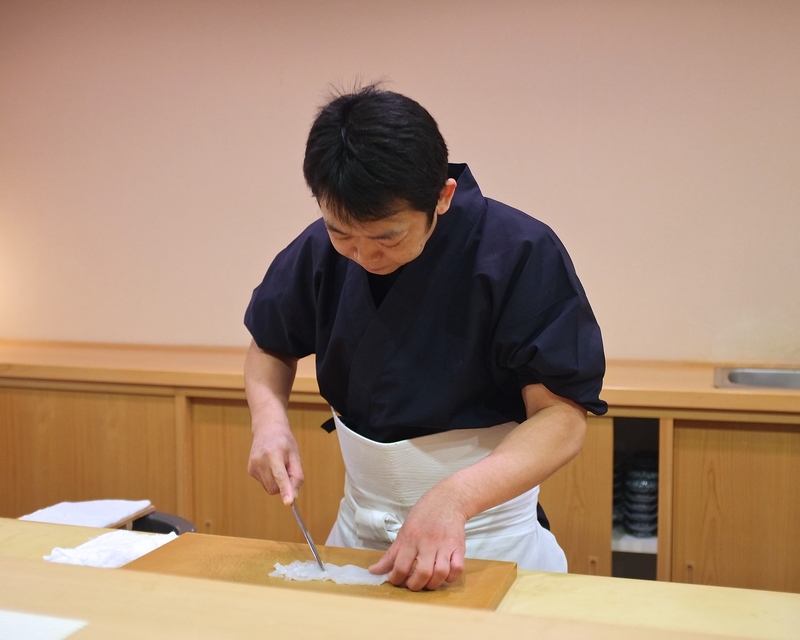 Yukicho, an exclusive Japanese ryotei in the heart of Ginza with private ozashiki dining rooms, has been preparing fugu for more than 80 years. 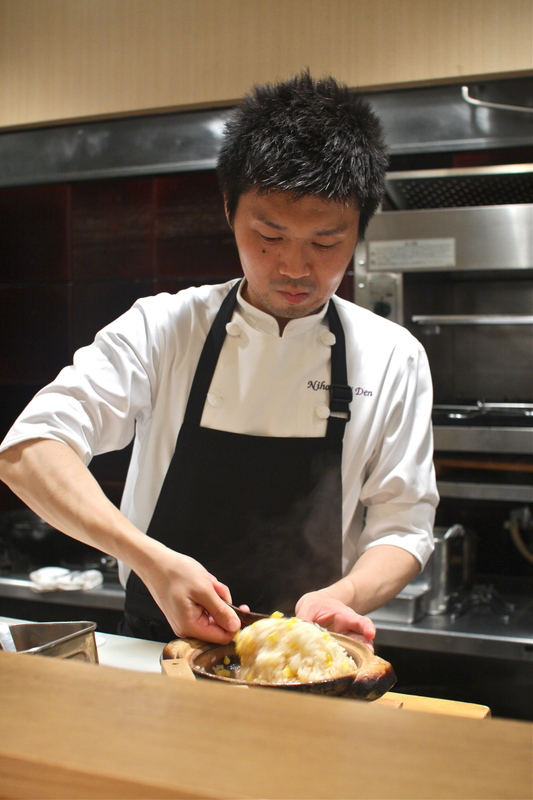 The current chef, Chef Ishii, carries on the restaurant’s tradition of unrivaled excellence in fugu cuisine. 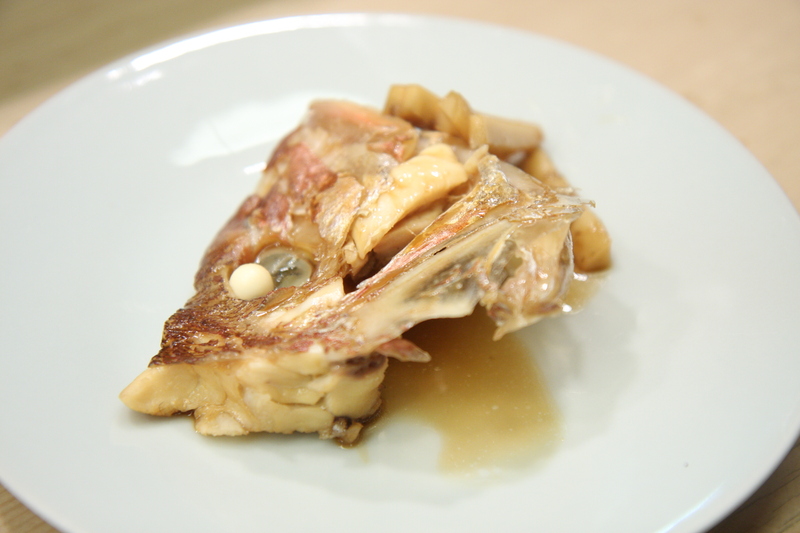 Better than fried chicken, a bite of this fried fugu will completely change your world. It changed mine. Chef Shinobu Namae has trained with some of the world’s best- Michel Bras in both Hokkaido and Laguiole, and Heston Blumenthal at The Fat Duck. Now, in his Michelin-starred Azabu restaurant, he infuses his unique flair into beautiful dishes that marry classical French techniques with seasonal ingredients. 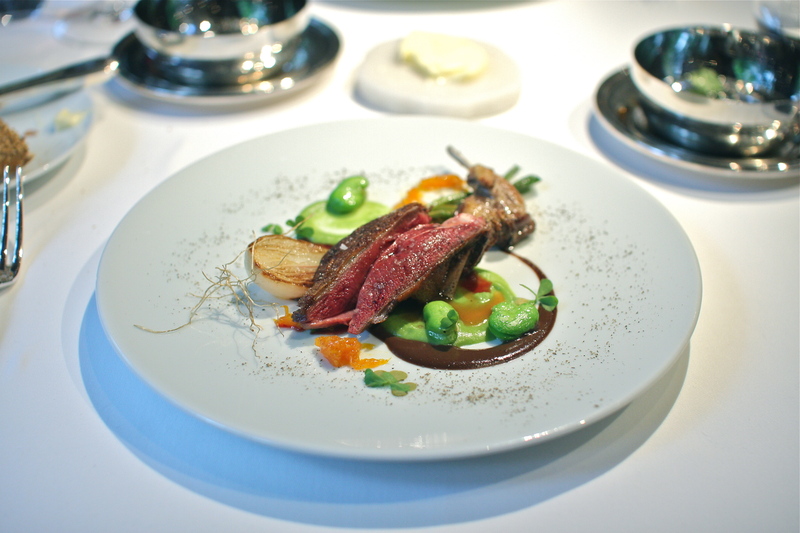 Vendée pigeon roasted to perfection was served with an intense savory liver jus, with pea purée, broad beans, spring onions, Kiyomi mandarin marmalade and wood sorrel leaves. 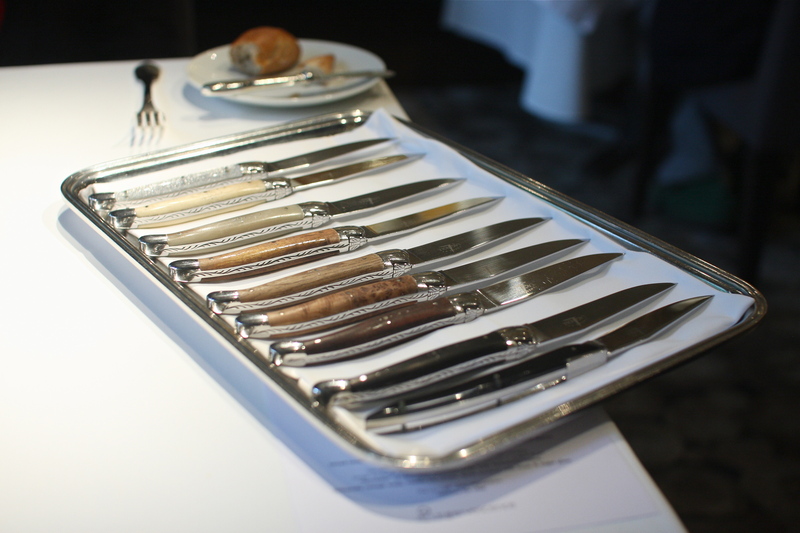 The icing on the cake when enjoying this memorable dish was the silver tray of Laguiole cutlery from which we could choose our knife du jour. 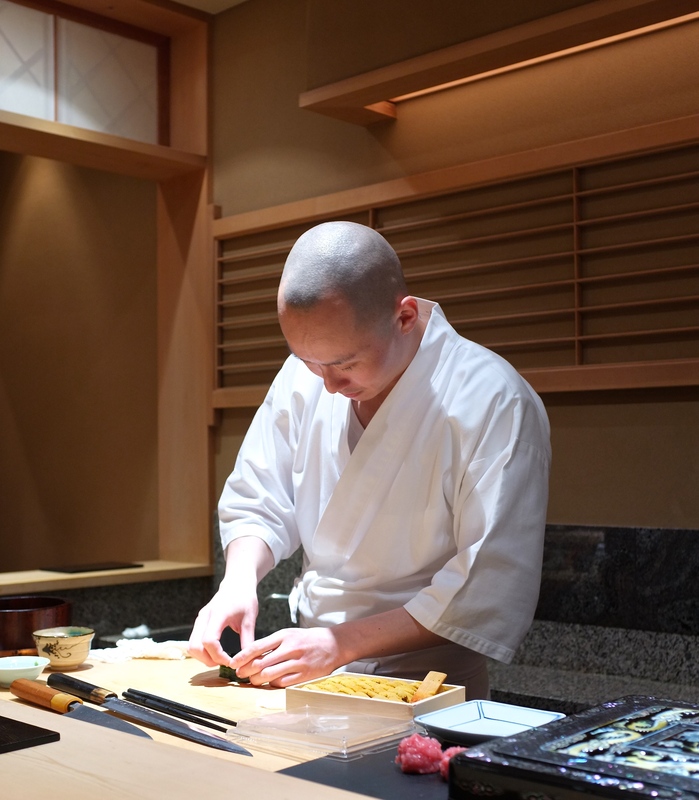 Michelin starred Den quickly became one of my favorite restaurants in Tokyo for many reasons. First, the creativity. 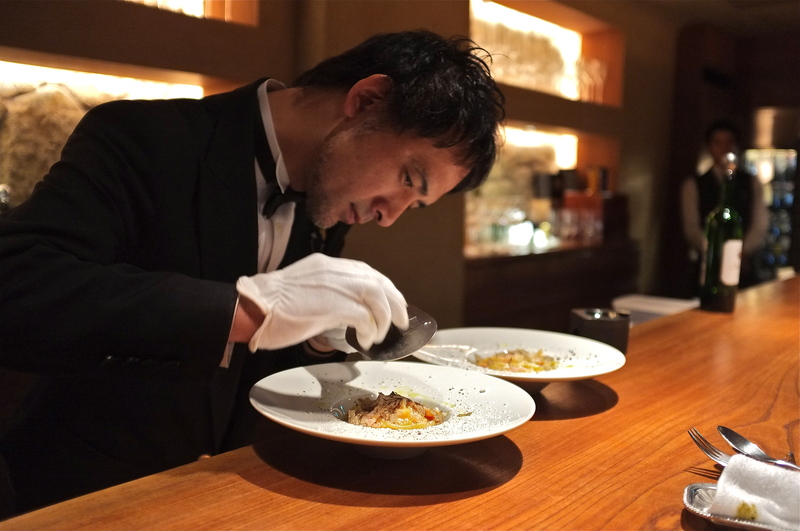 Dining out should be fun, interactive and memorable, and Chef Zaiyu Hasegawa makes sure that every guest that steps foot inside his Jimbocho restaurant enjoys the experience from beginning to end. 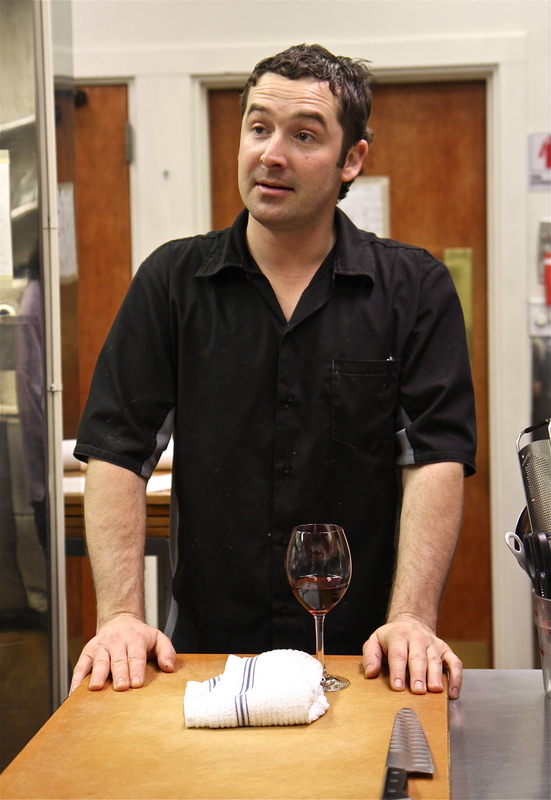 He brainstorms daily with his staff about new ideas that could surprise and delight his diners, and loves to incorporate playful elements into all of his dishes. 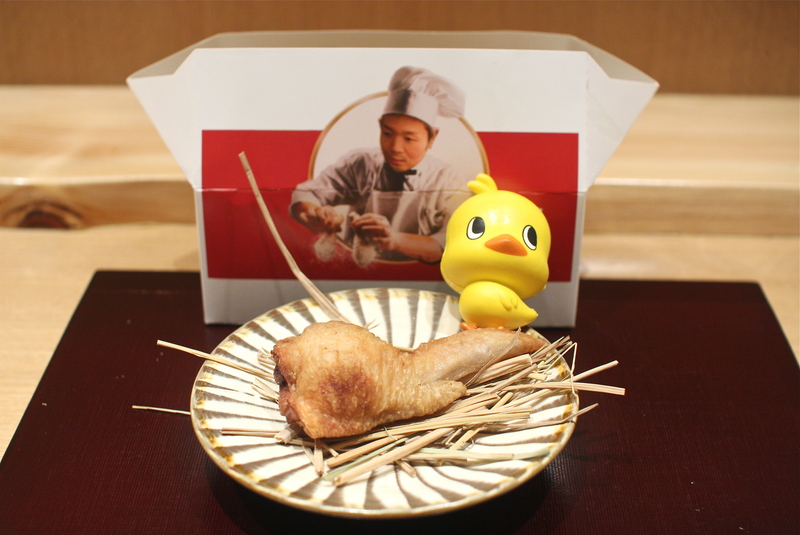 Dentucky Fried Chicken, aka DFC, is Den’s signature dish, presented in a specially designed ‘take-out’ box with a photo of Colonel Hasegawa. Out comes a mouthwatering deep fried chicken wing stuffed with seasonal ingredients- on a summer visit, my DFC wing was stuffed with almond, cumin, cinnamon, turmeric and raisins. On an autumn visit, my wing was stuffed with a variety of mushrooms. This succulent chicken wing sure is finger lickin’ good. Another reason for loving Den? The flavors. The overall vibe during a meal at Den may be playful and fun, but there is a reason why this popular restaurant maintains its Michelin stars. 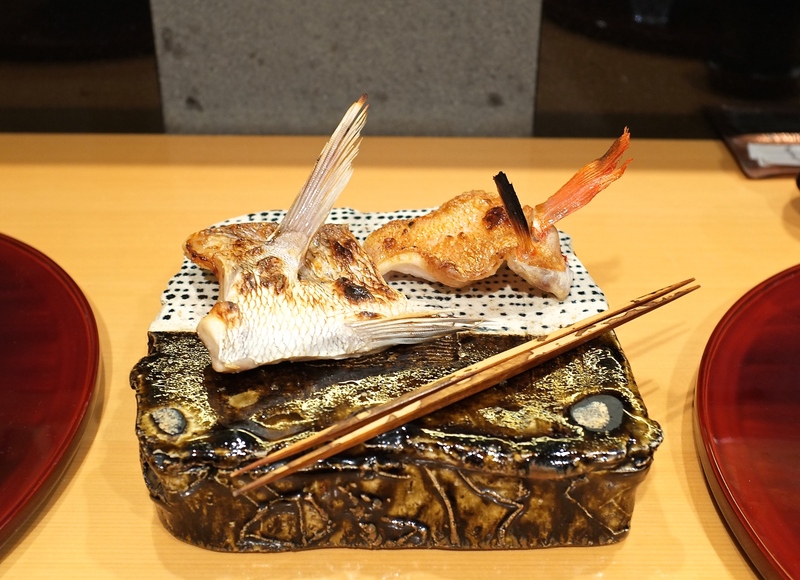 I still dream about this ayu course during a summer visit to Den, with ayu dried for 6 hours then grilled and eaten whole from head to tail. Tade (water pepper) leaves, which are usually paired with ayu, were incorporated into warm rice flour bread which I thoroughly enjoyed with the most delightful ayu liver pâté. To this day, I still talk about this dish and hope to experience it again next summer. Den gets 3 spots on this year’s list for all of the times that I made a visit, and for what I love most about this fantastic restaurant- the hospitality. The staff at Den takes Japanese hospitality to a whole new level, treating every diner like family and going way above and beyond. When I dined here in the fall with The Spanish Hipsters to celebrate their nuptials, it quickly became apparent that the staff had been planning a special celebration for weeks. A lot of thought went into every detail of the meal to personalize it for the Hipsters, and we had a night to remember. 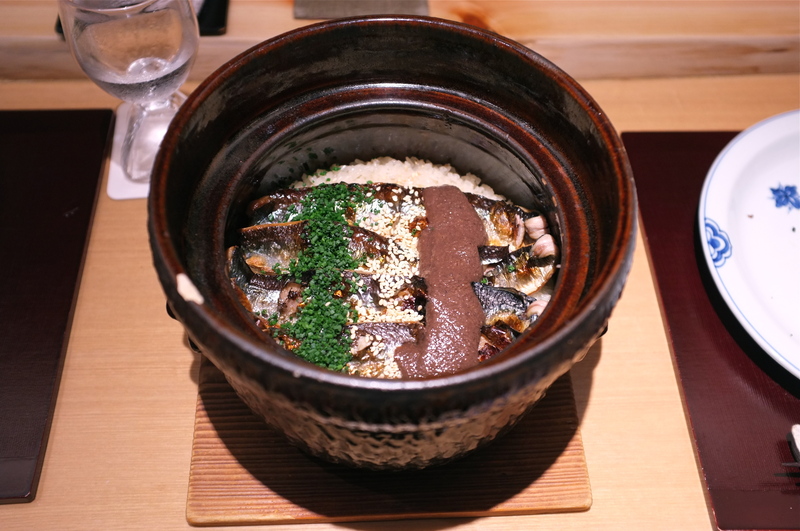 Our experience included this sanma gohan, steamed rice with saury pike at its autumn peak with a luscious rich liver paste. We laughed, we ate, we toasted and drank, and the house mascot Puchi even came to join the party. Mille Caresses. Where do I even begin. 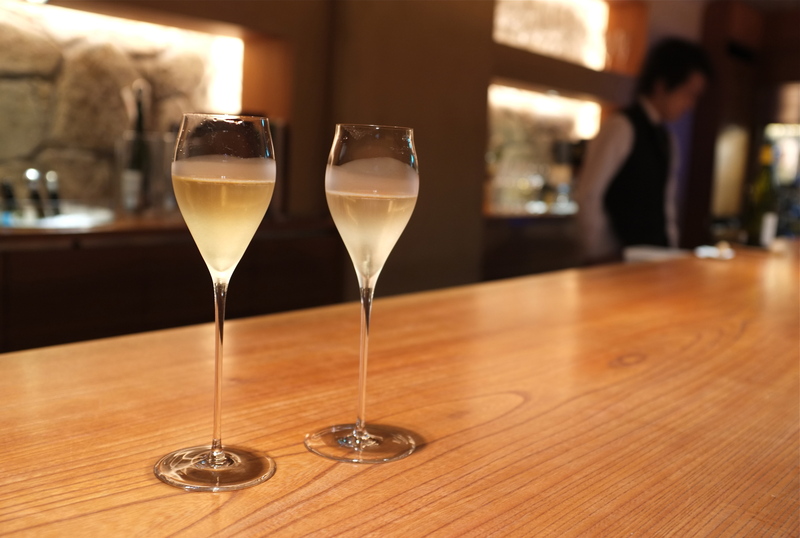 I stumbled upon this exclusive wine bar in Osaka by chance, and it felt like I hit the jackpot. There are tables in the back of the restaurant, but the action is at the bar counter where Sommelier Kibi works his magic. 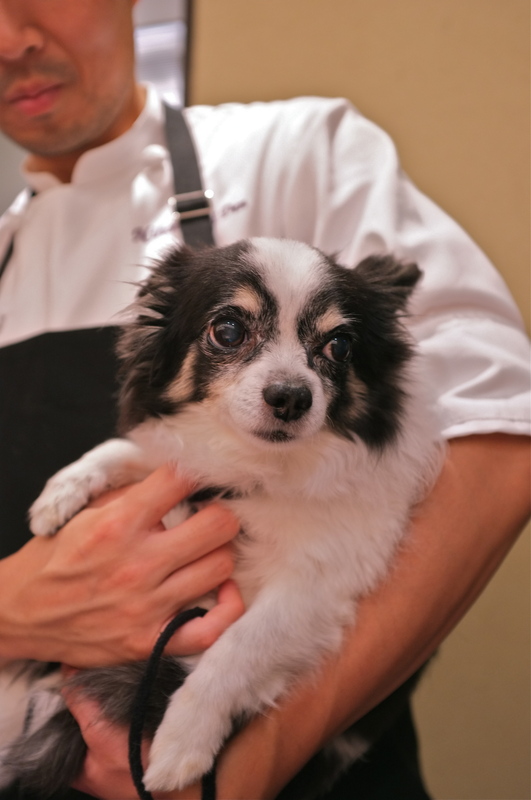 He wears special white gloves to handle truffles, keeps his wines cradled in padded baskets, and treats his customer with just as much respect- a true professional. 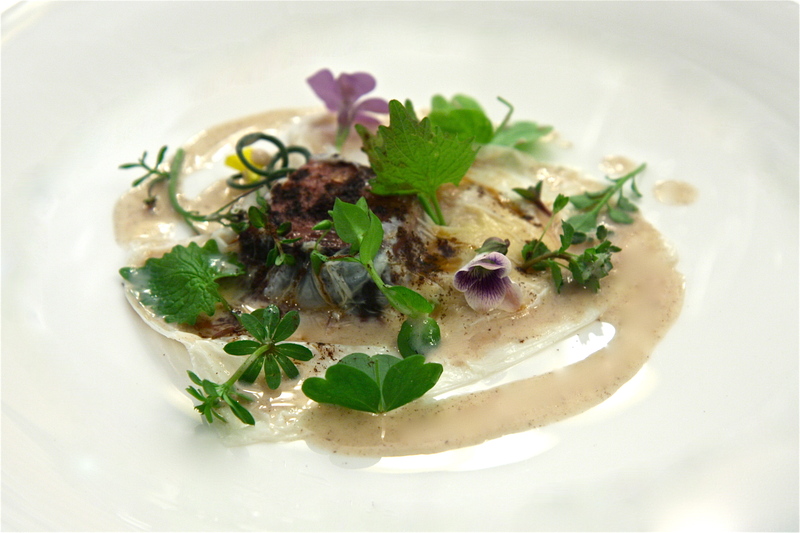 I’ve had a lot of great abalone dishes in my life, but this one by Chef Youichi Kaito takes the prize. 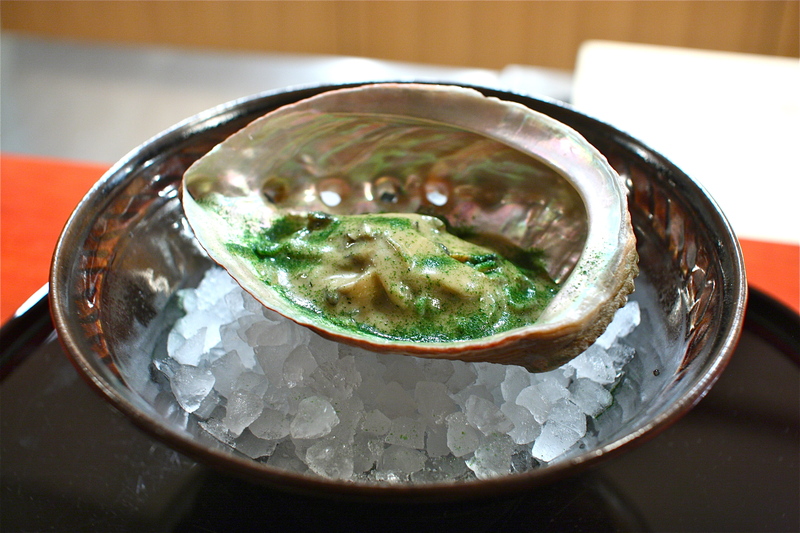 Roasted abalone from Shimane prefecture in abalone liver sauce was fantastic beyond belief. The abalone- tender, juicy and succulent with an ever so subtle char at the fringed edges- and that decadent liver sauce- buttery, rich and creamy with a depth of flavor too incredible for words- brought tears to my eyes. 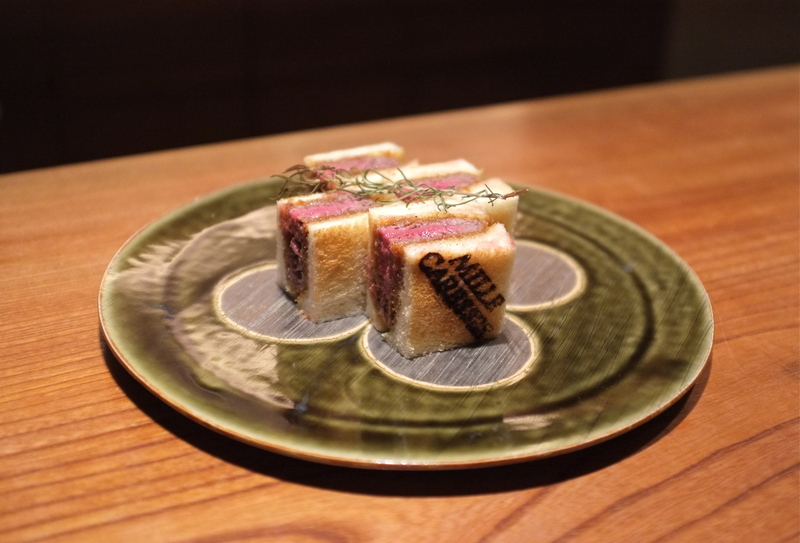 The pure awesomeness that is Mille Caresses in Osaka was also felt in their signature dish, the wagyu katsu sandwich. Miyazaki wagyu tenderloin, breaded and deep fried to a perfect rare, then sandwiched between toast with a lovely sauce made from onions and fruits, was as tender as room temperature butter. The course even came with a certificate indicating that our cut of Miyazaki beef came from cow #13349653555. A dish to remember. 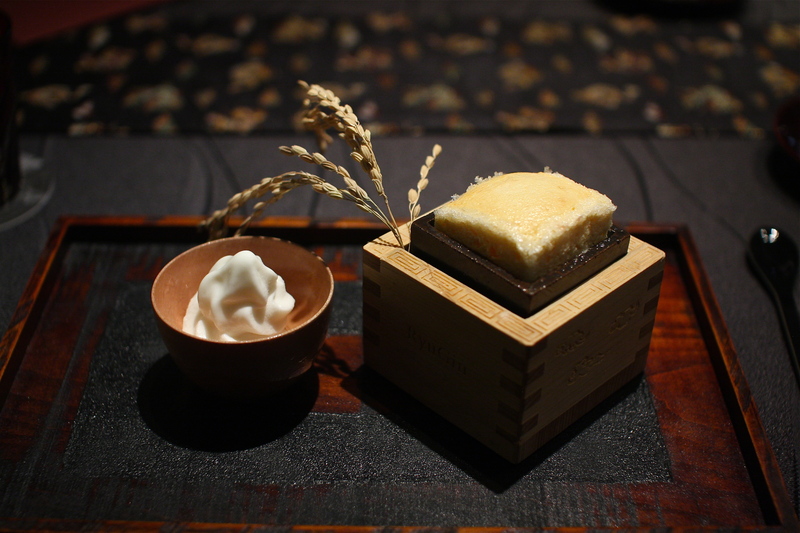 Ryugin keeps getting better and better, living up to its promotion to 3 Michelin stars. Chef Seiji Yamamoto runs a tight ship at his Roppongi restaurant where the service and the courses seem to flow effortlessly. A recent revisit was right up there as one of the best meals of my life, and the highlight for me was their autumn harvest sake dessert. I went back and forth with my spoon, enjoying both the silkiness of the cold amazake soft serve and the warm fluffiness (and such enticing aromas!) of the sake soufflé. The juxtaposition of temperatures and textures was both pure genius and pure pleasure. There is no ingredient that tests the knife skills of a chef more than hamo, pike conger eel, which has rows of tiny coarse bones that are impossible to remove. Only an experienced chef with superior knife skills can perform honegiri (which means ‘bone cutting’ in Japanese), a process of making precise incisions into the bones without cutting through the skin or destroying the flesh. When a properly incised piece of hamo is blanched in hot water, it should blossom like a chrysanthemum flower with perfectly even sections, and create a light and fluffy texture. 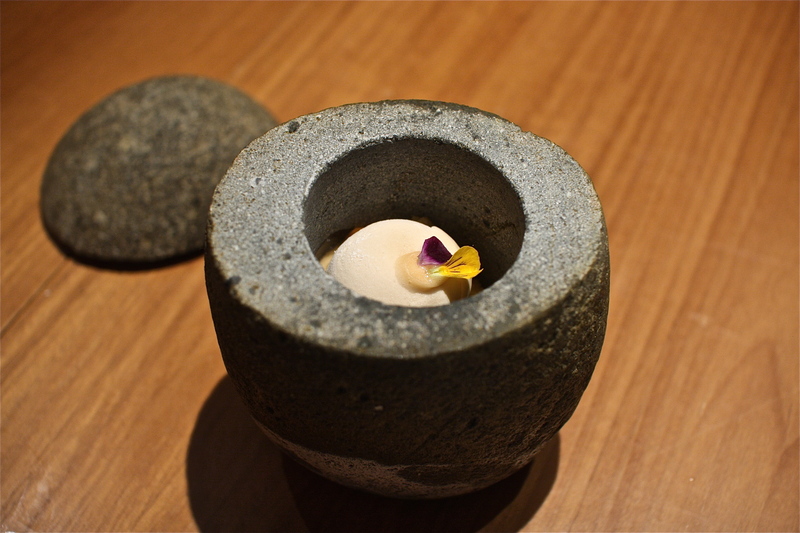 The hamo by Chef Yamamoto at Ryugin was the most perfect demonstration of hamo workmanship that I have seen to date. 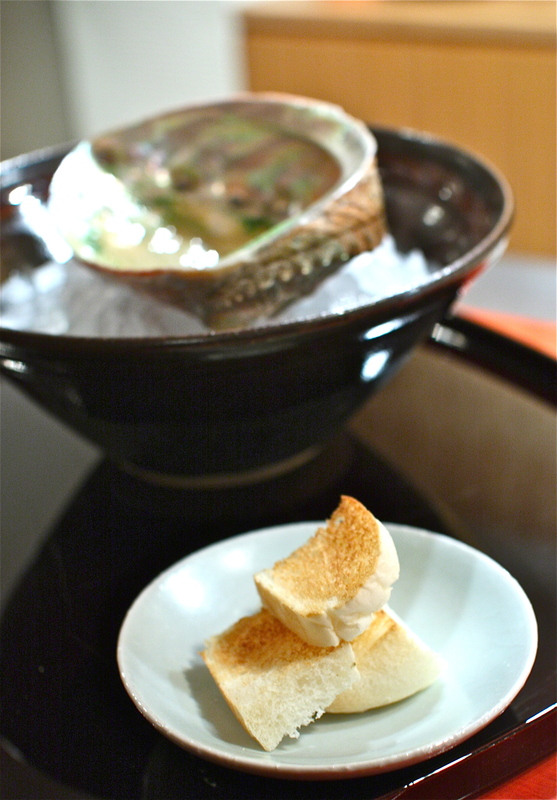 It was stuffed with sweet caramelized kamo-nasu eggplant and served in a wonderful bonito ichiban dashi. 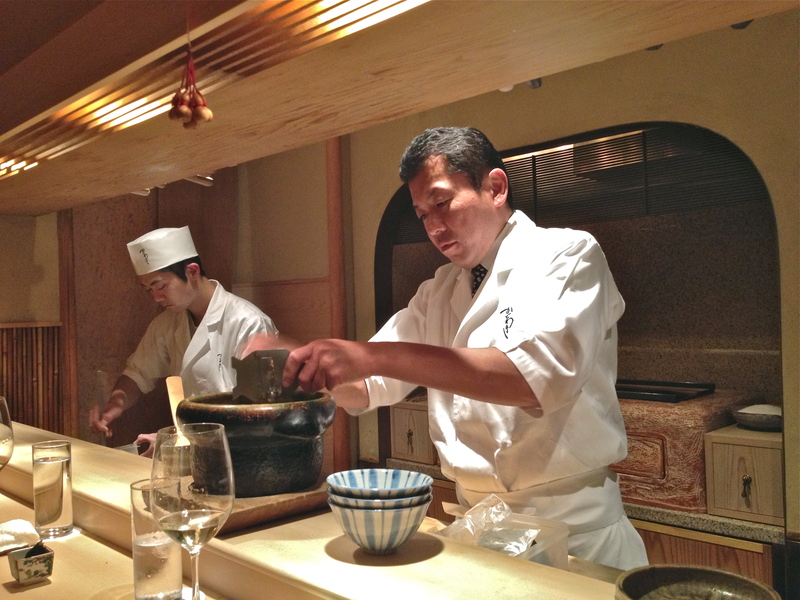 Ishikawa, right in my neighborhood of Kagurazaka, has maintained its 3 Michelin star status for some time. 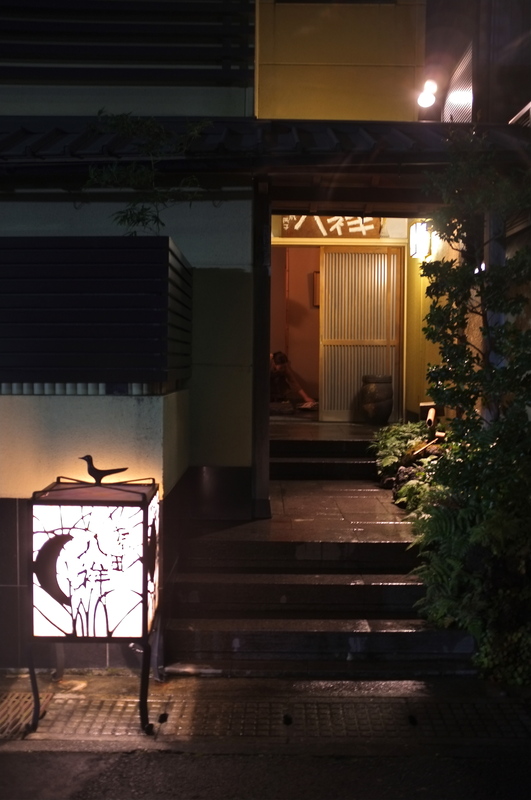 Located on a quiet cobblestone side street behind the famous Bishamon Temple, the food here stays true to traditional Japanese kaiseki style, honoring seasonal ingredients and treating them with great care and utmost respect. 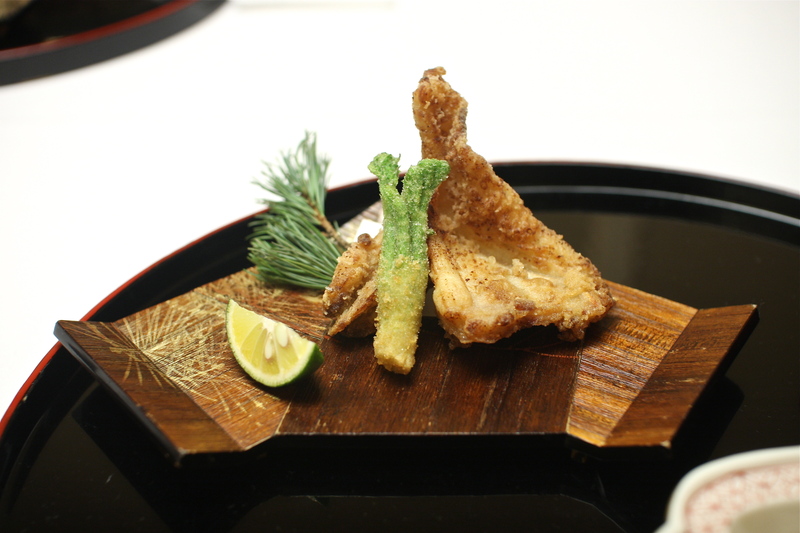 Chef Hideki Ishikawa mesmerized me with this dish that symbolized the transition of summer to autumn- crispy deep fried ayu at the tail end of their season, mixed with grated daikon mizore ankake and plump lime green shin-ginkgo at the very start of their season. The overlap period of these 2 beautiful ingredients is very brief, and Chef Ishikawa created a successful and delicious mariage. 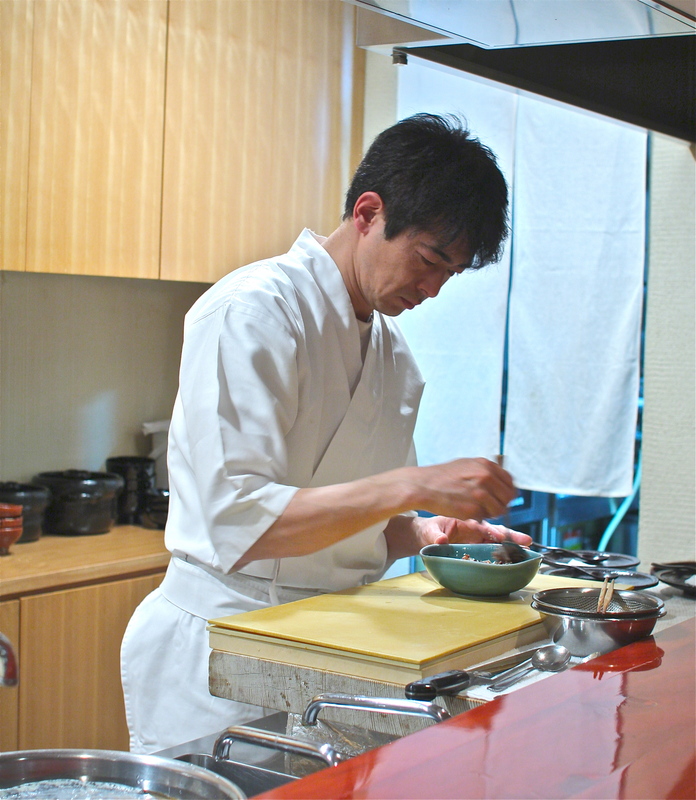 Many of Japan’s finest chefs have trained with Chef Haruyuki Takada at the legendary Takada Hassho in Gifu Prefecture. A trip to Gifu during the fall proved to be an incredible cultural experience for me, attending the knife festival in Seki, observing the ancient art of cormorant fishing on the river at dusk, and sharing a fabulous kaiseki dinner with friends at Takada Hassho. The signature dish is called ‘hari hari’, made with extremely thinly sliced potatoes (by hand, of course), lightly blanched, mixed with tobiko and rolled into a sphere like a ball of yarn. My tongue was absolutely delighted at the playful textures of this dish- the crisp sharp bite to the potatoes, interspersed with little pops of tobiko eggs. 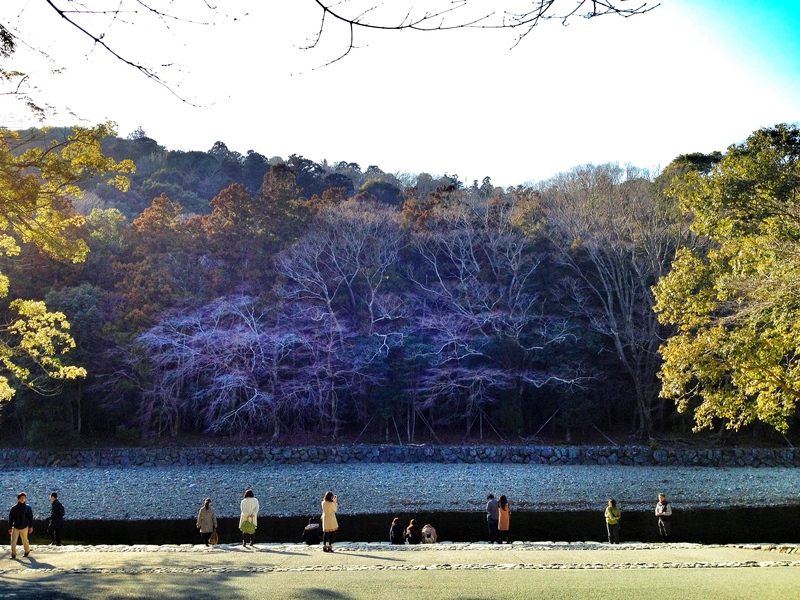 It was a perfect way to end a perfect weekend in Gifu. Of the thousands of sushi restaurants in Tokyo (did you know that there are more then 200 sushi restaurants in Ginza alone?) Sushisho Masa has quickly become one of my favorites, and the place that I recommend the most for visitors to Japan. I love the intimacy of the small space and the friendliness of the staff, but most of all, the mind blowing diversity of sushi that one gets to experience in one sitting. 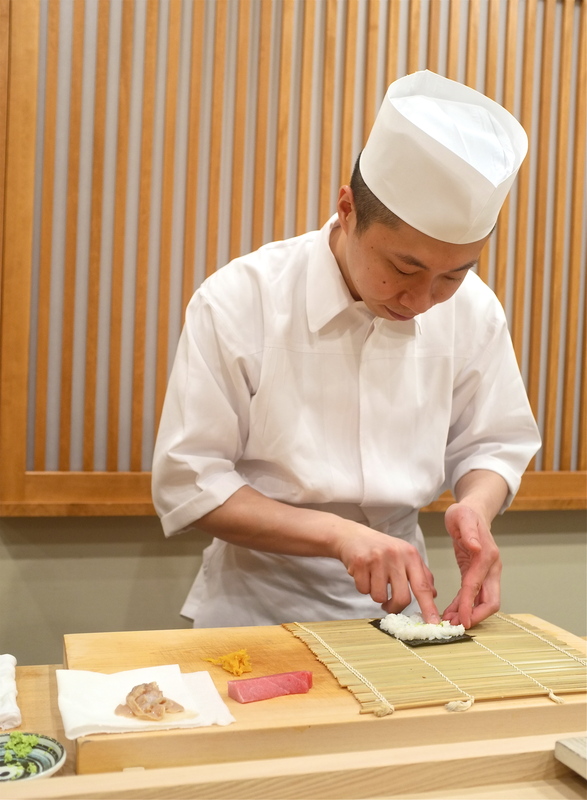 Chef Masakatsu Oka whips out more than 40 to 50 perfect little bites, taking the time to explain where each slice of fish came from and how he prepared it. His signature nigiri is what he calls the ‘Masa-feuille’, 3 thin slices of pristine o-toro with a generous dab of wasabi in between, creating a triple layered mille-feuille that magically lightens the fattiness of the tuna while enhancing its exquisite flavors. The toro melts so quickly that it almost evaporates, leaving you begging for more. Prize winning Miyazaki wagyu from Iki Island is the specialty at Ginza Miyama, a teppanyaki steakhouse in the heart of Higashi-Ginza. We even got to see the special trophy that our cow had won prior to its slaughter. The marbled beef was incredible. However, what took my breath away that evening was the meaty abalone from Iki Island, still very much alive and squirming as it hit the sizzling hot teppanyaki plate in front of us. We watched in awe as the chef showed us the plump abalone liver- a deep magical green color so intense and bright that it was practically turquoise. 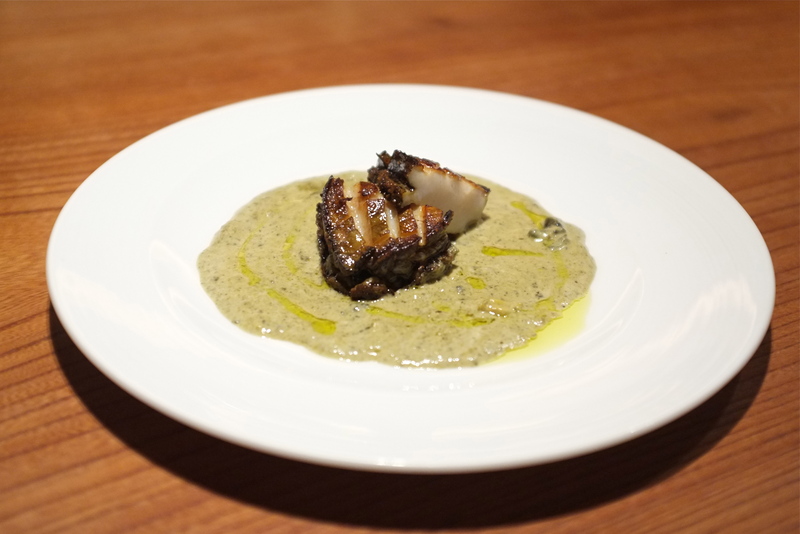 ‘It’s the color of the seaweed in the waters around Iki Island that the abalone feed on’, the chef told us, as he sliced the abalone with his sharp knife and made a sauce with the liver and butter. 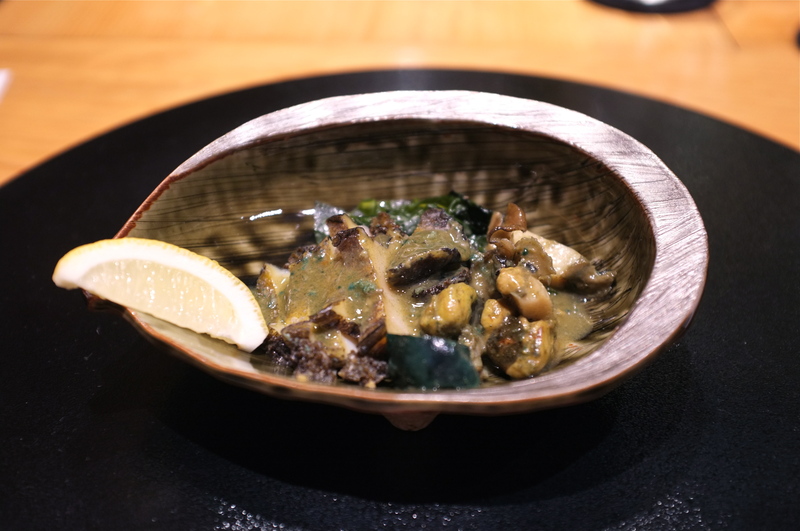 The warm sauce, infused with the essence of this rich seaweed, was slathered over the tender abalone and served in its shell. Perfection. 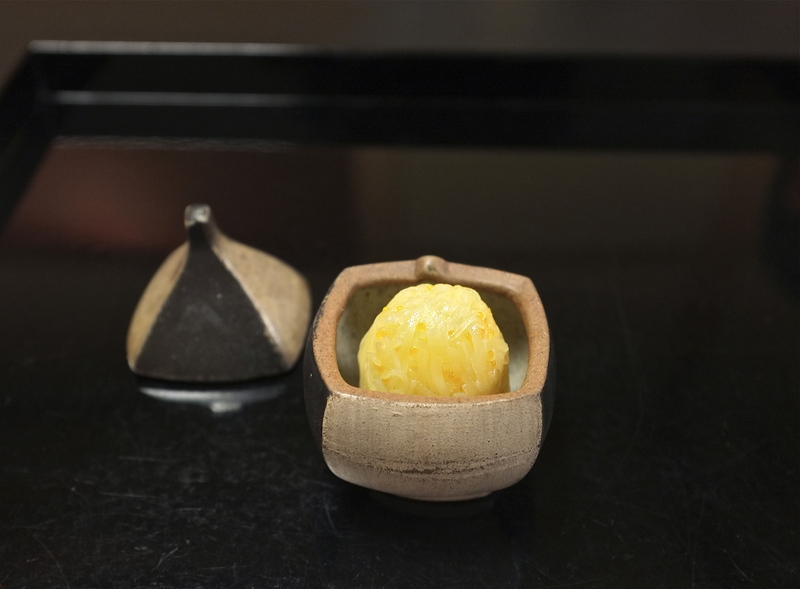 Chef Saotome has been perfecting tempura for as long as many of us have been alive, and he has been collecting art for as long as he has been alive. 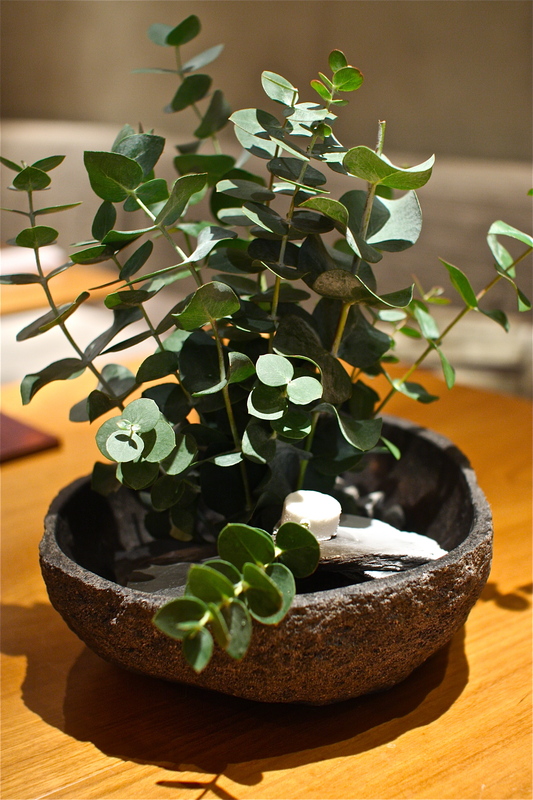 His restaurant, in a quiet residential neighborhood in Monzen-Nakacho, displays beautiful sake chokos, ceramic plates and calligraphy, of which he himself is a master. 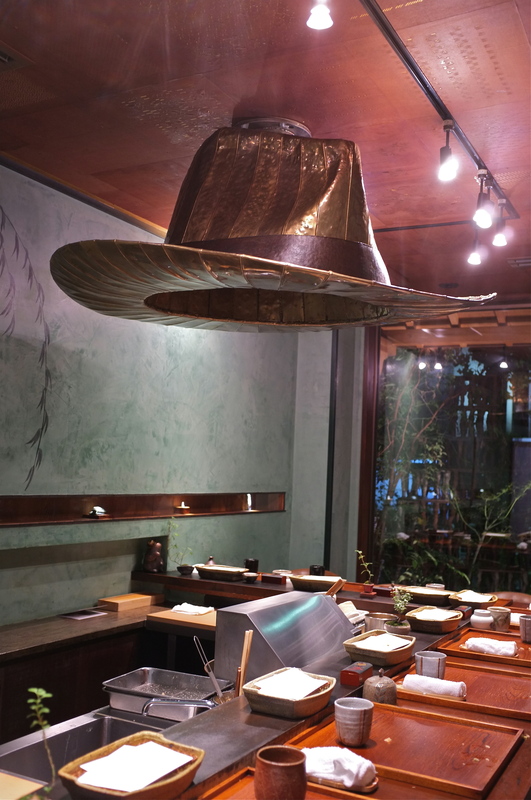 During the meal he stands under the cowboy hat vent, silently focused on frying each seasonal ingredient to just the perfect degree. 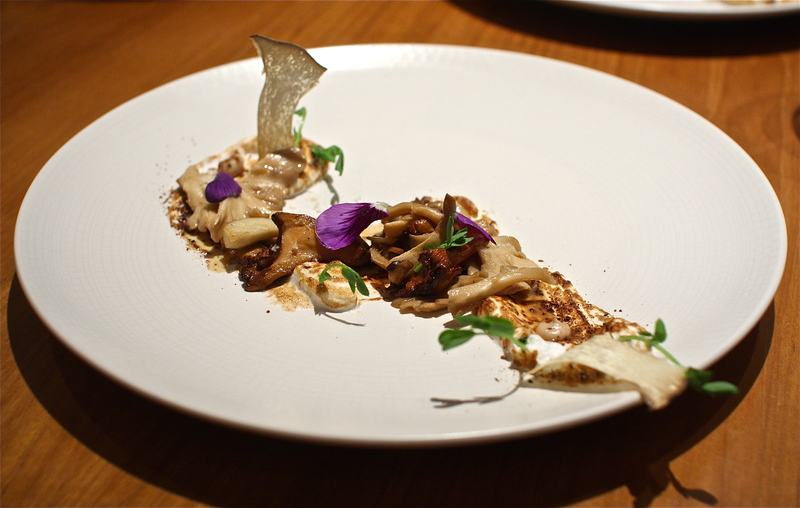 Matsutake mushrooms bigger than my palm, with a spritz of sudachi and a dab of salt, were meaty, juicy and aromatic. Saotome is a man of few words but he speaks through his food, his calligraphy and his art- all of which convey his charisma and vivacity. 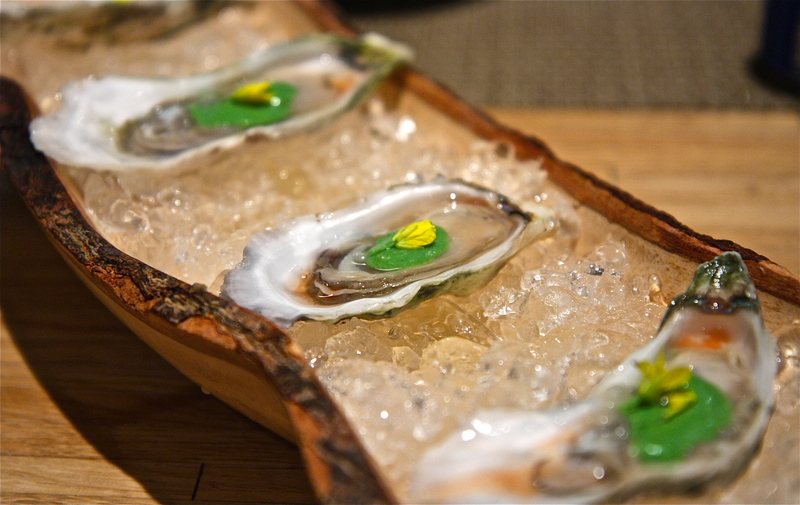 Chef Susumu Shimizu just opened this quaint adorable restaurant in Hatsudai a few months ago. The U shaped counter surrounds the open kitchen where he demonstrates the classical French techniques that he honed at L’Arpege for many years. 6 month old veal from Bretagne cooked in hay was sweet, milky and superb. 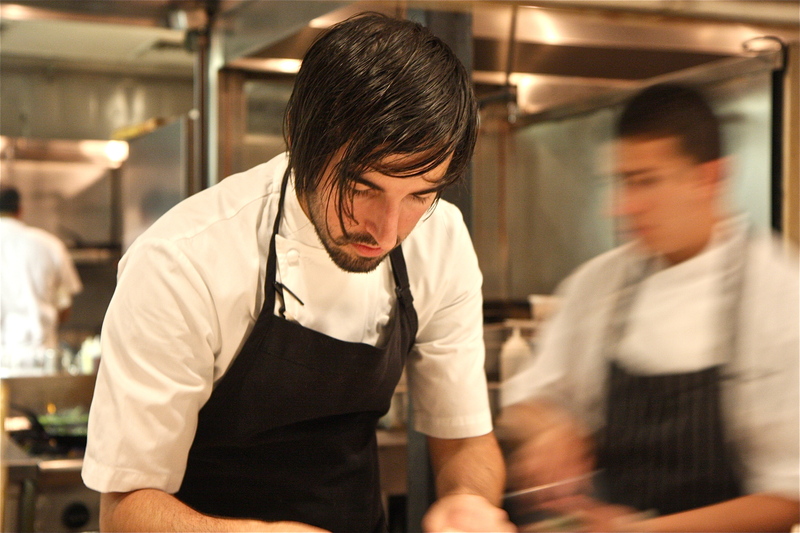 His cuisine and style are both still evolving and I can’t wait to see what happens when he really hits his stride in 2014. He is, for sure, a young talent to keep an eye out for. The shari, the neta, the prep, the ambiance. 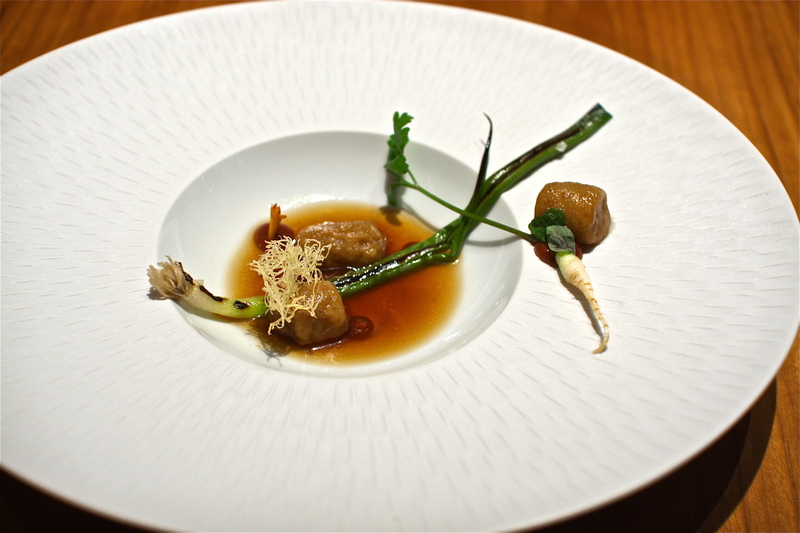 Everything is flawless at 3 Michelin star Yoshitake in Ginza. 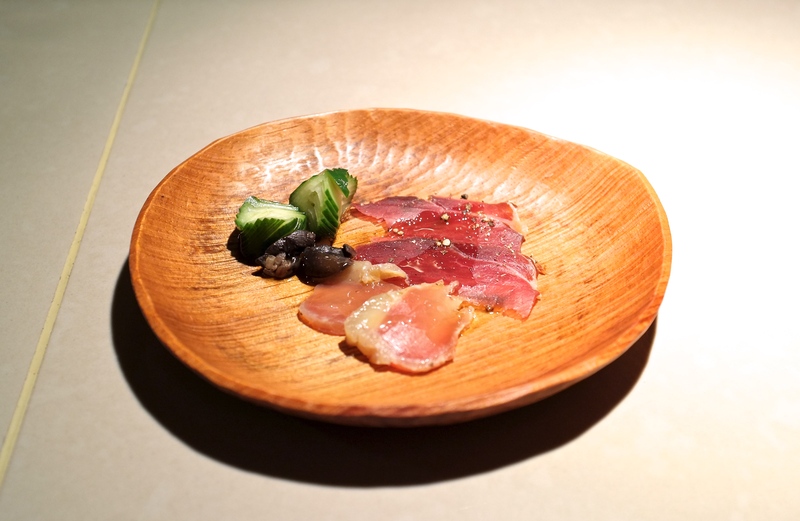 I especially love Chef Masahiro Yoshitake’s shari, made with akazu vinegar that gives the rice a brown hue and a subtle unobtrusive flavor that harmonizes well with the seafood. 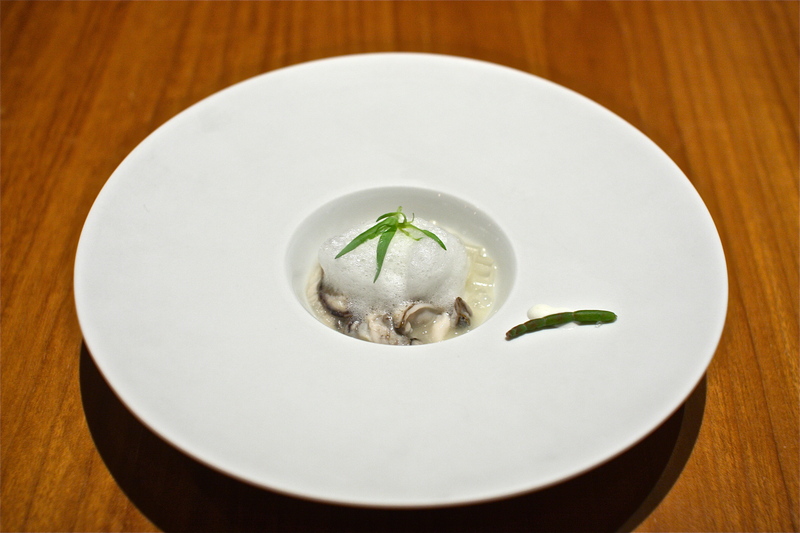 It was highlighted in this course that came paired with a generous serving of tender steamed abalone from Karatsu. 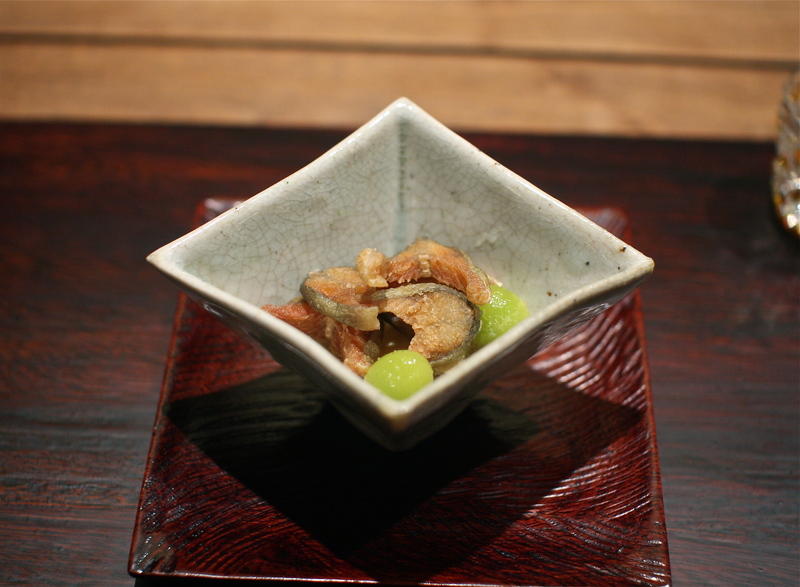 The abalone liver, with a vivid forest green hue, was made into a silky paste and served with a mini portion of shari. It was a joyous and delicious moment in my life. 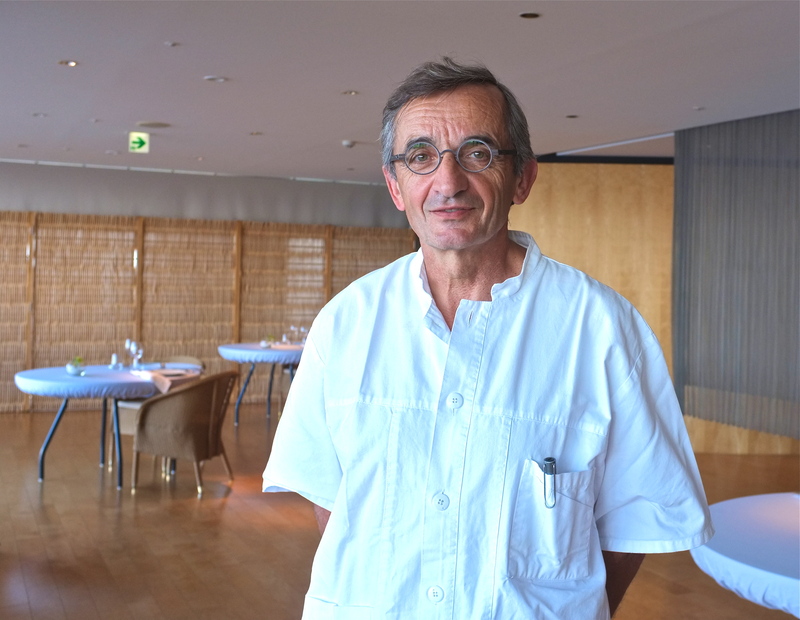 I had been meaning to visit Michel Bras in Hokkaido for a long time, and the stars aligned when I found out, when finally making my reservation, that it was the exact week when Chef Michel Bras himself was to make his annual visit. Ah, serendipity. 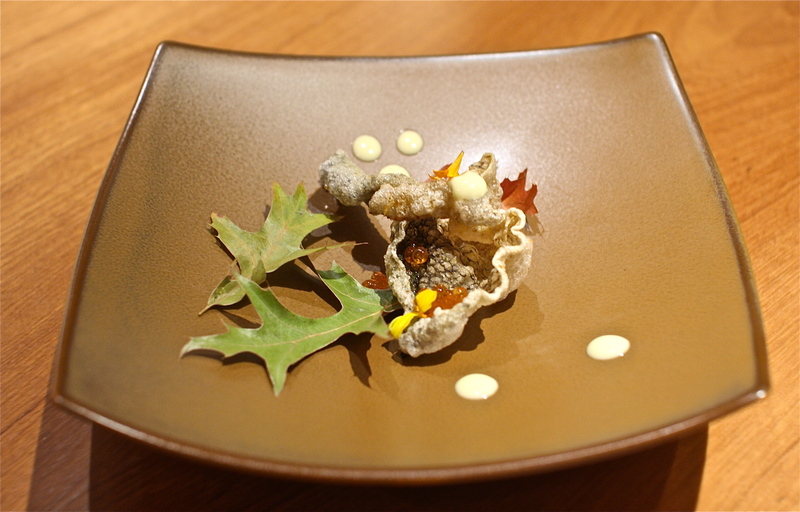 Michel Bras cooking with Hokkaido ingredients was a true match made in heaven, and a food lover’s dream. 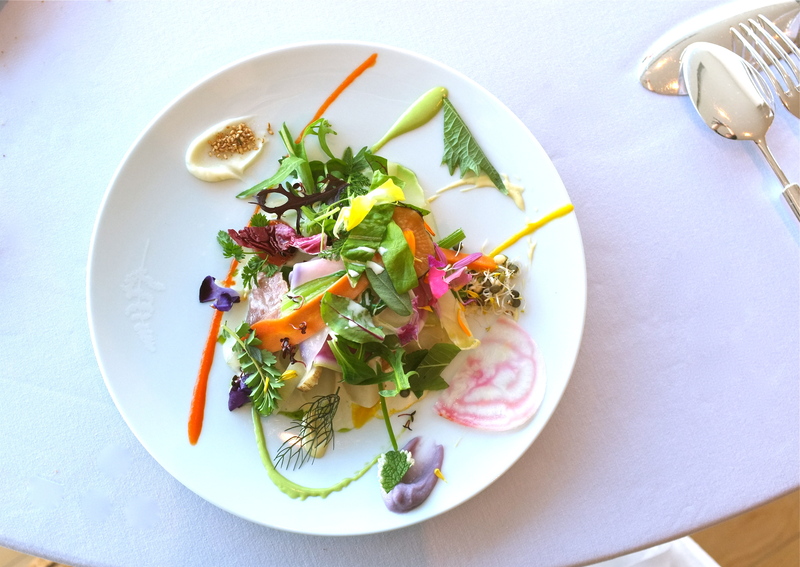 His signature gargouillou of young vegetables, a celebration of Michel’s love for vegetables and herbs, was simply a joy. 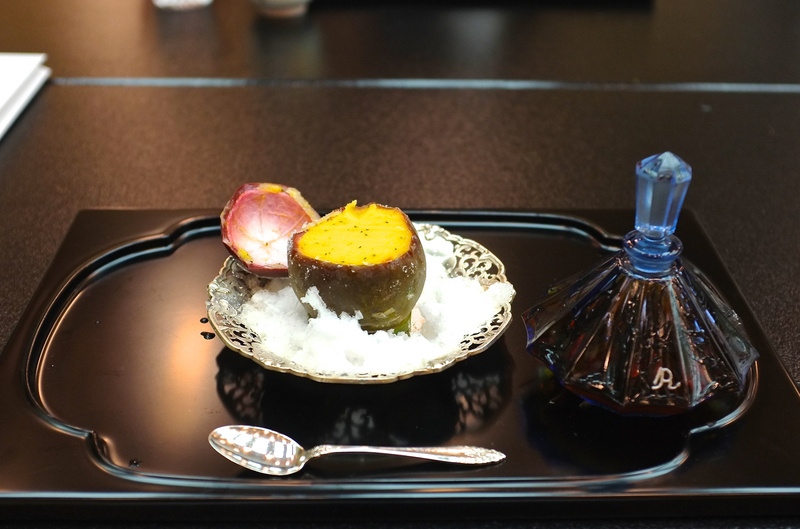 The ‘Terre’ dinner menu, a celebration of Laguiole, featured gargouillou with acacia oil, while the ‘Mer’ lunch menu, highlighting the seafood from Hokkaido, presented it with sansho oil. Both renditions were equally inspiring and lovely, like the maestro himself. No matter who you are, what age you are, or how fancy of a restaurant you may be dining at, when an ice cream cart pulls up to your table, it has the same universal effect- our hearts flutter and we squeal with delight. 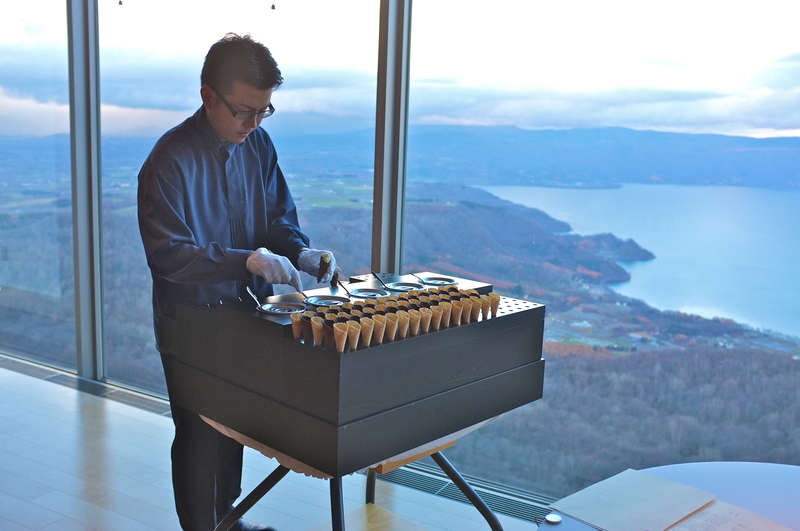 At 3 Michelin starred Michel Bras in Hokkaido, the ice cream cart came with a killer view of Lake Toya and 5 different flavors- apple sorbet sprinkled with anise powder, walnut mousse with hazelnuts in a chocolate covered cone, herb sorbet with balsamic reduction, white chocolate mousse with crumbled pistachios in a chocolate covered cone, and mikan sorbet with crystallized mint. Needless to say, I had a moment. Where to have my one sushi dinner on a recent winter trip to Hokkaido was possibly one of the biggest dilemmas of the year. 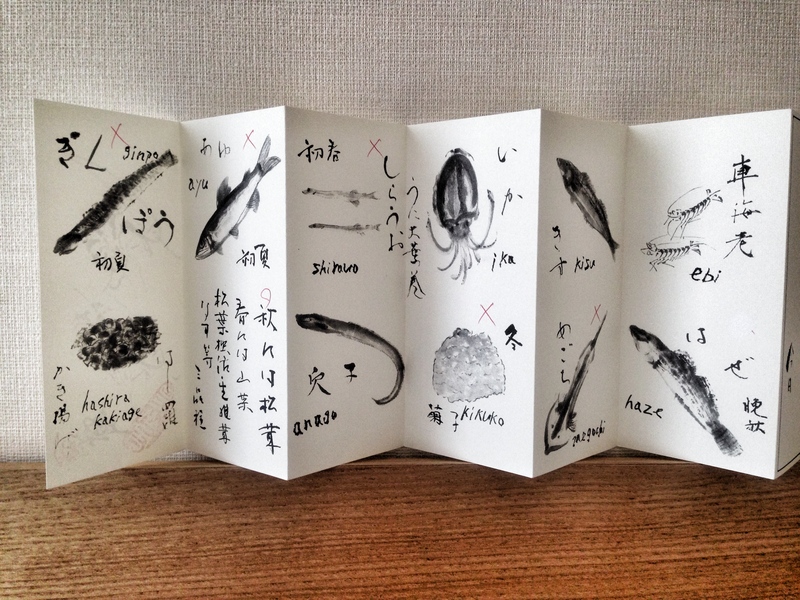 Hokkaido is a treasure box of seafood, and many delicacies are at their peak during the cold winter season. Choosing the right sushi restaurant for this trip was crucial. Thankfully, I chose well. Sushi Hidetaka in Sapporo is only a year old, but already quite the popular place. I sat next to a diner who flew from Tokyo just to eat here. 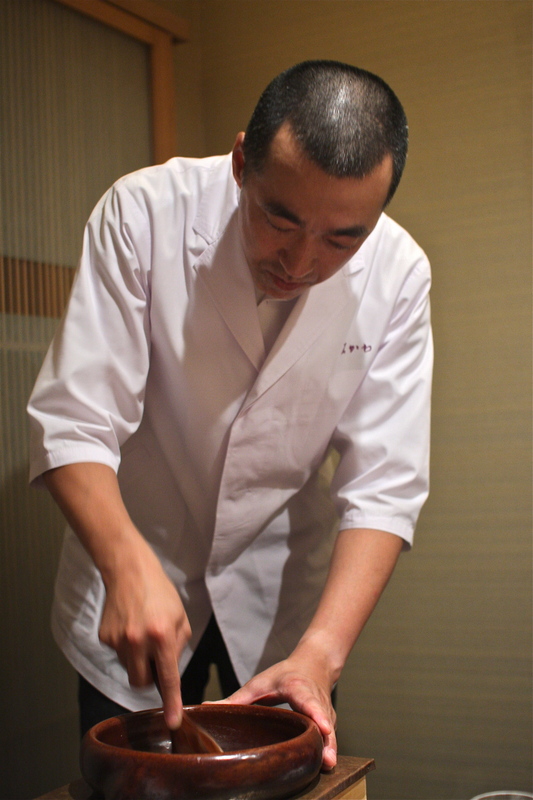 Chef Hidetaka Yamada pampered me with the most incredible keiji salmon nigiri, a rare delicacy. 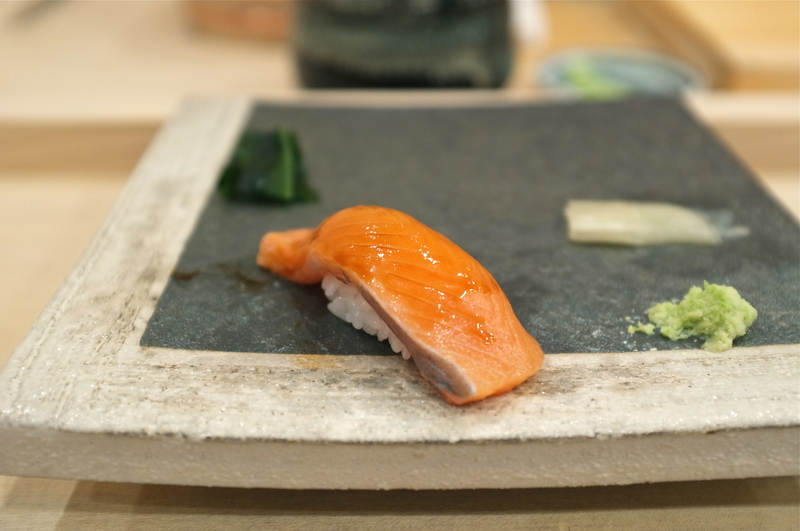 Keiji, which means ‘infant salmon’, is a sexually underdeveloped salmon with an extremely high fat content (20-30%) but a light sweet flavor and silky smooth texture. Only 1 per 10,000 salmon caught are considered keiji, and they are usually only available during the end of November. Did it live up to its hype? Oh yes, yes indeed. It was the best salmon I have ever tasted. For my last dinner in Hokkaido, I chose this tiny old izakaya in the rowdy Susukino district run by Chef Shigeki Echigo. The darn cute smile of his greeted me as I walked through the front door, and I immediately knew that I was in for a treat. 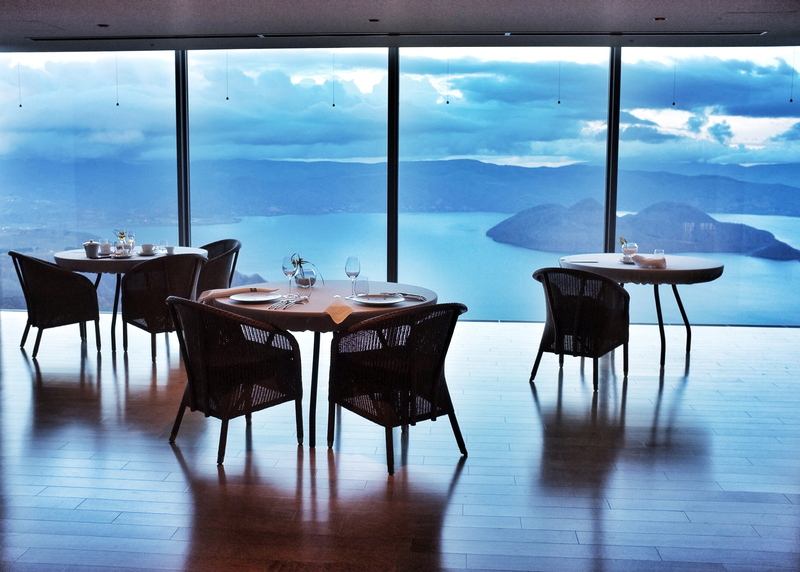 One would never guess, from the outdated decor and the down-to-earth casual vibe at the restaurant, that this place was awarded 2 Michelin stars in the 2012 Hokkaido special edition. I felt right at home with the Shinsen family who fed me with the best of Hokkaido’s bounties. He whipped out a beautiful piece of grilled ginpou for me; something, he said, he only does for special customers. Ginpou (which means silver treasure in Japanese) is an extremely rare fish, only found off the coast of Kushiro in southeastern Hokkaido, and only 200-300 are caught per year. 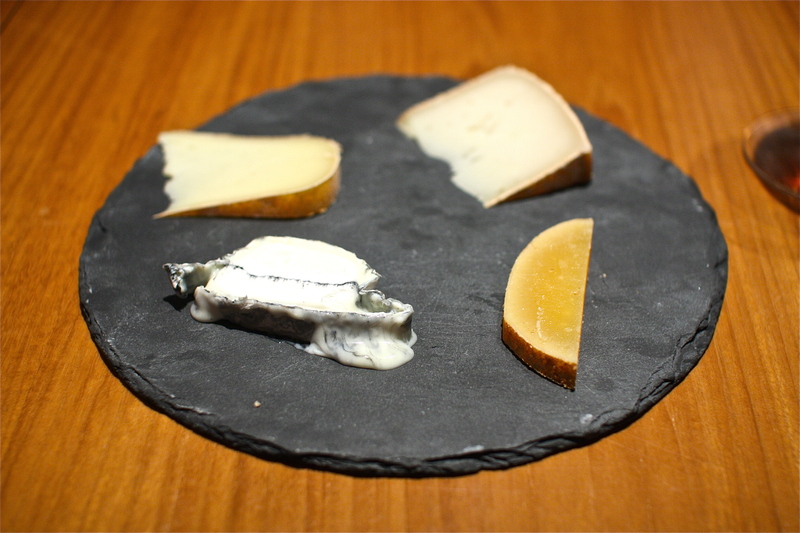 The texture was light, airy and fluffy. The flavor, due to its extremely high fat content, was sweet yet delicate. I have never tasted fish like this before- it was phenomenal. 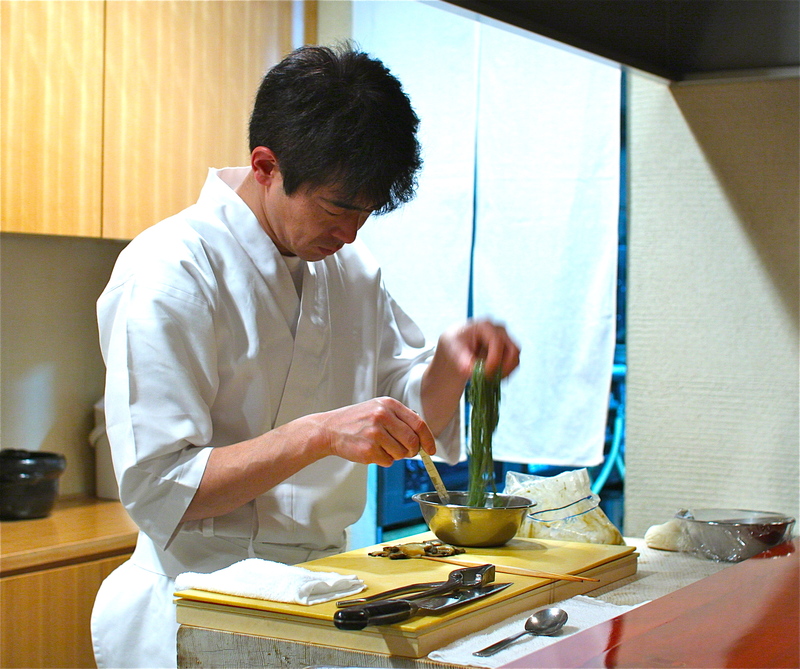 My culinary journey through Japan in 2013 was educational, inspiring and downright delicious. I got to really explore the complex maze of Tokyo- the nooks and crannies- and make new discoveries on every street corner. I saw the countryside, the lakes and oceans, and reveled in the stunning beauty of this country. I tasted, I learned and I absorbed a whole lot of new information, and I met some amazing people along the way. It was a year of renewal and personal growth for me, and I am thankful for all of the friends, both old and new, who shared these memorable meals with me. I look forward to continuing this adventure in 2014. 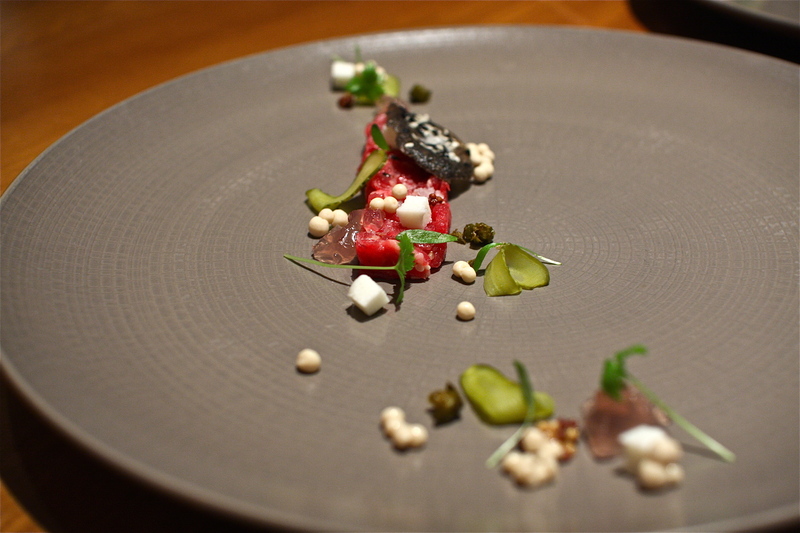 But first, I’ll be writing a post of my most memorable dishes of 2013 outside of Japan. It was the year of craft beers, gastropubs, pop-ups, ramen, foraging, Asian street food, infusions, smoking, duck fat, fried chicken, Peruvian food, Nordic cuisine and pies. 2011, the year of the rabbit, was another exceptional year of fruitful culinary adventures around the world, new friendships that blossomed through memorable meals and gastronomic treasures inspired by passionate chefs who poured heart and soul into their craft. My year, as usual, started off in Japan where I celebrated the new year with family and friends and enjoyed winter delicacies in the best restaurants in Tokyo. Then across the globe I went in spring, to New Delhi, India where I sampled Indian street food and ventured down to Kerala for Southern Indian cuisine. 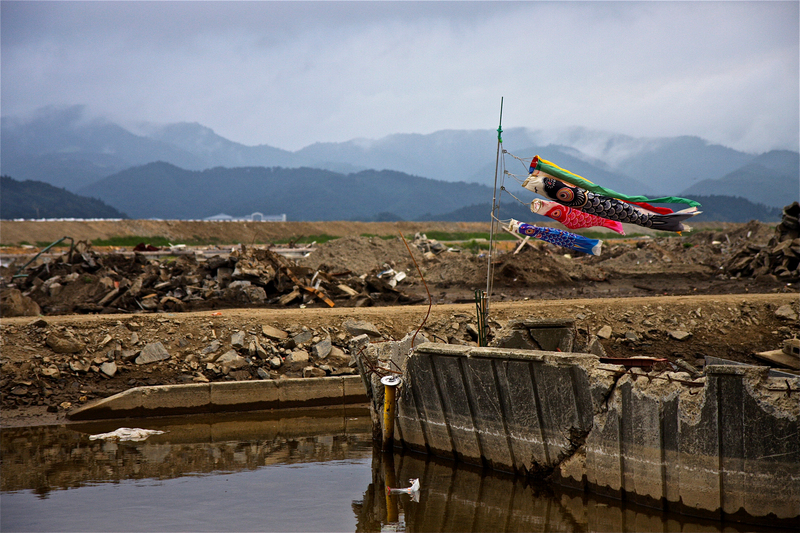 It was then that the tragic news of the Tohoku earthquake and tsunami struck, and I took an unexpected and bittersweet return home to Japan for medical volunteer work. It was wonderful to see numerous chefs in the US and Japan stand up for the occasion and donate their time and services to raise money for earthquake and tsunami relief. Later that spring I took my first step into the South where a casual weekend road trip through the Carolinas and Virginia turned out to be one of the most memorable and fun gastronomic trips of my life. I never knew that there was such history, such energy and so many beautiful flavors in this region of the US, and I quickly fell in love with Southern food. The end of the summer was spent in Haiti for a cholera outbreak project, where my biggest impression, from comparing it to a year and a half ago when I first went after the big earthquake, was that there was very little progress. Millions of dollars worth of donated pledges have not come to form yet in this developing country where many still live in tents with no access to clean water and sanitation. Then autumn came, the leaves turned yellow and I found myself infatuated with the restaurant scene in San Francisco. I spent many hours at the Ferry Building eating burgers, drinking coffee, lining up for pastries and buying charcuterie. Where else can one find amazing food right now? Baja California. 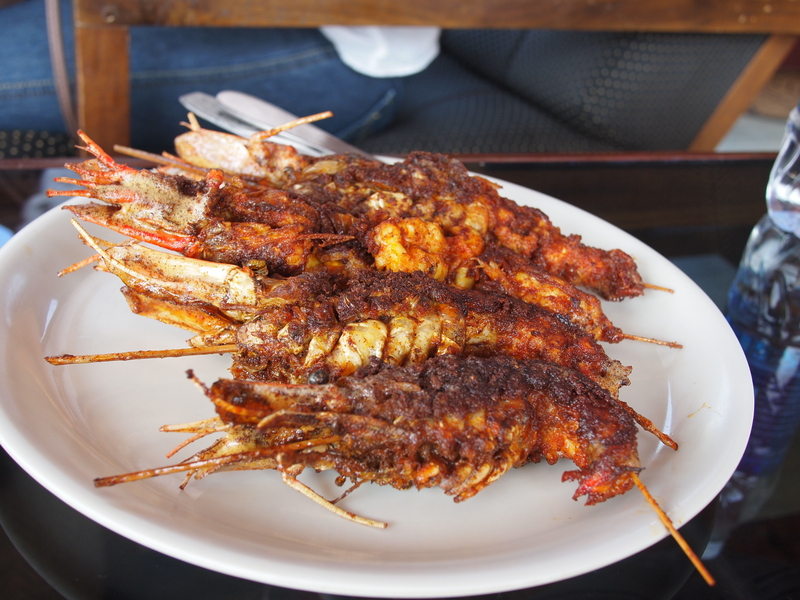 I took 3 trips south of the border this year with the last one in October for the first Baja Culinary Festival where I was spoiled with fresh sea urchin, octopus, clams and fish from the Pacific. Then winter came, I made my pilgrimage back to Japan, and just like that- 2011 was over. Through it all there were some exceptional dishes that left a lasting impression on my palate and my heart- dishes that I can still taste and smell as if it were right in front of me, and will forever be engrained in my life as a delicious memory. Some flavors were new to me while others were familiar and comforting, but all were beautiful and full of life. 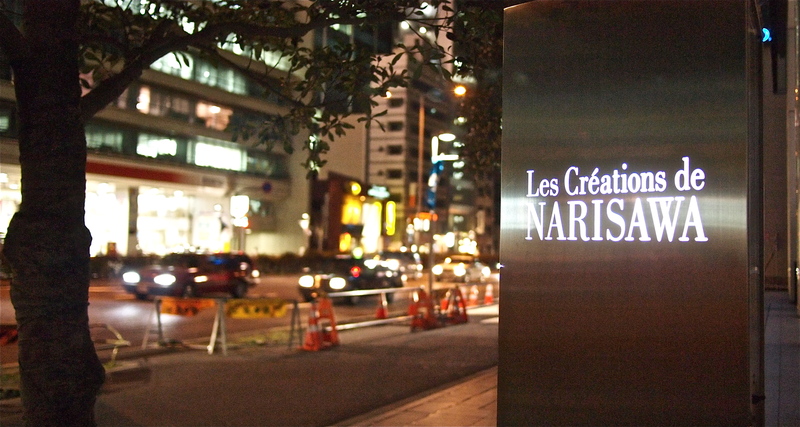 My first restaurant meal of 2011 was at the acclaimed 2 Michelin star Les Créations de Narisawa in Tokyo, Japan, where Chef Narisawa draws inspiration from nature. 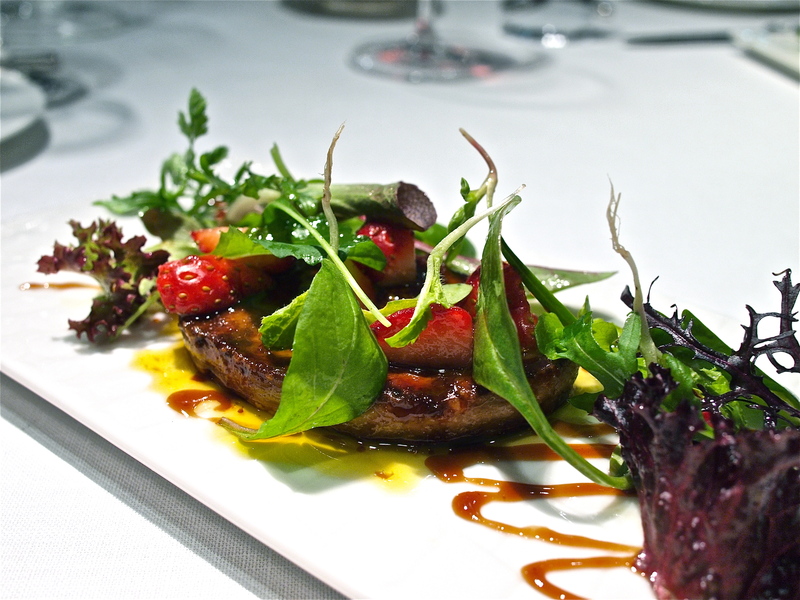 The Saint-Sever foie gras dish was poêléed in red wine vinegar and fond de veau, then finished with balsamic vinegar and strawberries- a perfect balance of acidity, sweetness and the rich savor of foie gras. 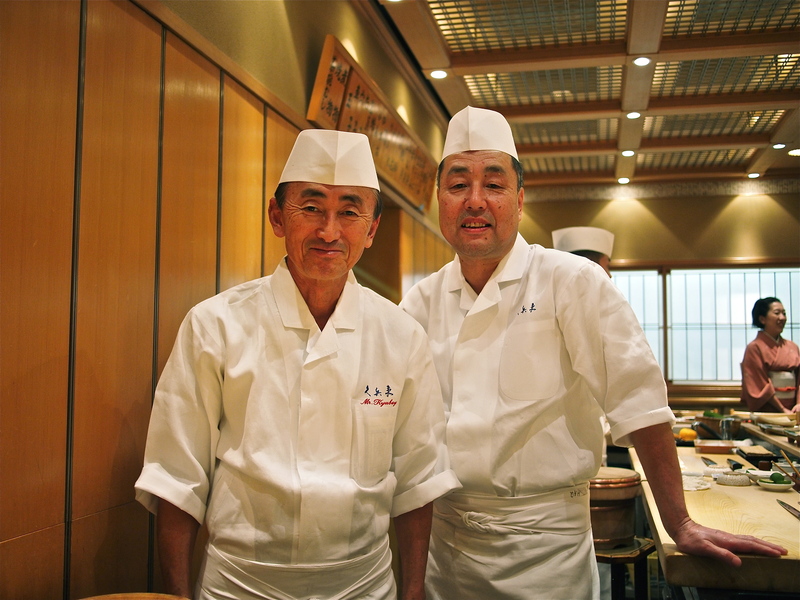 My favorite restaurant in the world is Shigeyoshi in Tokyo, a 2 Michelin star establishment that has maintained the same level of service and excellent food for the last 40 years. 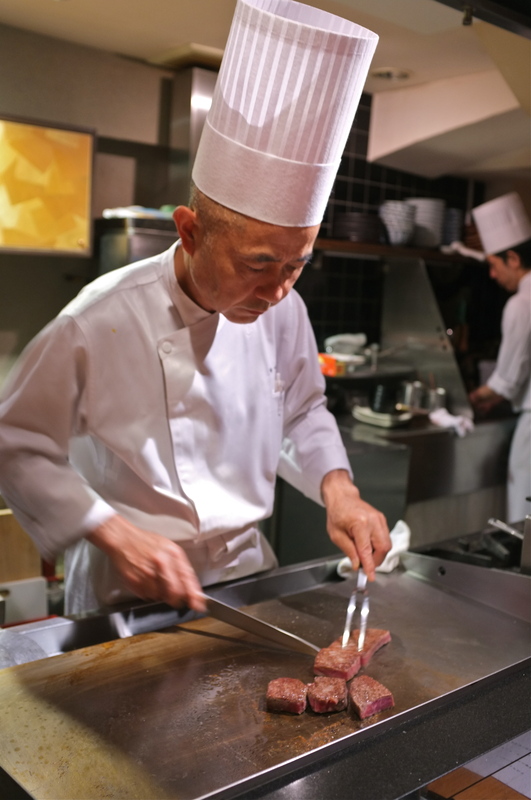 This is what I look forward to the most when visiting Japan- sitting at the counter in front of Chef Sato and watching him prepare each dish as we engage in conversation. 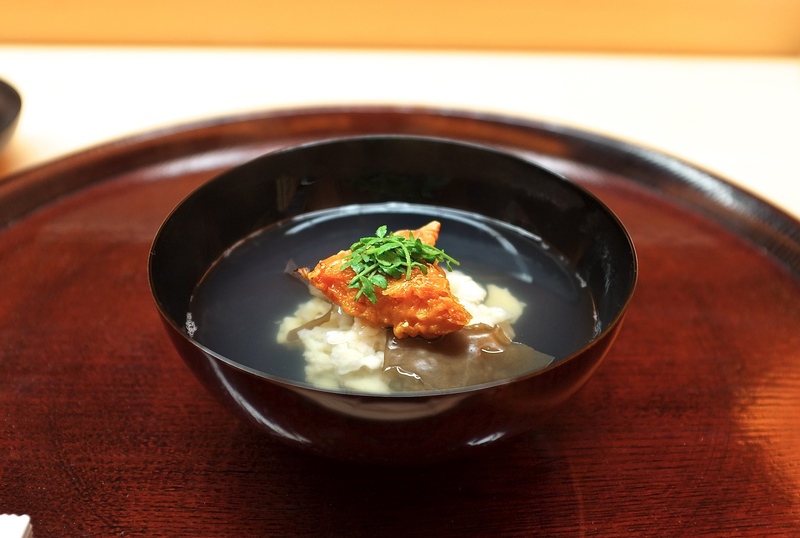 This year a traditional tai no nitsuke, sea bream head from Naruto gently simmered in a soy ginger sake broth, captured my heart. The flesh was tender and the flavors were comforting- something that I could eat every day of the year and smile after every satisfying bite. 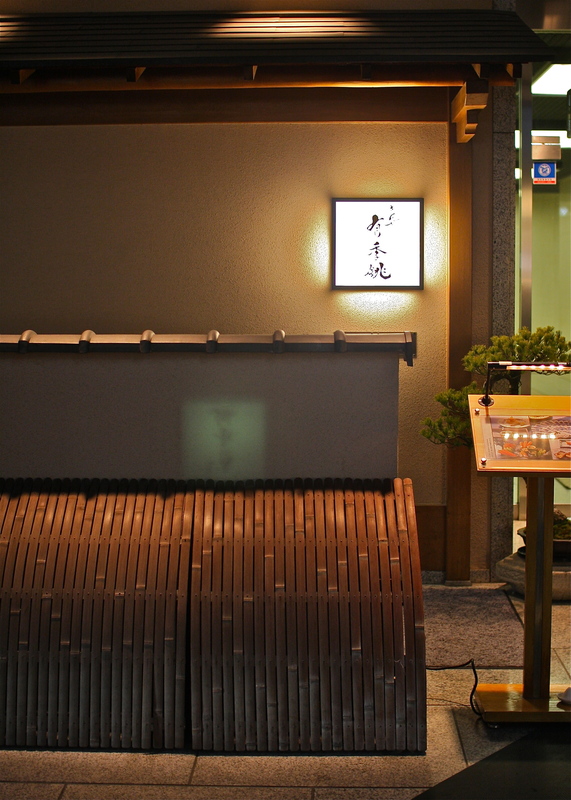 There are many stellar sushi restaurants in Japan- how does one choose the best? It’s about finding 1 or 2 favorite places and establishing a long lasting relationship with a sushi shokunin. I’ve been going to Kyubei in Ginza every year since I was a teenager, and Taira san understands my palate like no other. 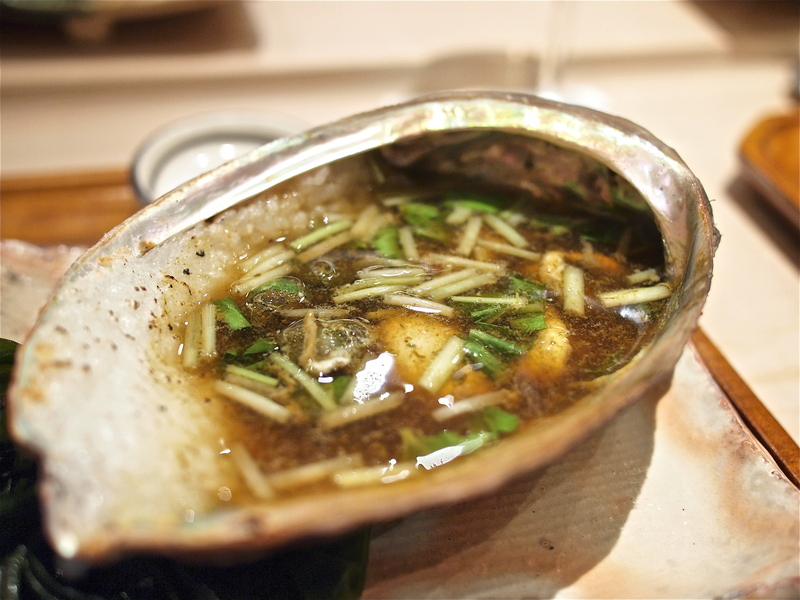 He always makes this dish for me- abalone innards simmered in abalone broth with rice, sake and a splash of mitsuba for texture and freshness. There is something about the bitterness of the abalone innards that I absolutely love and I simply cannot imagine starting off the year without this dish at Kyubei. 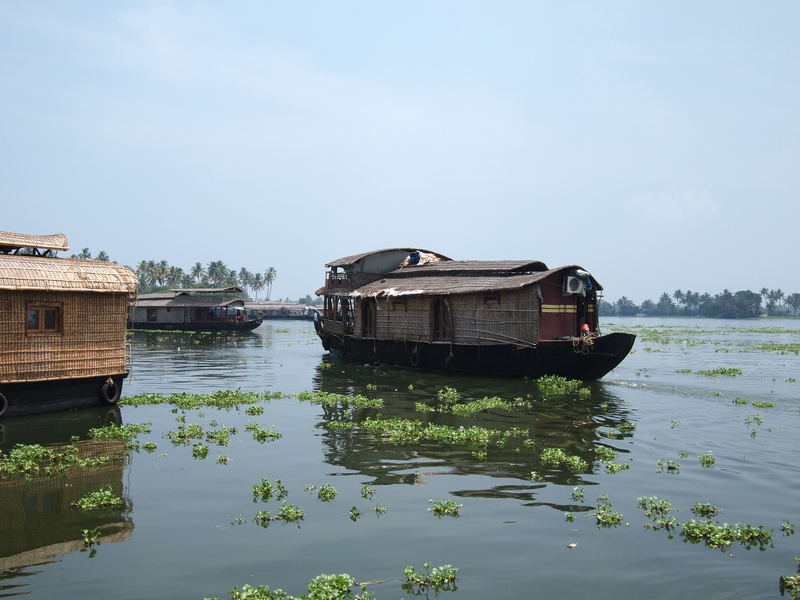 A visit to Kerala in Southern India is not complete without a relaxing houseboat tour on the backwaters of Alleppey. The boat slowly traverses through the murky waters of Alleppey, gliding past quaint villages and lush jungle-like vegetation. 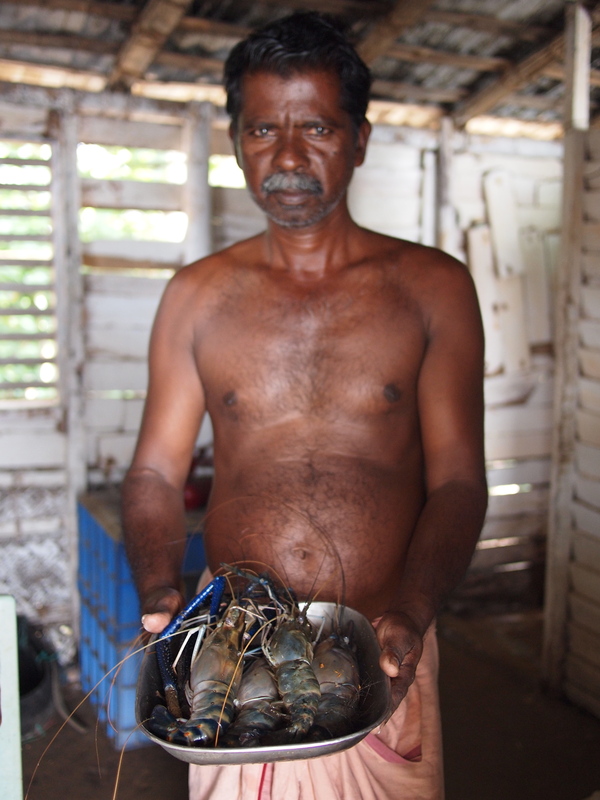 We picked up some Konju tiger prawns along the way from a local fisherman, giant prawns the size of my face with impressively long emerald blue claws. They were marinated in Kerala spices of cardamom, cinnamon, nutmeg, ginger and turmeric and flash fried in the pan to a crisp. A lazy afternoon sprawled out on the deck of the houseboat, staring out onto the vast waters of Southern India while noshing on meaty prawns is an experience that I will never forget. A visit to the South this past spring was an eye opening experience for me. 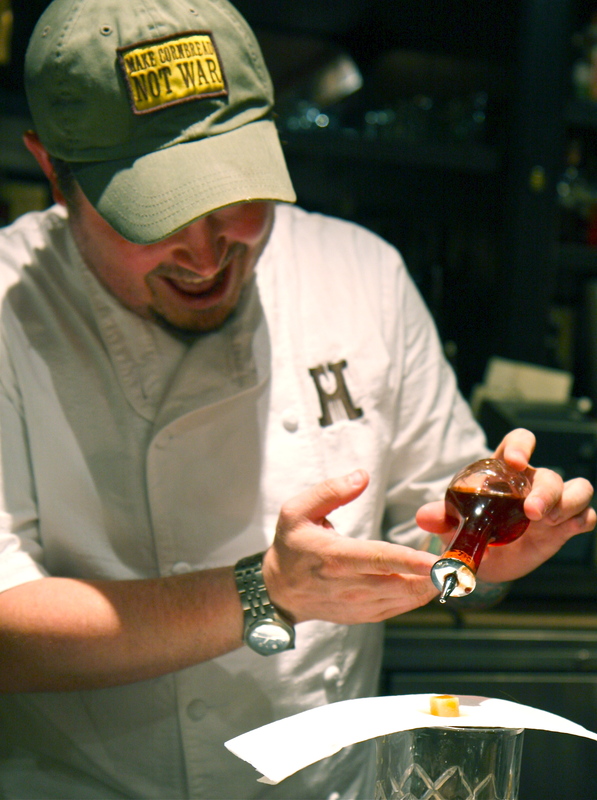 With Chef Sean Brock as my trusted tour guide at both of his restaurants, my adventure into Southern cuisine was educational, memorable and downright delicious. 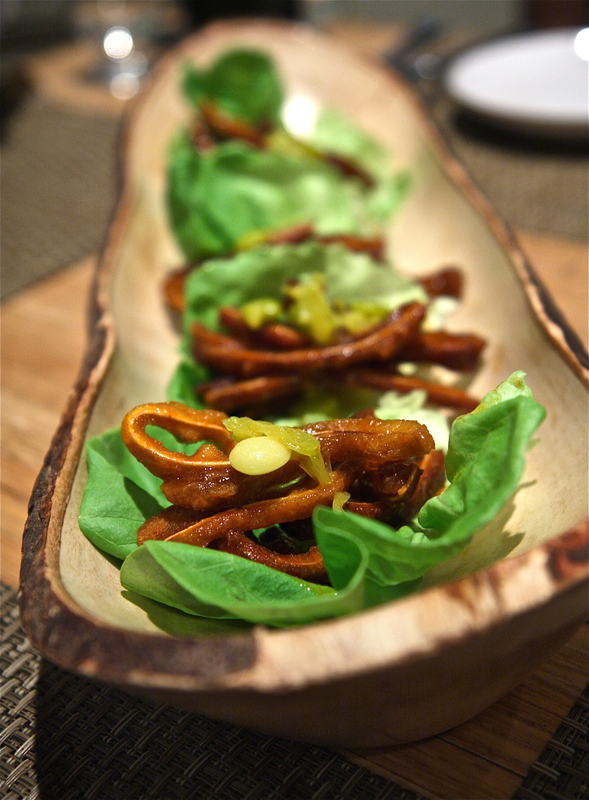 My dinner at Husk was my favorite meal of 2011 thanks to many sensational dishes that highlighted Southern ingredients, including crispy fried pig ears, soaked in tangy vinegar and served in a lettuce cup with preserved butter bean chow chow. Many chefs played around with hay and wood this past year, smoking, charring and burning them to extract unique aromas. It was John Shields’ Pastoral dish at Town House during my road trip through the South that demonstrated the allure of this trend the most successfully. 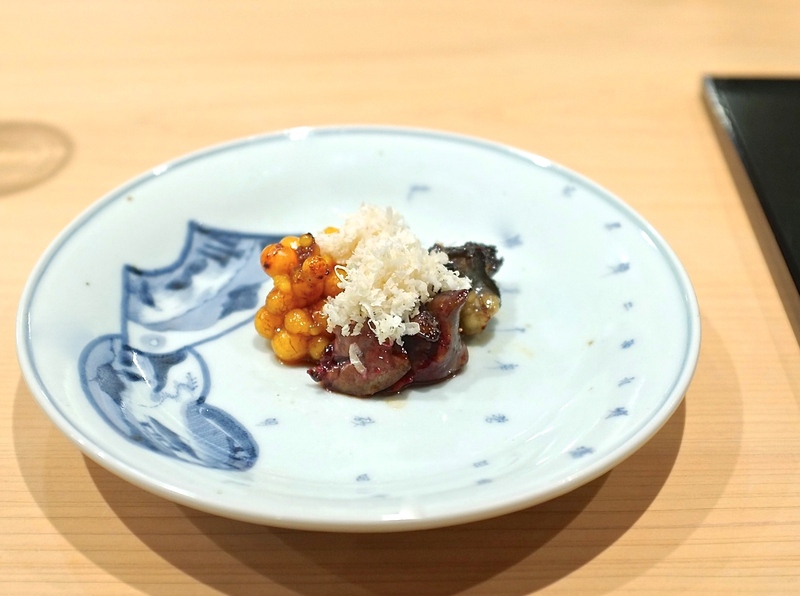 Tender beef cheek was drizzled with hay-smoked milk and decorated with edible herbs and flowers, a well thought out dish that was both visually and conceptually inspirational. The smoked hay lingered on my palate for what seemed like an eternity, perfuming each cell in my body with the beautiful aromas of nature. 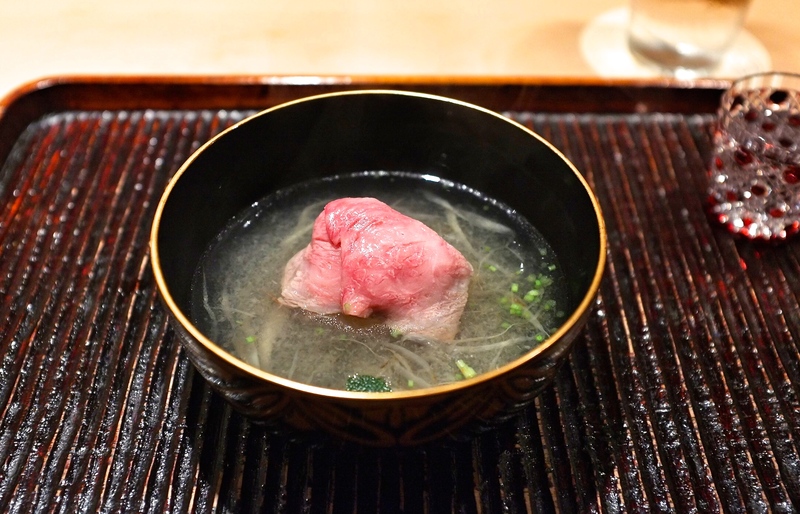 Only in Japan can a restaurant specializing in beef offals elevate organ meats to Michelin star level. 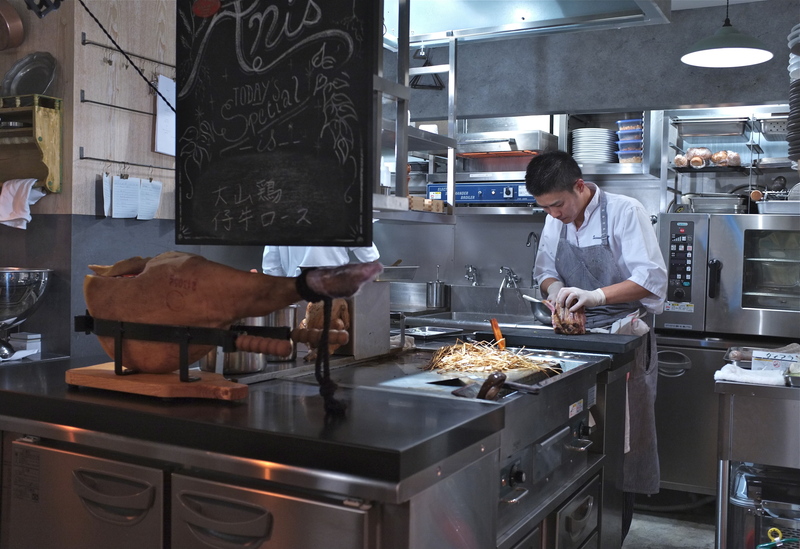 At Sanda, they char Sanda Wagyu pancreas, poach tendons, steam lungs and braise cheeks. 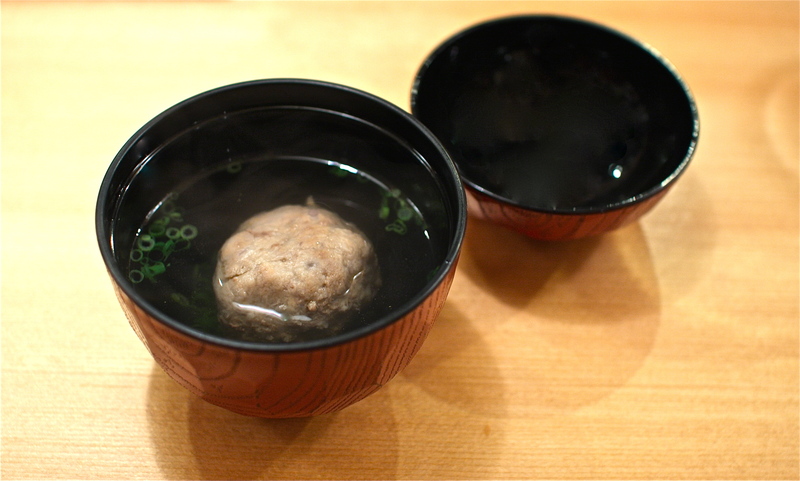 Sanda is a culinary temple for offal aficionados, and I became enamored with their beef tongue and throat cartilage dango soup, a soft airy meatball made with succulent tongue and crunchy cartilage for added texture. I experienced a moment of peace and serenity as I sipped the savory broth to its last drop. 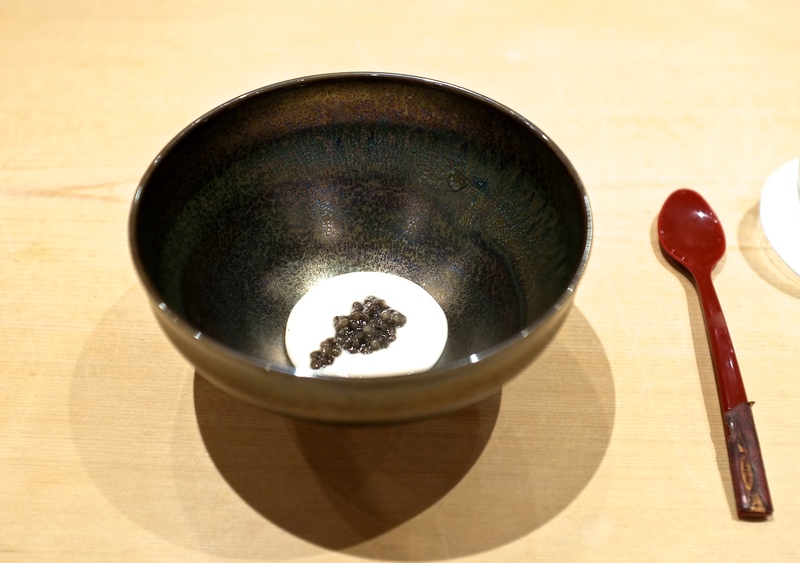 A newcomer to the Tokyo restaurant scene but already awarded 2 Michelin stars, my kaiseki meal at Kohaku in Tokyo was a breathtaking demonstration of finesse, understated beauty and harmony. The first course was a study in textures and flavors- diced cucumbers, slippery junsai, and yuzu gelée that enveloped and highlighted the buttery sweetness of summer uni. 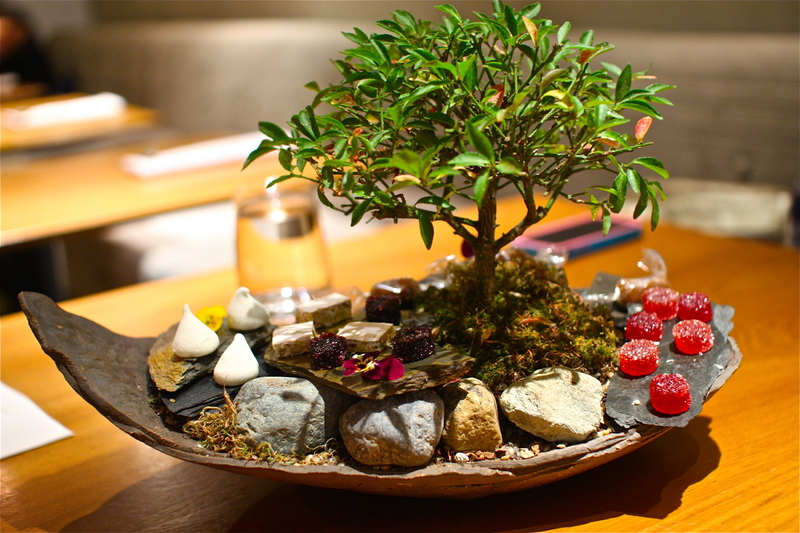 Kohaku is a culinary oasis in the middle of Tokyo where one can experience true Japanese hospitality. Chef Craig Thornton’s Wolvesden is no underground secret anymore, although reservations for his private dinners are still notoriously difficult to score. 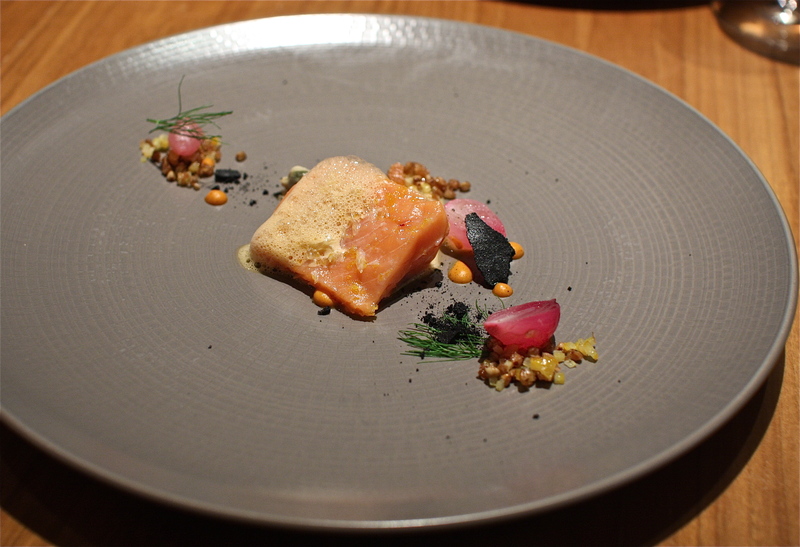 At one such dinner this past year, he challenged the traditional and classic concepts of a meal and reversed the order of his dishes. 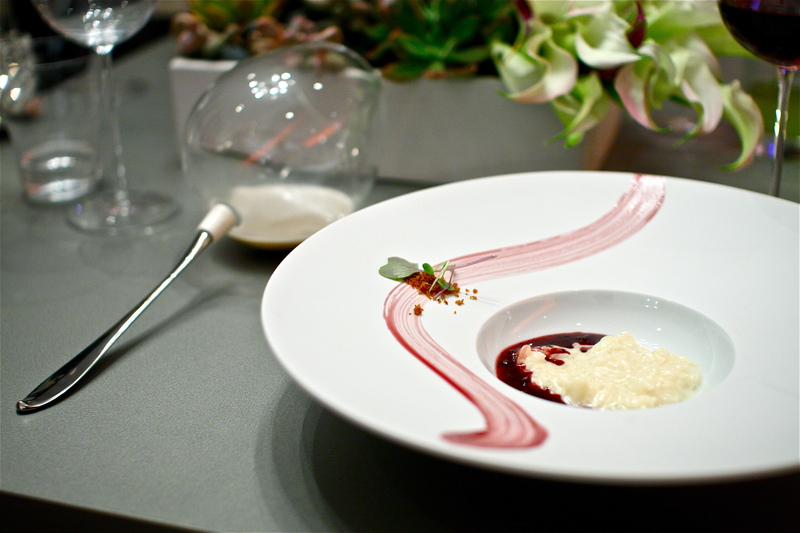 He started with dessert, served meat before fish and even incorporated breakfast inspired courses throughout the dinner. 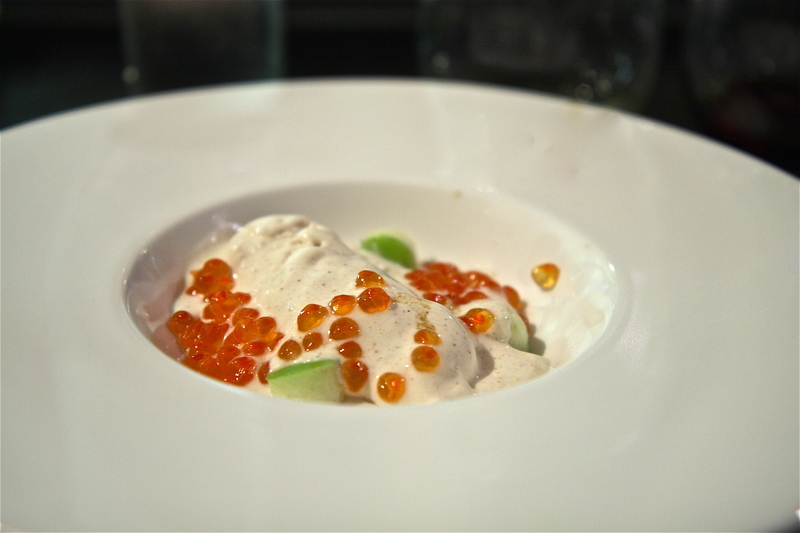 French toast drizzled with maple syrup and a side of smoked bacon sounds like the perfect morning meal- here Thornton decorated cinnamon ice cream with pearls of bright orange smoked steelhead roe, green apple slices and a side drizzle of maple syrup. The result? 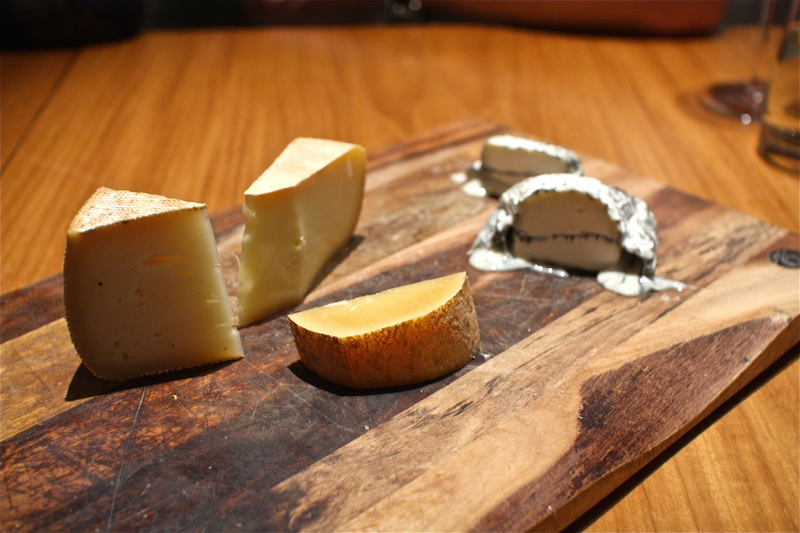 An explosion of climactic flavors- smoky, sweet and savory, all at once. Red Medicine is where I like to take out-of-town food aficionados so I can prove to them that there is something to be said about the Los Angeles dining scene. Chef Kahn’s desserts are without question some of the best in the city- and the country- demonstrating his unique style of sensibility, beauty and grace. 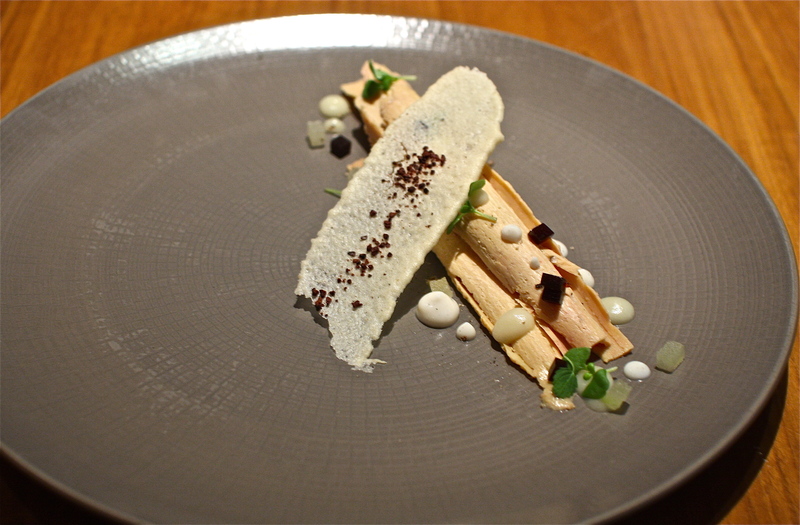 Although he is a renowned pastry chef by trade, his savory dishes at Red Medicine are quite incredible as well. 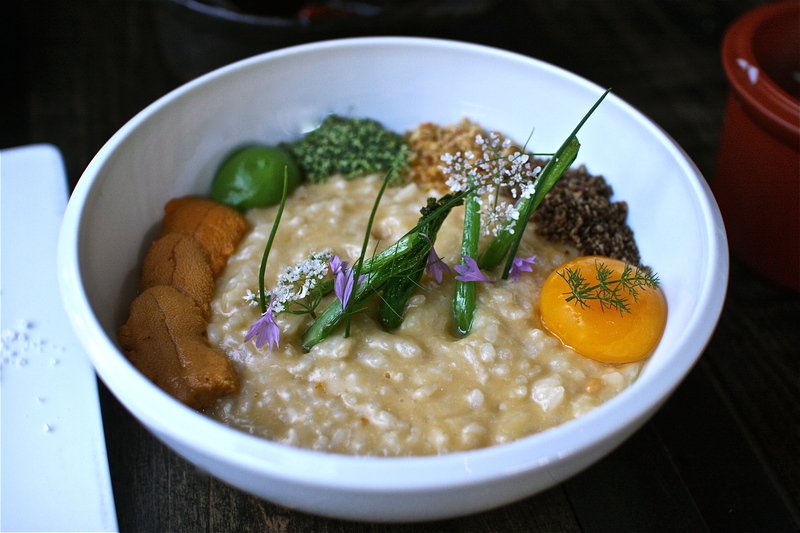 I can still remember my first bite into the heirloom rice porridge served with a bright orange ‘Kelley’s mom’s’ farm egg, Santa Barbara red uni, hazelnuts, ginseng, brassicas, liquid ginger, fried shallots and broccoli purée. I was hesitant about eating rice porridge at a non-Asian establishment, but that first heavenly bite almost brought tears to my eyes. 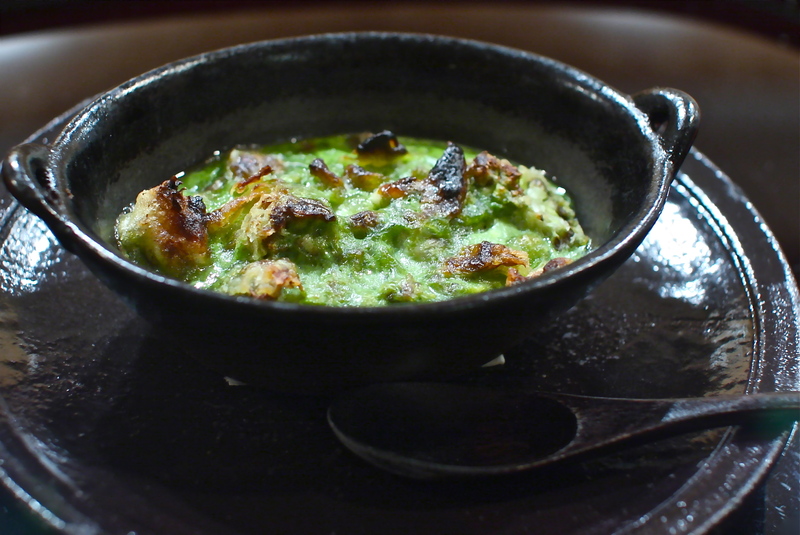 At once comforting and familiar but also new, interesting and refreshing, this is one dish that everybody should eat. 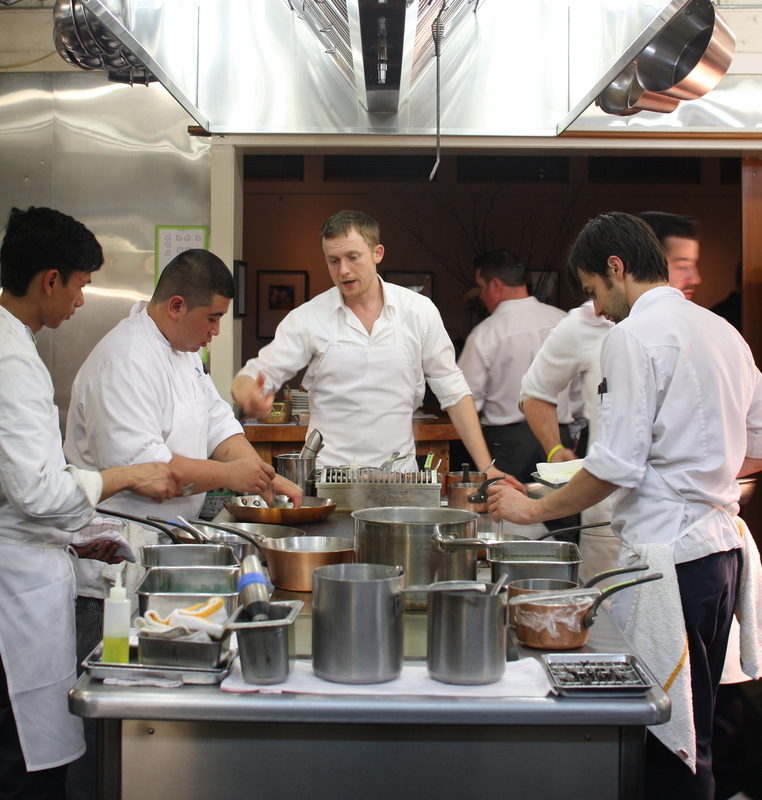 My first of 3 meals at Chef Roberto Cortez’s private CR8 dinners was quite an experience. Textures, flavors, music, aromas and tactile sensations came together for a well orchestrated meal that touched me on a deep emotional level. Food can evoke memories and make us feel in ways that we haven’t in a long time, and Cortez’s risotto with crunchy ground coffee and Syrah glaze did just that for me. Shiitake mushroom cappuccino coupled with the bitterness of coffee took me down memory lane to a place of love and sorrow. One of the most exciting restaurants in the US right now is Saison in San Francisco where Chef Joshua Skenes concentrates flavors through aging and roasts proteins over hot embers to extract its fine essences. 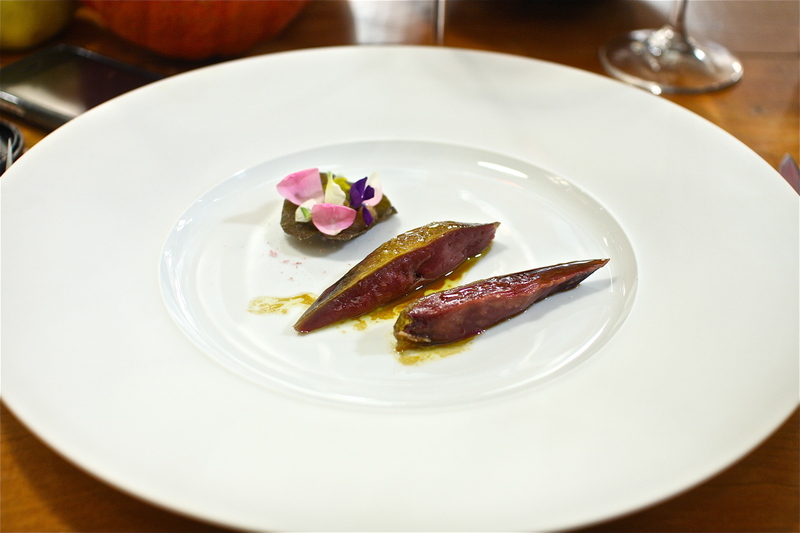 This past autumn I indulged in an astounding tasting menu at the chef’s table inside the kitchen where he presented a 32 day aged pigeon, its cavity salted and roasted over cherry wood, and a 70 day aged pigeon, left unsalted, likewise roasted and served with a glass of rosé infused with salted cherry blossoms. So much work for just a sliver of pungent breast meat, but worth every delectable bite- the 70 day aged pigeon meat was a surprising sensation for me, dark concentrated crimson meat with a thick waxy texture that tasted just like Epoisse, aka heaven. When I tell people about my trips down to Tijuana, people always ask why. ‘For the food’, I reply, to which I am met with skeptical and quizzical looks. 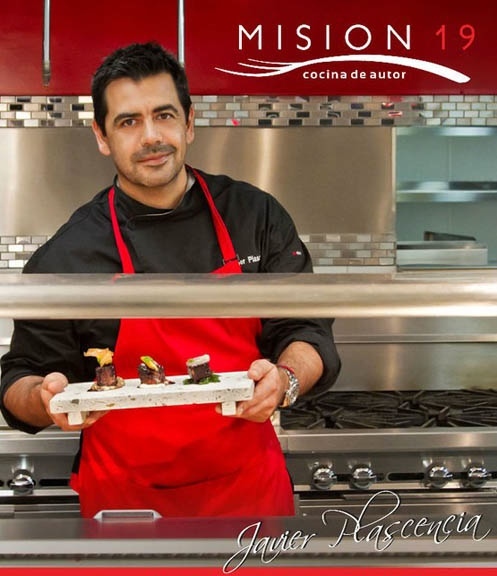 There is a budding culinary scene in Baja California with Chef Javier Plascencia at its forefront, and on a recent trip down south of the border for the 1st Baja Culinary Festival, he amazed me again with his innovative and exquisite cuisine. 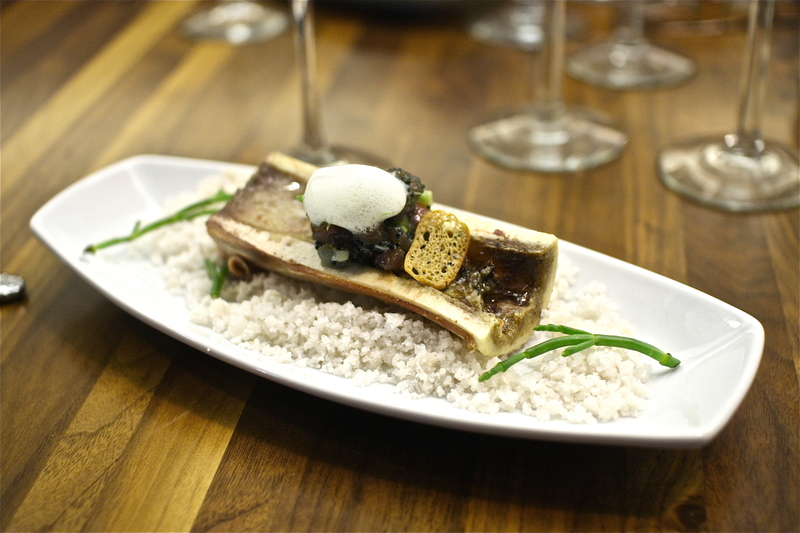 Roasted bone marrow topped with generous chunks of tender Yellowfin tuna, brightened with the popping textures of tobiko roe, a side of crunchy salicornia and Serrano foam was just brilliant. 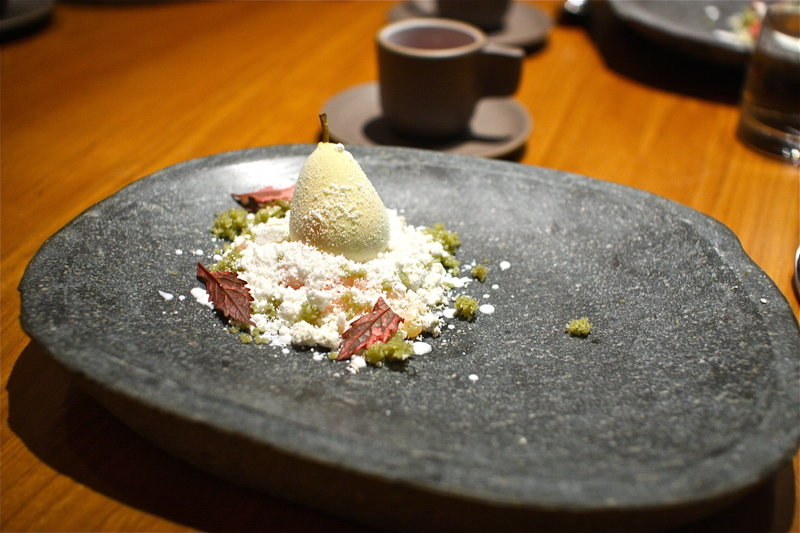 Autumn turns to winter, and soft powdery snow blankets the dying autumn leaves in this outstanding dessert served at the end of an exceptional tasting meal at Atelier Crenn, one of my best and most memorable meals of the year. While I wish that I could list every single dish of Chef Dominique Crenn’s tasting menu on this ‘best of’ list, I choose this dessert, made by her pastry chef Juan Contreras. Edible hibiscus leaves mingle with yogurt sage powder, pink quince granité and crunchy phyllo dough around a pear sorbet that is shaped into a perfectly frosted miniature pear. 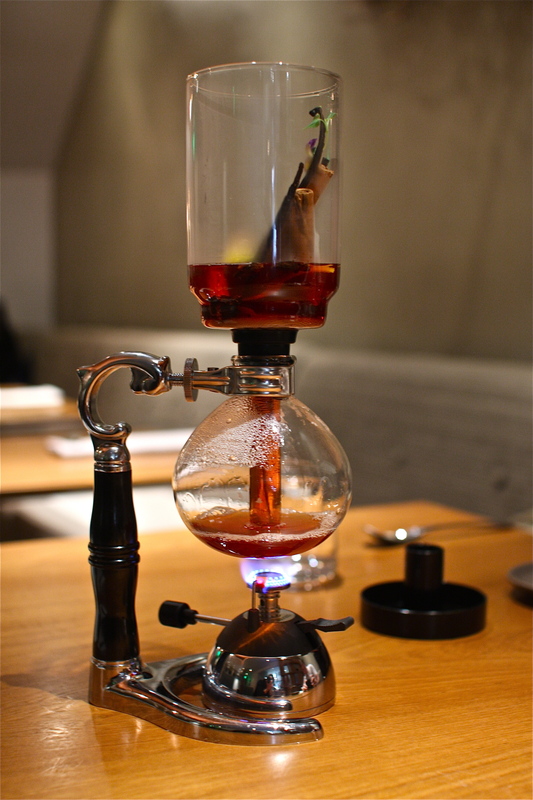 It is served with a dessert consommé of vanilla beans and spices that are infused into a broth on a tabletop siphon coffee maker- love at first sight and until the last bite. Chef Ricardo Zarate’s new restaurant Picca was a breath of fresh air in the Los Angeles culinary scene this year. Anticuchos of beef heart and black cod charred over hot Japanese coal and signature ceviches spiked with aji amarillo have become standards in my weekly dining repertoire, but there was one comfort dish that he made during a special themed dinner that captured my attention and my heart. 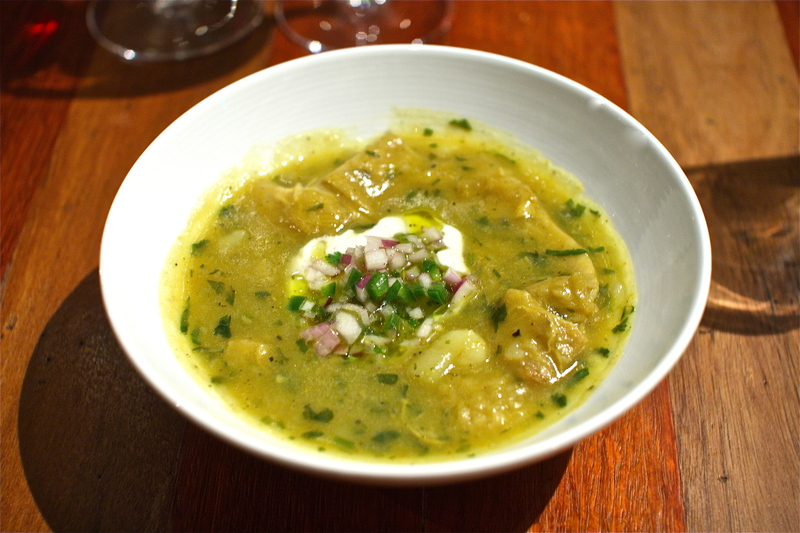 Peruvian potato and tripe stew, cau-cau, with braised honeycomb tripe that melted in my mouth like butter was a bowl that I would like to eat over and over again. Earthy hearty flavors with a touch of turmeric, dressed with piquant salsa and a drizzle of cumin yogurt was just what the doctor prescribed, and what this talented and amazing chef provided on that unusually chilly evening. During 2011 I was introduced to new cuisines, impressed by new flavors and intrigued by new foods. 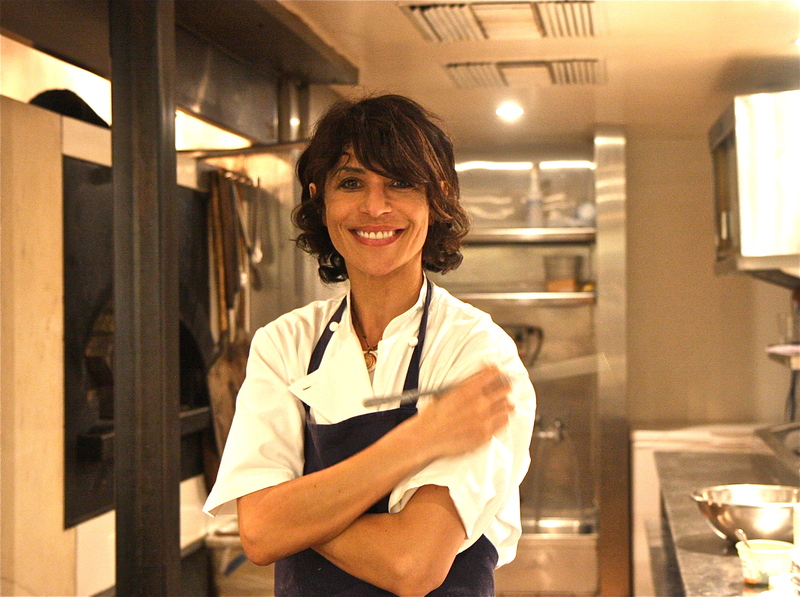 I met some amazing chefs who inspired me to continue exploring the world and the possibilities of how food can enhance and complement our lives- from Sean Brock to Dominique Crenn to Roberto Cortez, and I am truly thankful for the continued friendships with exceptional chefs like Ricardo Zarate, Craig Thornton, and Javier Plascencia. 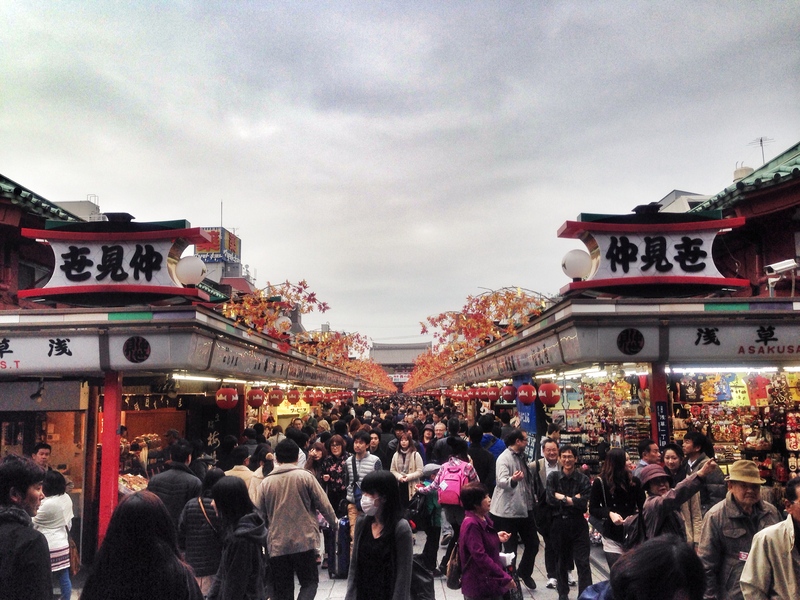 2011 was an amazing year, as you can see, but I have a feeling that 2012 will be even better as I write this entry from Tokyo, Japan and plan for some delicious trips to Europe and beyond. 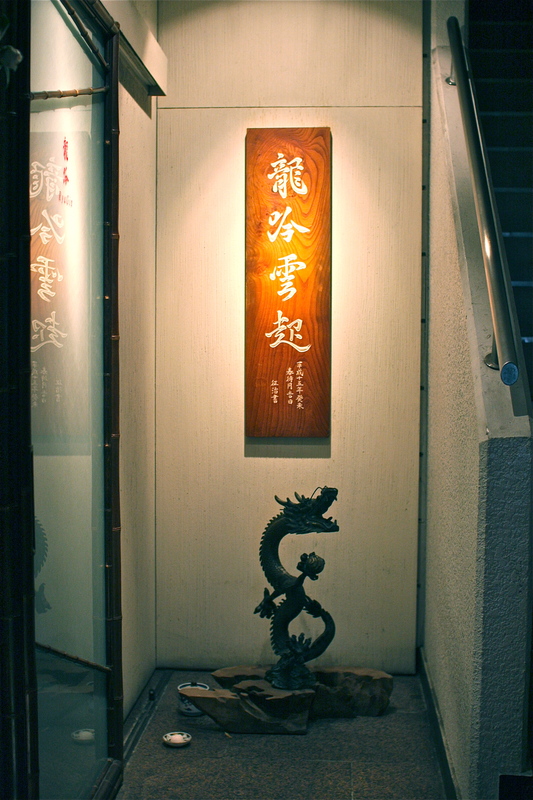 May your 2012, the year of the dragon, be a fulfilling and delicious year! Done are the days of murder mystery dinners where diners sit through complex plots of set-ups, betrayals and killings woven through appetizers and entrees, and sift through side dishes of problem solving hints for an entertaining evening of detective work. We’re not so interested in the whodunit anymore- the question being asked at Picca this season is ‘What is it’? 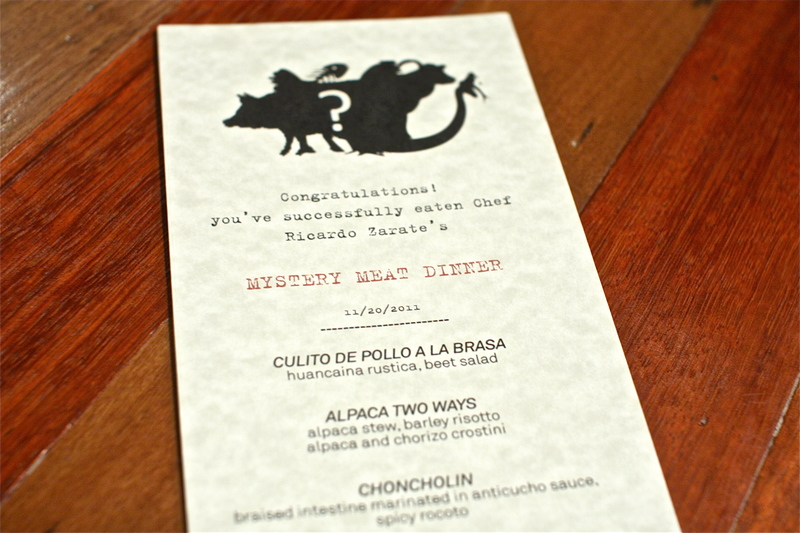 To kick off Picca’s new Sunday dinner hours, LA’s most beloved Chef Ricardo Zarate hosted a Mystery Meat Dinner, a 6 course meal of mystery animal parts served in his signature Peruvian style. ‘What is it?’ was the only question that the normally kind and helpful Picca staff were refusing to answer that evening, tight-lipped and dismissive until the very end of the meal when the menu was revealed only to those adventurous diners who came to sate their curious appetites. Hint: Bite sized portions of white meat, moist and tender inside with a bold spicy char on its crust, revealing little tiny edible bones inside, leading me to believe that it was rattlesnake, and for another diner guinea pig. 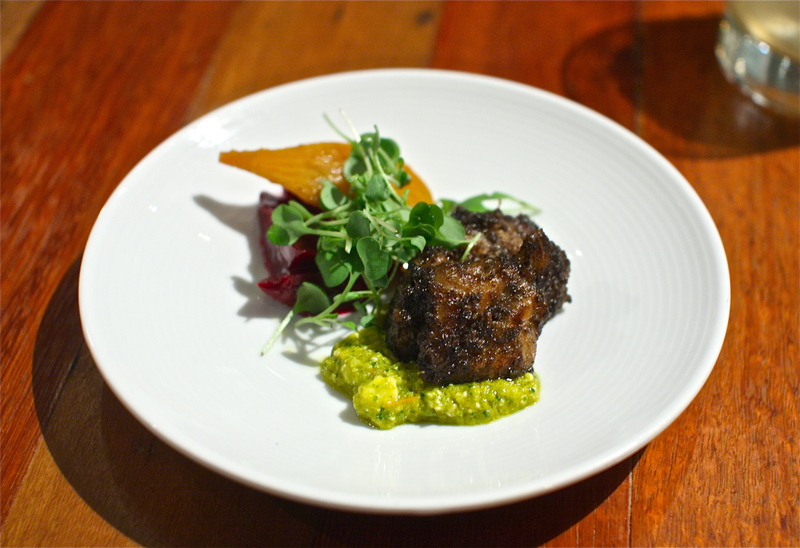 It was a juicy cut of meat, very light with no gaminess or heaviness- like chicken, perhaps alligator- paired with Zarate’s aji amarillo salsa, a creamy huancaina rustica so full of flavor and vigor, paired with a brightly acidic beet salad. Hint: Dark rich braised meat with an intense bold flavor, a hint of iron within the tender fibers that succumbed effortlessly to the fork, its intensity balanced by the tart onion and cilantro topping, perched on a creamy barley risotto that had a distinct delightful give to its texture. It tasted and felt like braised oxtail but that would’ve make it too easy for a mystery meat dinner. On the other side of the plate, Zarate served a crostini of similar dark moist meat mixed with spicy chorizo and topped with scallions. Were they different cuts of the same animal, or two completely different mystery meats? The servers would only smirk and shrug their shoulders to such inquiries, refusing to spill the beans until the menu reveal. Hint: Finally, a recognizable form of tubular connective tissue, cuts of obvious intestine braised to exquisite tenderness, marinated in anticucho sauce and seared ever so slightly to seal in those wonderful spicy and acidic flavors into each bite. The surprising showstopper of this course was the potatoes, a juxtaposition of crispy crunchy thick potato skin to the soft, moist and buttery flesh within, dressed with a rocoto sauce so spicy that it brought me to tears- tears of joy. Hint: There is no mistaking a good cut of offal, and the distinct pentagonal lattice of honeycomb tripe in the homey stew was an easily solved mystery for this detective. A touch of turmeric gave this hearty potato and tripe stew a beautiful golden hue and an earthy aroma, warming every cell in my body with each satisfying bite. Zarate must have braised the tripe all day, for each cut was as tender as the potatoes, simply melting in my mouth with the ease of butter. That evening’s cau-cau was dressed with jalapeño salsa and cumin yogurt, but I much prefer the traditional preparation of piquant chimichurri that Zarate has done before. Hint: As an offal aficionado, course 5 was another easy mystery for this private investigator to solve. Spongy dark iron-rich cuts of meat with small hollow airways couldn’t be anything other than beef lung, prepared in a comforting stew with tender potatoes and giant kernels of Peruvian mote (corn). On this particularly chilly evening, this nourishing and wholesome stew was a most welcome dish to savor, down to the very last morsel of lung. 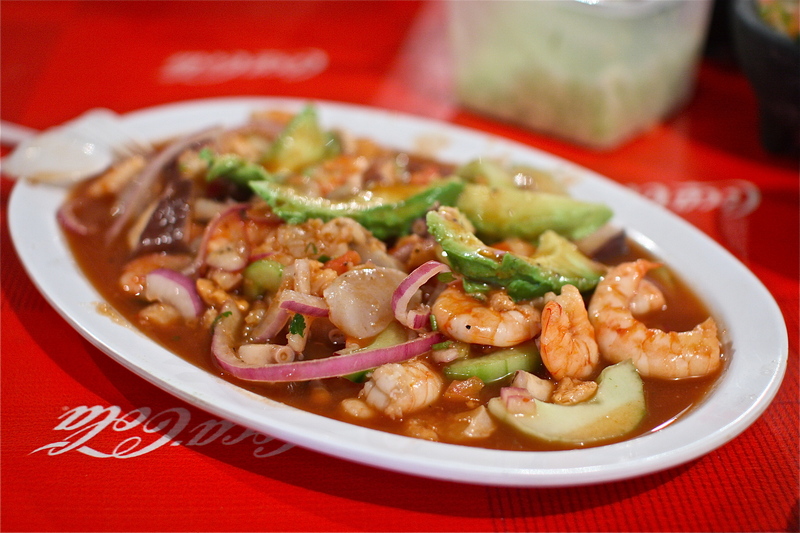 Hint: Although Zarate is famous for his anticuchos, ceviches and arroz con pollo, I have always loved his desserts, and this was no exception. Thick tender cuts of stewed apples and quince in a vivid purple glaze were spooned over a creamy rice pudding with a heavy dusting of cinnamon on top. 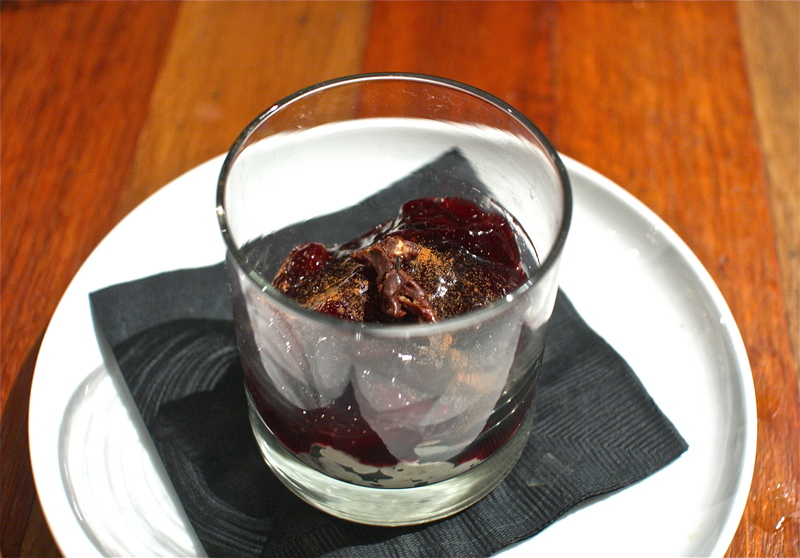 It tasted like chica morada, a beverage staple on Mo-Chica’s menu made from purple corn (maiz morada), and we soon discovered that this mazamorra morada dessert was made from the same ingredient. Just as I was relishing this beautiful dessert, something bitter, intensely sour and splintery got caught between my teeth. It was an inch long sliver of fine dark brown fibers. It was an insect leg. A mystery meat dinner themed around exotic animal meats and unorthodox cuts of offal may be off-putting for some, but with Chef Zarate as its chef and host, it was exactly the reason why I rearranged my work schedule on that Sunday evening to make it a priority. 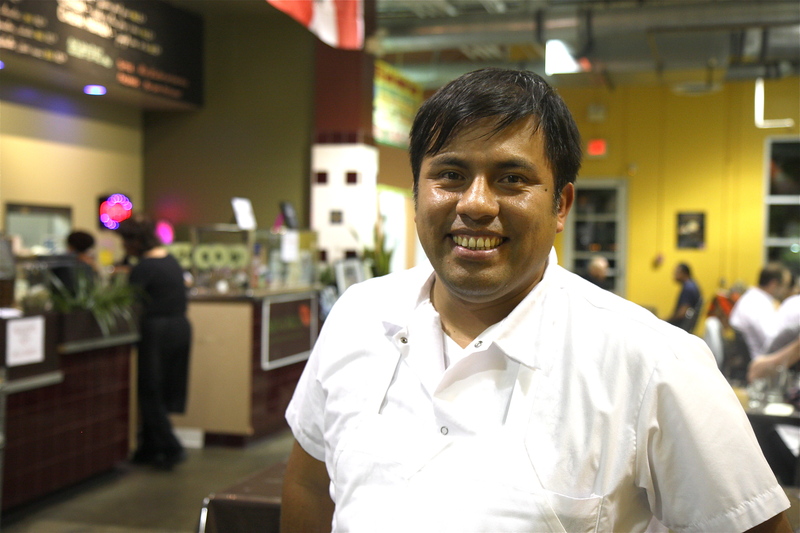 Zarate is an experienced chef with these proteins and knows how to work his magic with these exotic flavor profiles, using bold Peruvian spices and salsas to brighten each dish. 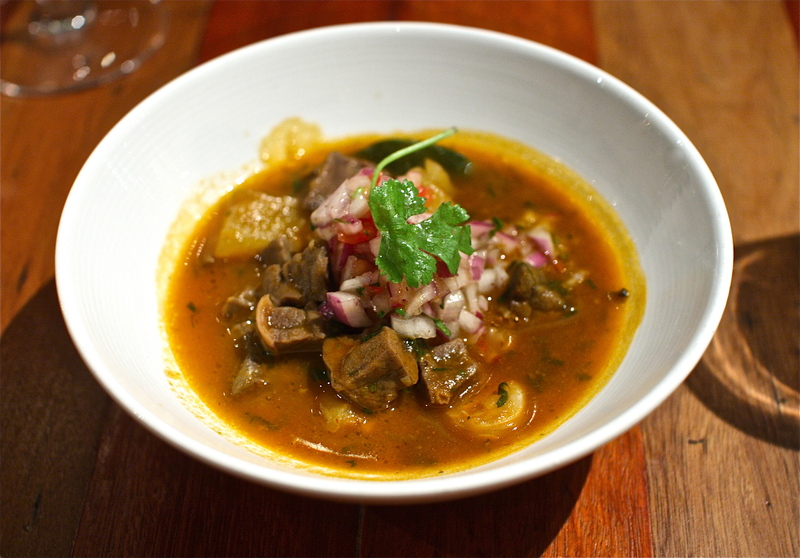 The huancaina rustica that augmented the chicken, the rustic anticucho sauce seared onto the choncholin and the satisfying liquid of stewed cau-cau at this Mystery Meat Dinner made for my favorite meal by Chef Zarate to date. 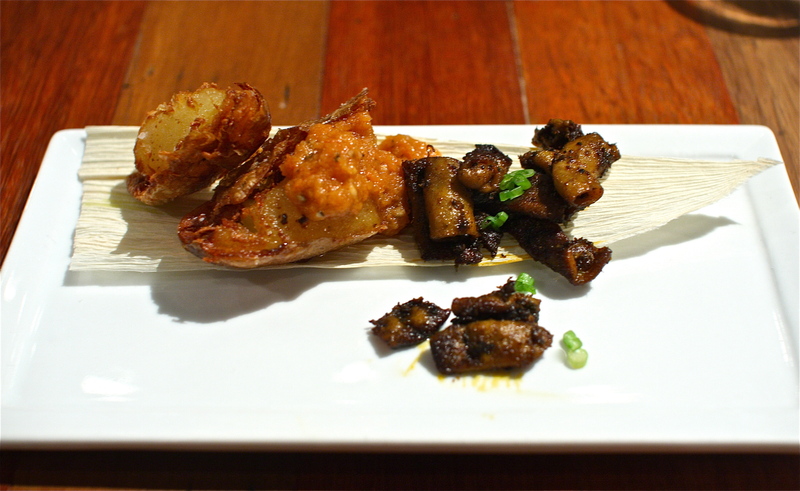 The choncholin, in particular, swept me off my feet with its smokey flavors and beautifully prepared potatoes. Now, suddenly, I was plagued with a bigger mystery- ‘Will I ever see these dishes again?’ You must put these on the menu at Picca, I demanded, to which Zarate hinted, with a knowing smile, that these may make a regular appearance on the menu at his upcoming new restaurant, Mo-Chica on Seven. With that final mystery solved, all was well again in the land of Picca. 9575 West Pico Blvd, Los Angeles, CA 90035. Random trivia: According to local myth, once you try chapulines in Oaxaca, you will never leave. This probably means that once you sample Oaxaca’s extraordinary cuisine, then you take a piece of Oaxaca with you and you will return again. 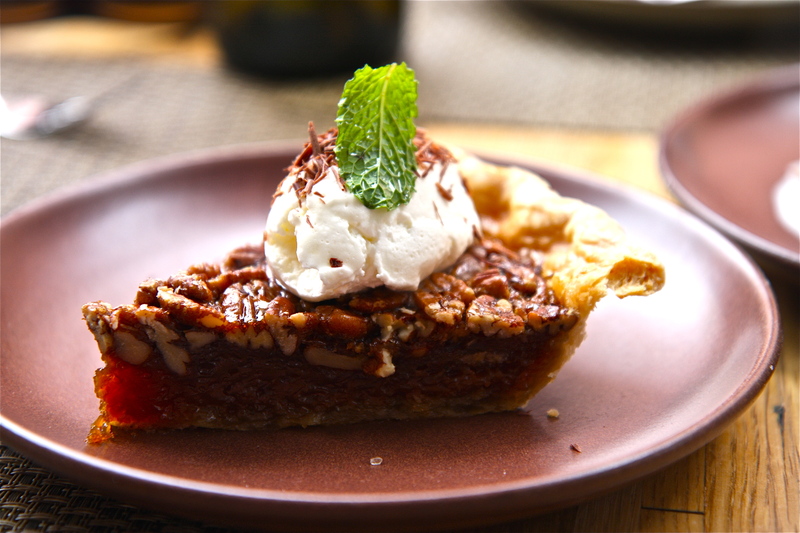 Nothing says Southern hospitality like a slice of pecan pie, served up with a dollop of freshly whipped cream and a heavy dose of love. When that pie is served at the end of a meal by Sean Brock, you can smile like a lottery winner and know that you just experienced one of the best darn meals that you’ve ever had. 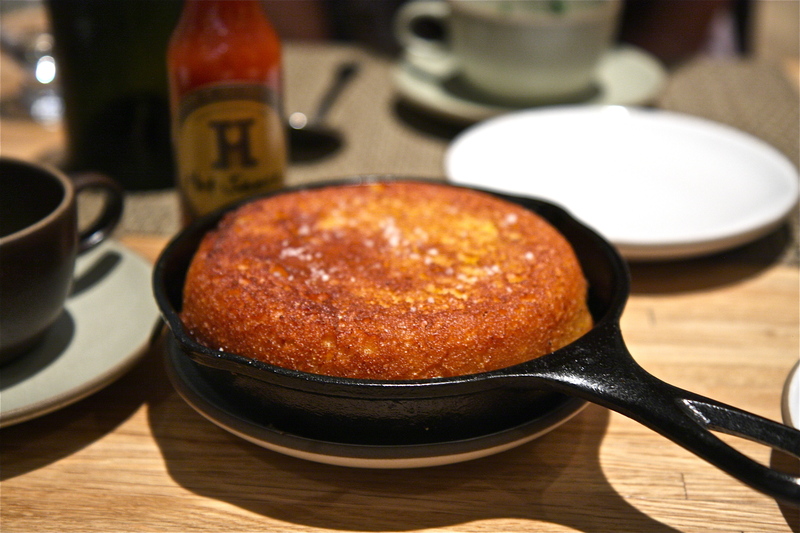 That’s how he finished our dinner at Husk earlier this year, still fresh in my memory as if it were just yesterday, a fascinating glimpse into the history, culture and flavors of Southern cooking. 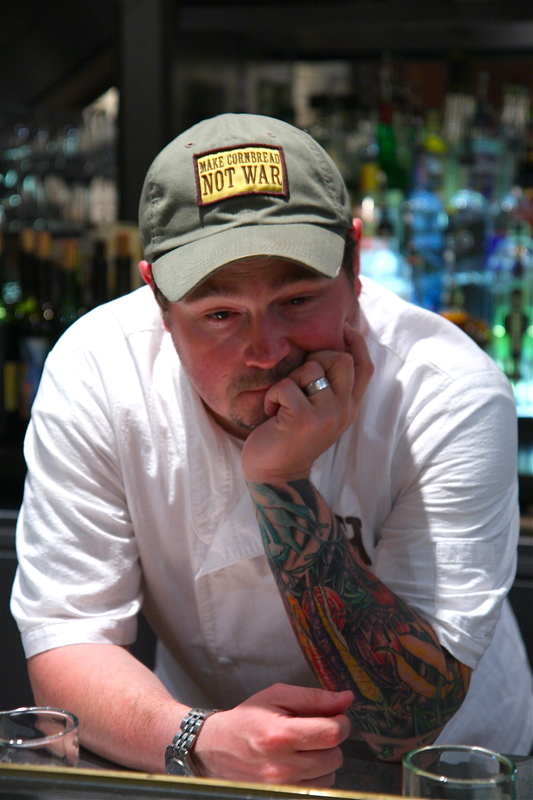 Chef Sean Brock is a coveted 2010 James Beard Award winner for Best Chef Southeast and runs the kitchens of two restaurants in Charleston, South Carolina- Husk and McCrady’s- and if you spend a little time with him you’ll quickly see that this Dixie sensation is pure heart and soul. He wears his pride on his sleeves- quiet literally, a vibrant collage of vegetables tattooed on every inch of his upper limb from wrist to shoulder- and summons the plentiful bounties of regional ingredients to create a most spectacular and memorable menu at Husk. ‘If it ain’t Southern, it ain’t coming in the door’, he has said, and he indulged me with vinegar spiked crispy pig ears, buttermilk drizzled Capers Blade oysters, cornbread cooked in bacon fat and soft shell crab studded with pearly benne seeds for an unforgettable dinner that special evening. It was later that night, somewhere between a glass of Pappy Van Winkle’s Family Reserve and his signature laugh (the most infectious jolly guffaw that has ever graced this earth) that he invited my party to come back for brunch, and we happily accepted with great honor. 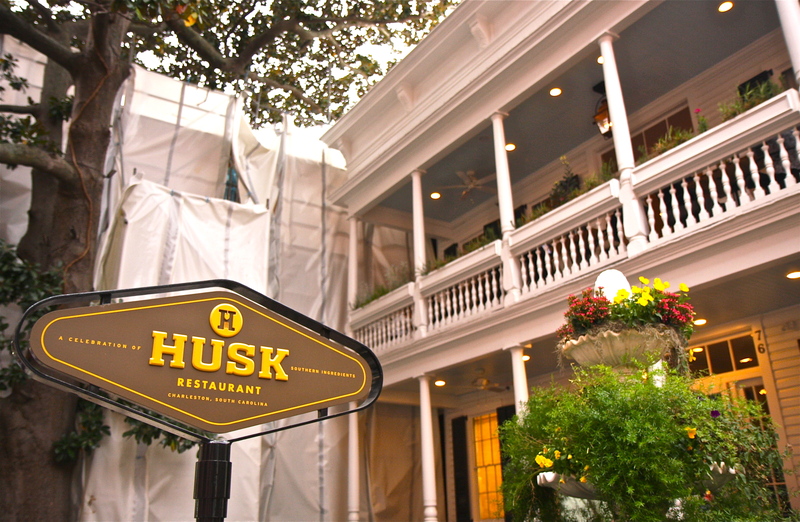 Husk is all about Southern food, and Southern food done right, using only the best of the south-of-the-Mason-Dixon-line ingredients cultivated and raised by local farmers. 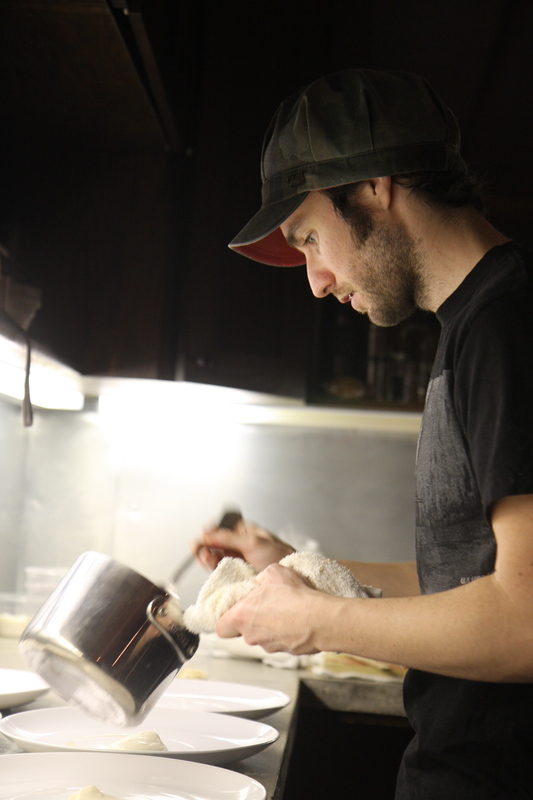 Brock is a Southerner himself, born and raised, and he has the gift to unlock and extract the true flavors from each ingredient, creating dishes inspired by his grandmother’s cooking and channeled by his creativity. 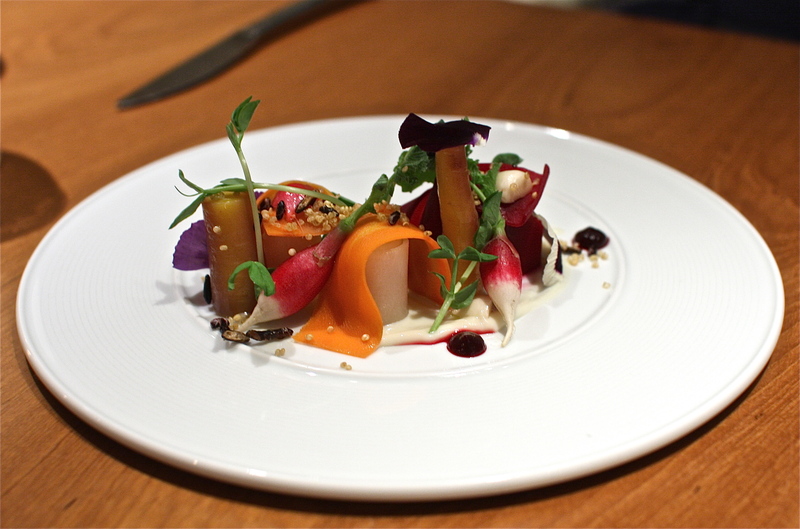 That evening he mesmerized us with the magical flavors of farm fresh vegetables layered with preserved ones, the allure of pickled legumes juxtaposed against the puckering acidity of homemade vinegar, and the alchemy of smoking chocolate. Thus we found ourselves on the second floor balcony of his 19th century restored building-turned-restaurant, basking in the warm sunlight to a chorus of chirping birds for Sunday brunch just 3 days after our epic dinner at Husk. 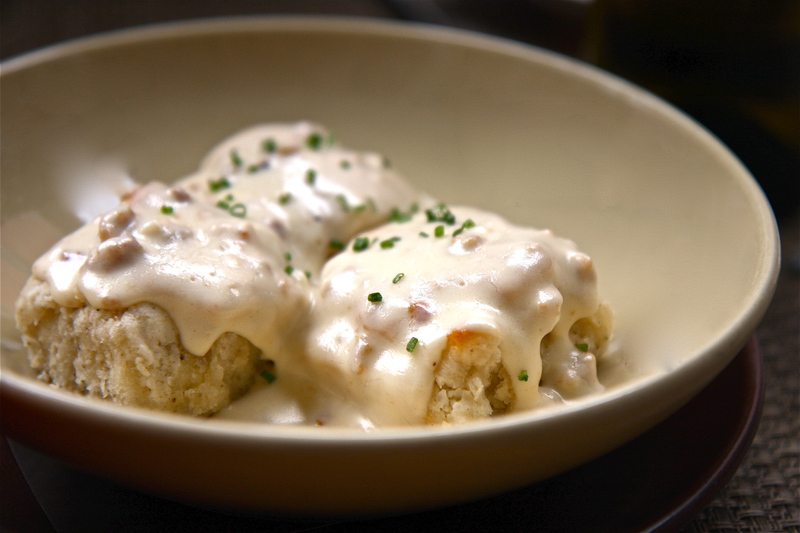 It started with a classic plate of biscuits and gravy, moist buttery squares of black pepper biscuits drizzled with a thick blanket of cream infused with chunks of Benton’s sausage. 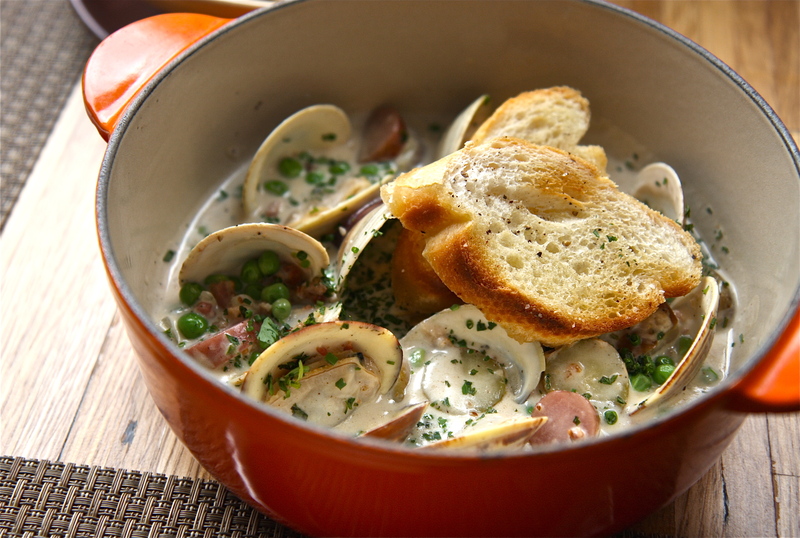 One of our favorite dinner courses made an encore for brunch, wood fired clams with Benton’s bacon, only this time sans samp grits and instead, with fingerling potatoes, sweet field peas and a beautifully savory cream sauce that we gulped down to the last drop with spoons and bread, for it was the best clam chowder of the South. 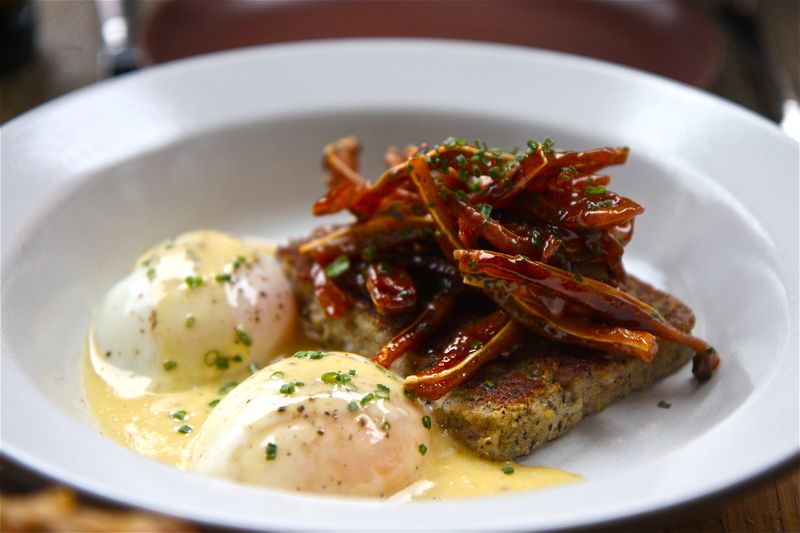 Then there were spicy maple pig ears, glazed chewy cartilage piled high on a slice of seared Anson Mills buckwheat scrapple just waiting to be bathed in nutrient rich liquid gold- the lighter gold of Hollandaise, and the deeper vibrant orange lava that oozed from the glorious farm fresh poached eggs. 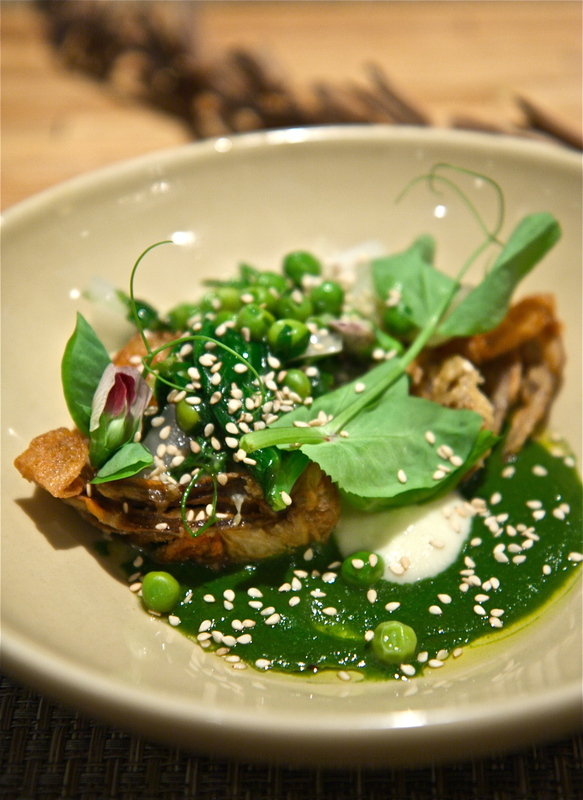 The soft shell crabs that Brock procured for Husk that season were particularly magnificent and regal specimens, appearing in our dinner with a vibrant green pea sauce and that morning for brunch, deep fried with a thick slice of toast topped with melted Tennessee cheddar and a fried egg. 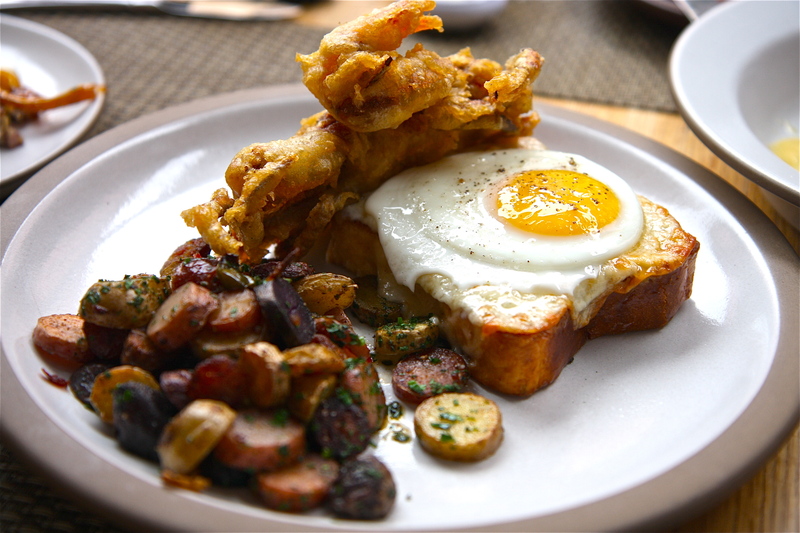 Refusing to take a back seat to this hearty crab ‘Monte Cristo’ was a Surry sausage and fingerling potato hash on the side, salty, savory and equally satisfying. 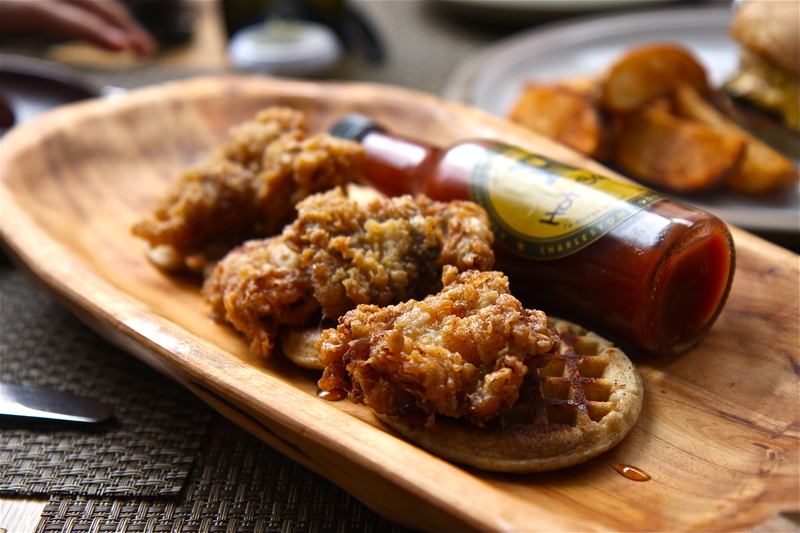 And how about them fried chicken and waffles, the ultimate Sunday brunch (or late night, depending on your lifestyle) comfort food, a most satisfying combination of juicy bird with warm toasted waffles and a shot of sweet maple syrup. Husk’s version was supreme- crunchy golden batter encrusting moist dark meat, served right out of the fryer to release hot steam at the first cut. Splashes of Brock’s signature Husk hot sauce gave it the finishing touch, kicking the flavors up to transcendent Southern proportions. I remember Brock mentioning his cheeseburger at the time that he invited us over for brunch, but it didn’t quite register with me then. 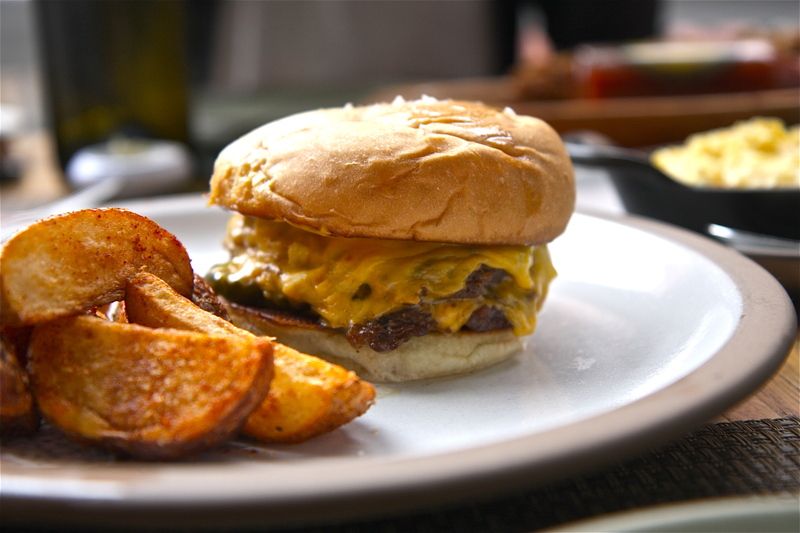 Cheeseburger, here in the South, for brunch? At Husk, yes. Benton’s hickory-smoked bacon is ground straight into locally sourced grass-fed beef and made into thin double patties that are seared in his wood-fired oven. 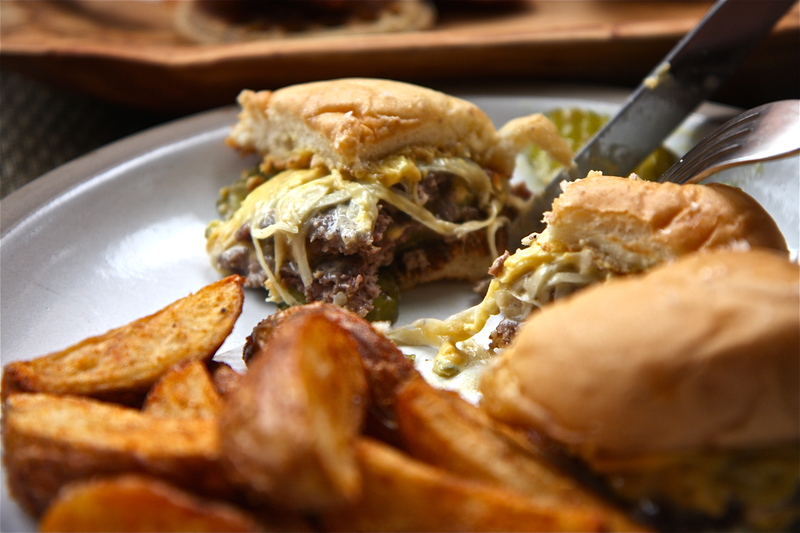 Then they’re topped with gooey American cheese that melts patiently, slowly, right down the sides, spiked with pickles and some secret sauce, and snuggled right between a pair of soft buns. ‘It’s probably my favorite thing in the entire world,’ Brock has said affectionately of his cheeseburger, and if it weren’t for the fact that I had to split this bacon-infused delight 4 ways with the others, it would be mine too. One mustn’t leave Charleston without sampling the grits- the pride, joy, identity and lifeline of the South- and who better to prepare them for us than our very own chef who has been cultivating heirloom grains and seeds in a preservation effort to revive antebellum crops? 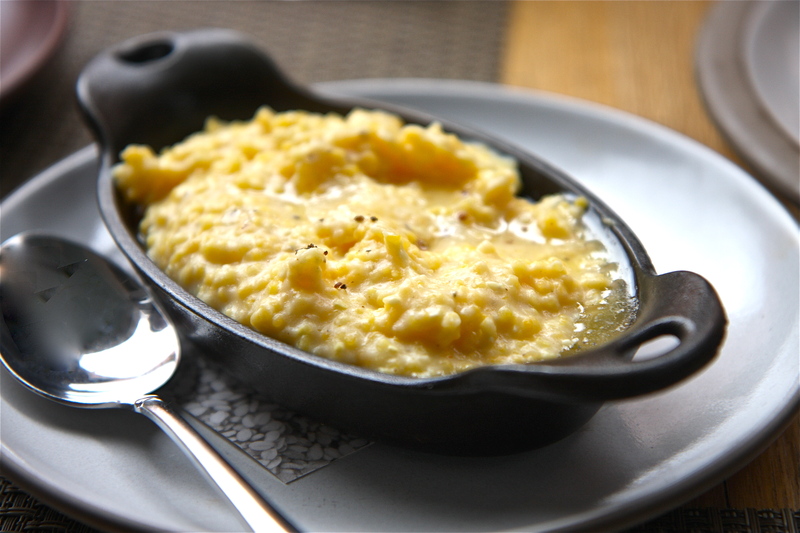 At Husk we savored a beautiful serving of yellow Anson Mills grits, creamy, rich, hearty, a little coarse (just how I like them) and happily doused with butter. 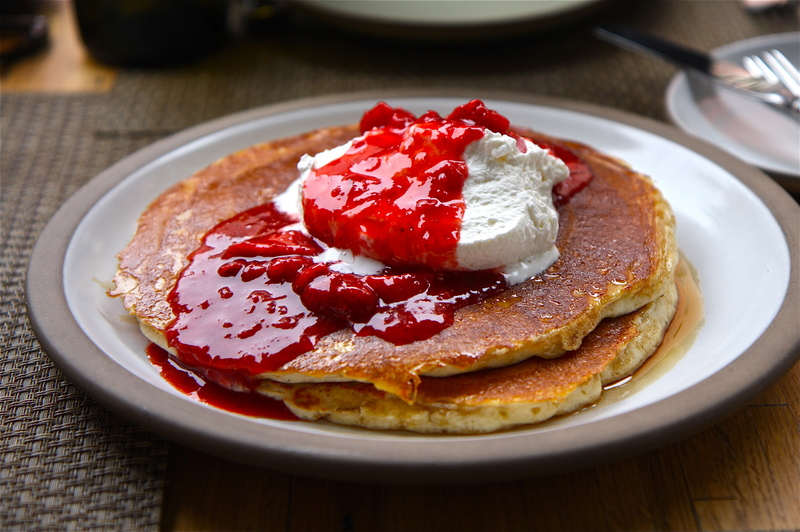 Cruze Family buttermilk pancakes as wide as the plate came fluffy and moist, cooked evenly through to the center for that same delicious first and last bite, with a trio of sweets to brighten the palate- candy red Florida strawberry compote, vanilla whipped cream and Virginia maple syrup. It was a peaceful and warm Sunday morning in downtown Charleston when we had this meal, a brunch to remember over endless laughs and good conversation with like-palated friends. Southern food, we were learning that weekend, through other meals at McCrady’s, Townhouse and Scott’s BBQ, is a tradition steeped in an extraordinary history of labor and love. What a thrill to be able to nourish my soul with the flavors of the South (bacon, grits, fried chicken and pig ears!) and the essence of Brock’s soul food. 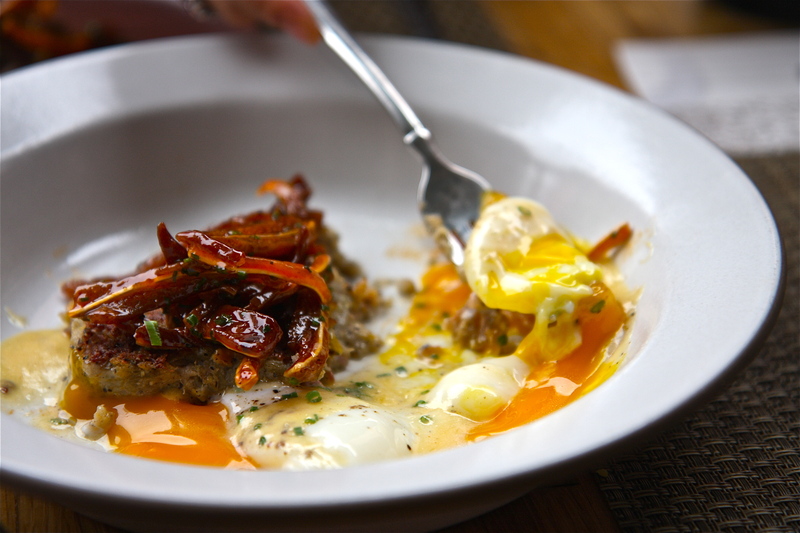 This brunch at Husk is a meal that I will always- always– remember, one of the best darn meals that I’ve ever had, cooked with love, served with care and finished off with a slice of pecan pie. Random trivia: No one is quite sure of the true origins of Chicken & Waffles, one commonly thought to be of Southern origin, but food historians trace it back to 1938 at Wells Supper Club in Jazz Age Harlem.